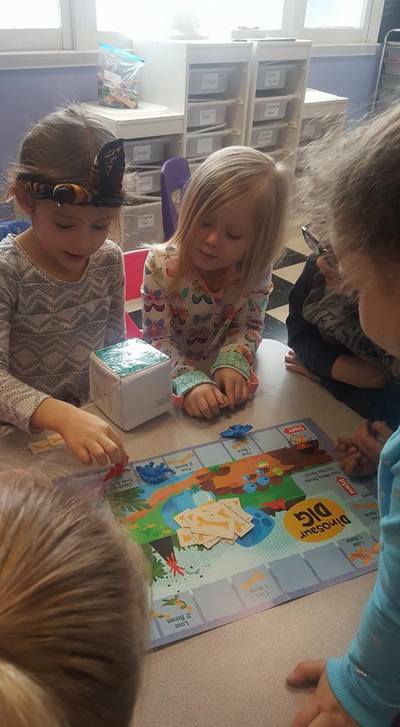 Anyone that has read our class blog for very long knows I HEART games that teach!!! 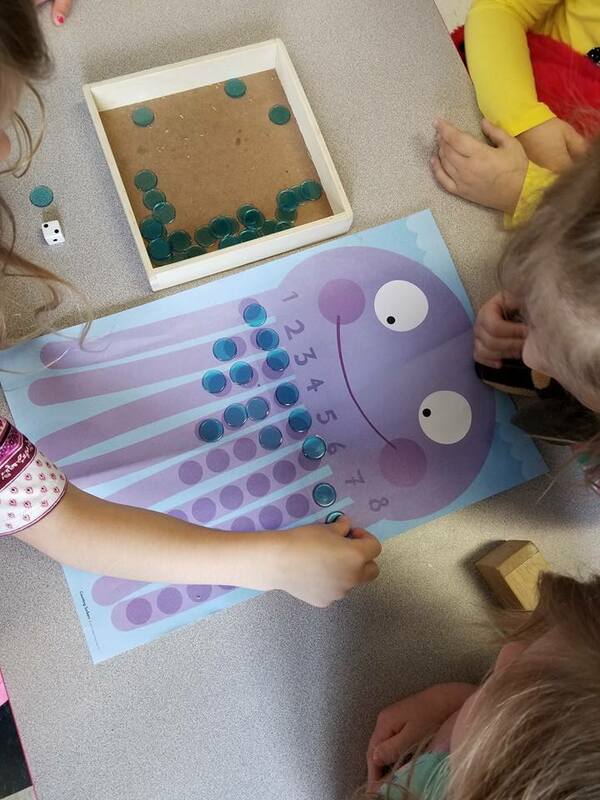 This sweet octopus counting game is no exception!! Just look at his happy face! How couldn't you not be drawn right in and want to play with him?!? 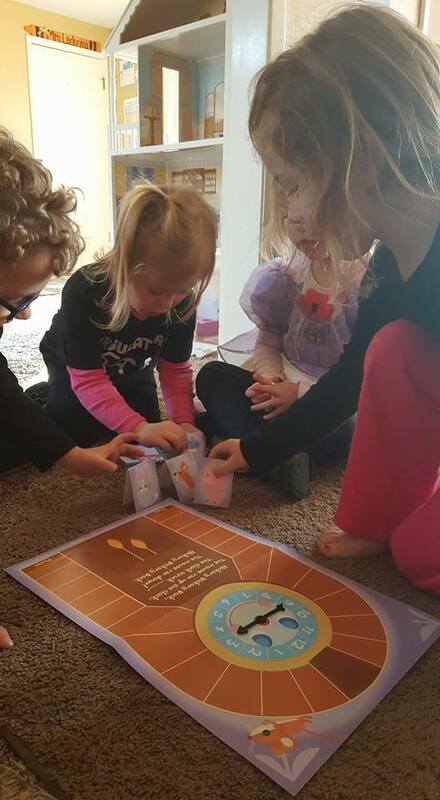 Another thing I LOVE about the games we receive from Mother Goose Time is that they are not of a competitive nature, but rather they promote teamwork and a "We ALL win together" attitude. 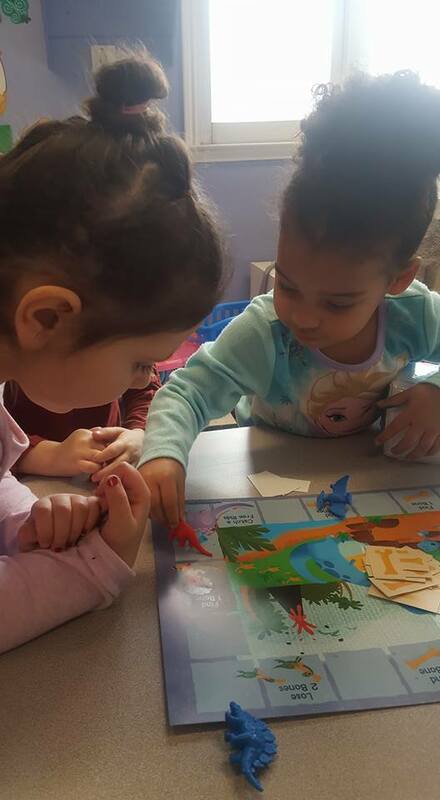 The children have to work together, take turns, make observations, create solutions, and practice self regulation to reach a common end goal of "winning the game." I had one child roll the dice and the other child count out the correct number of tabs. 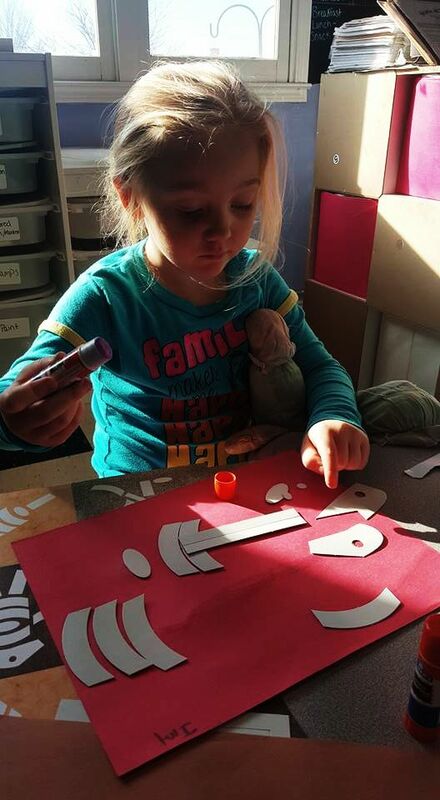 Then the child that rolled was able to place the tabs onto the octopus. 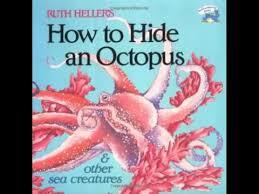 Then the children would switch rolls until the octopus was full. 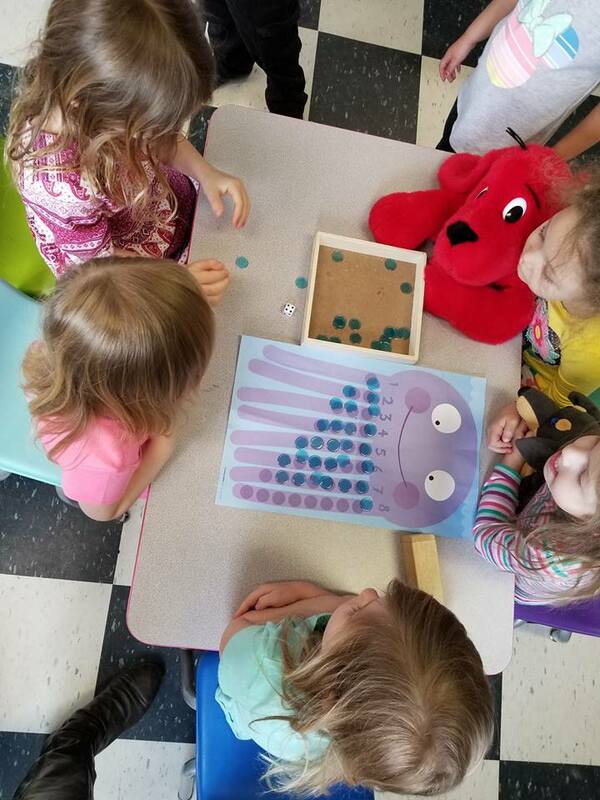 The children would then count all the tabs together and tally how many rolls of the dice it took to reach the end. The fewer rolls the better, but in the end, they reached the last place on the last tentacle and it was HOOOORAYS all around!! 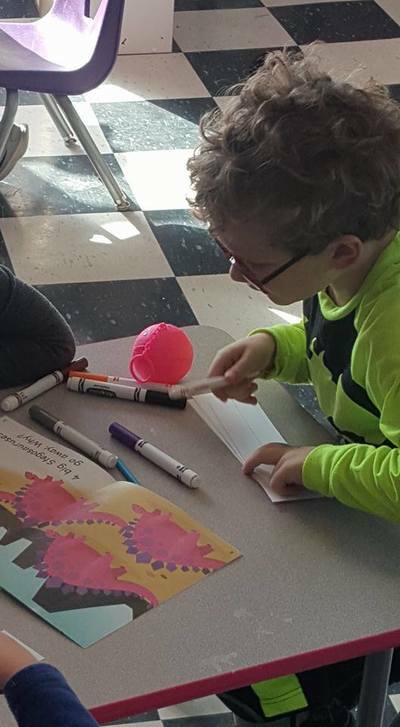 Our Ocean Commotion month has been filled with math opportunities. Our educational partners at Mother Goose Time provided us with an ocean themed matching game with real pictures of ocean animals, and these beautiful shells to count to the number 15 and 16 with (our focus number this month). We used these little ocean gems to match sizes, order from largest to smalled and reverse, count from 1-16 (and beyond since we had about 40 of them), group into 2, 3, 4, and 5's for skip counting and to imagine what types of animals called them home (not math, but some fun physical science!). Giving children objects to hold, count, order, and compare is math and science in real time that little minds can concretely make meaningful connections with. 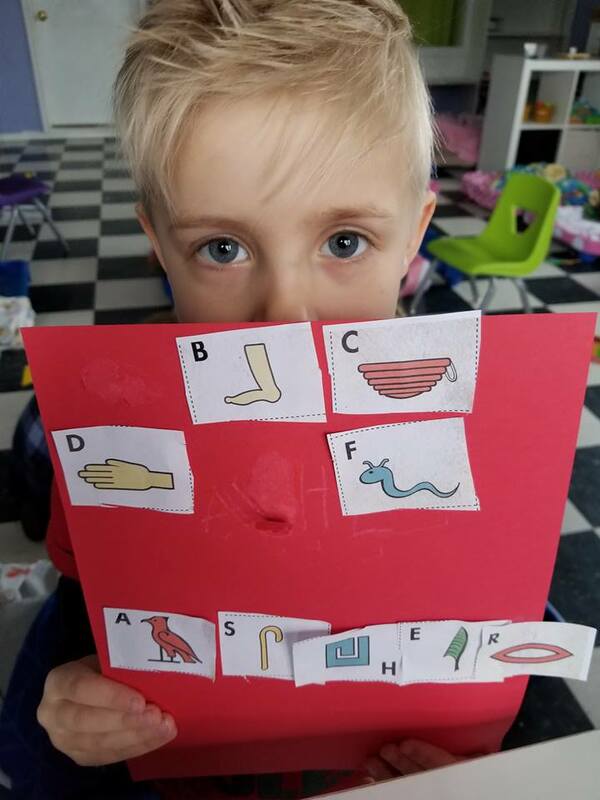 Www.education.com supports this method, " In an attempt to foster their child’s academic development, many well meaning parents may be tempted to provide flash cards as an initial learning tool. This is not the best method for teaching young children math skills with understanding, says Grace Davila Coates, Program Director of Family Math (Lawrence Hall of Science, University of California at Berkeley) and co-author of Family Math for Young Children. 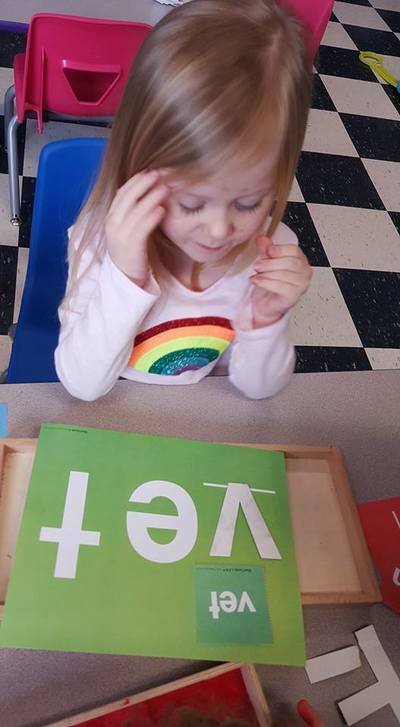 “Many three-year-olds may be able to identify a 3, but they don’t understand what 3 means. 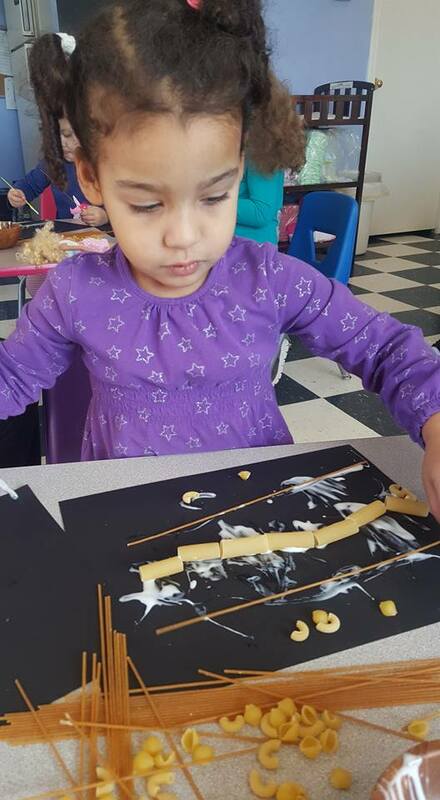 It's important for parents to understand the difference between conceptual learning and skill development," she says. 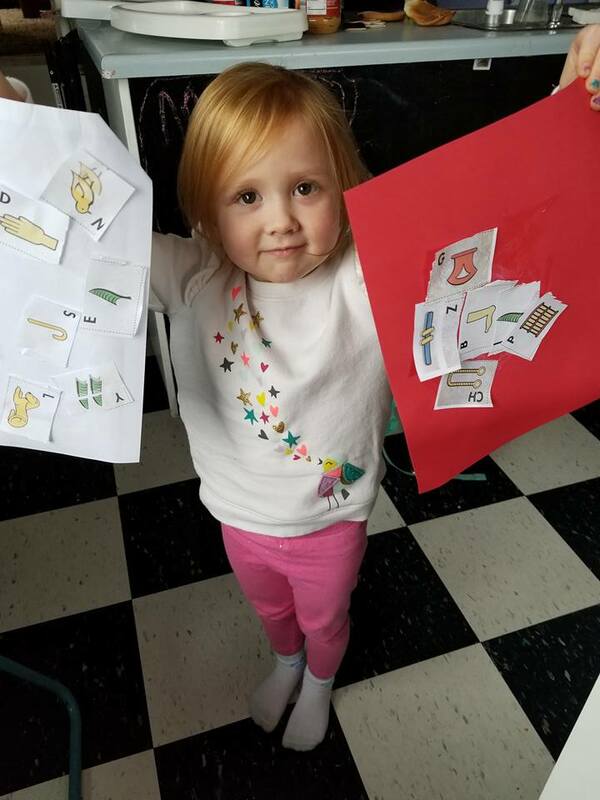 "Instead of flashcards, look for teachable moments, count things that are familiar to the child as she plays or helps you with simple chores. Counting socks, toy cars, or other toys will maintain her attention and have more meaning for her. 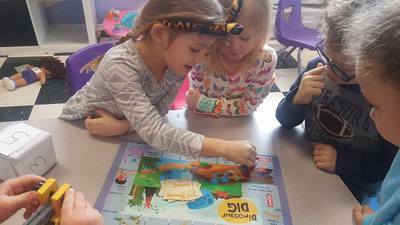 Play is learning for three and four-year olds. Following our preschooler's interests and creating environments that support those are what we do at Woolsey Academy for Young Learners everyday. Children LOVE to study oceans and the life inside of them. Shells, fish, whales, coral, water...especially the octopus! 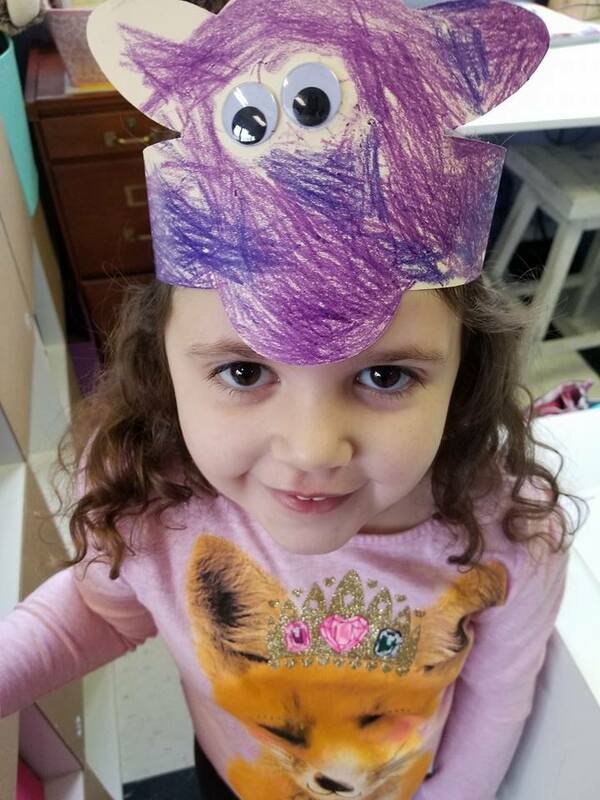 In all my years as lead "awakener" here at Woolsey Academy, the octopus ranks right up there in preschool land with the dinosaur. It has 8 arms or tentacles, it has a squishy body, it squirts black ink it has suction cups!!! What isn't to LOVE about these amazing creatures of the deep? 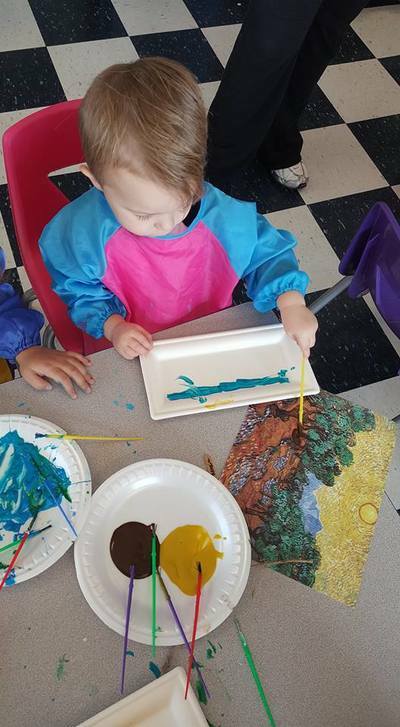 This month our educational partners at Mother Goose Time paid homage to this amazing ocean dweller with this sweet study and craft. They provided a math study counting it's arms by adding and subtracting to make 8. We added another lesson to that curing our S.T.E.A.M. 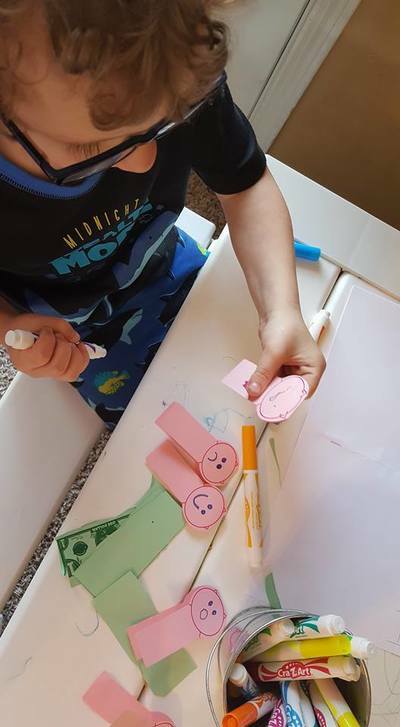 project by adding these fun round stickers to create "suckers" on the tentacles as we counted how many we added. 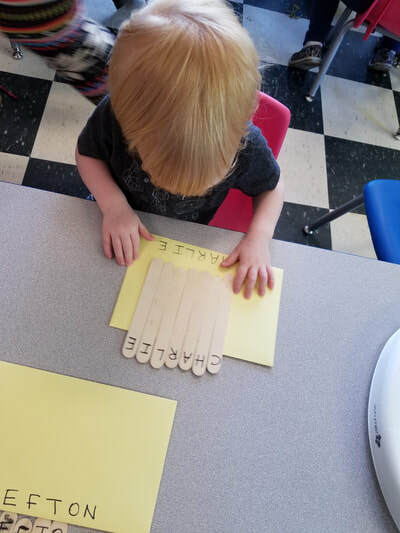 We then brought a little introduction of multiplication as we stated that, "If I have 2 suckers on each arm (8 arms total), how many do I have all together?" We counted by 2's and then we observed that we had 16! 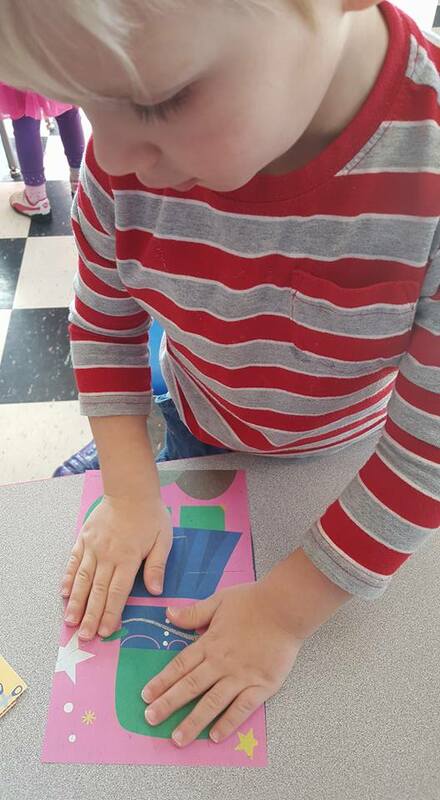 After reading the book, "How To Hide An Octopus", we pretended to be an octopus and find camouflage to hide in, on, and under. 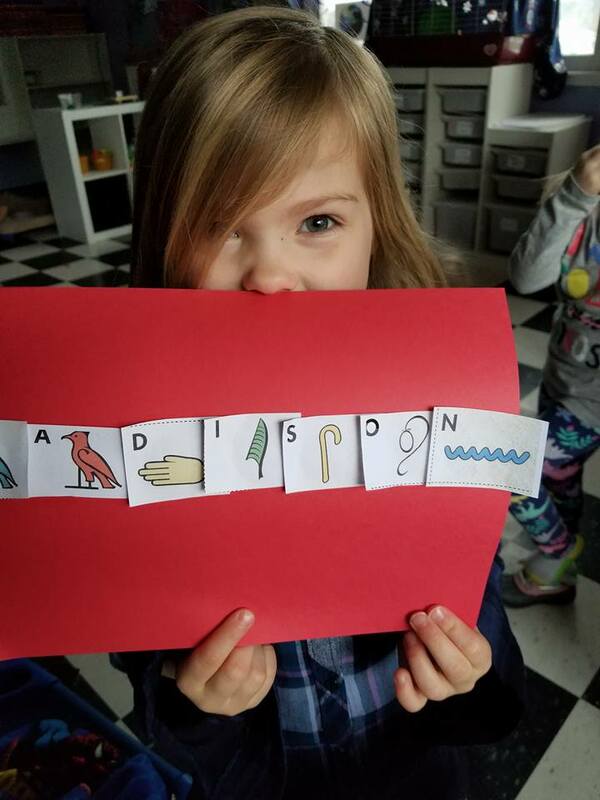 We practiced using these positional words (pre-math and language comprehension) as our older children assisted our littler ones in performing the task. This S.T.E.A.M. 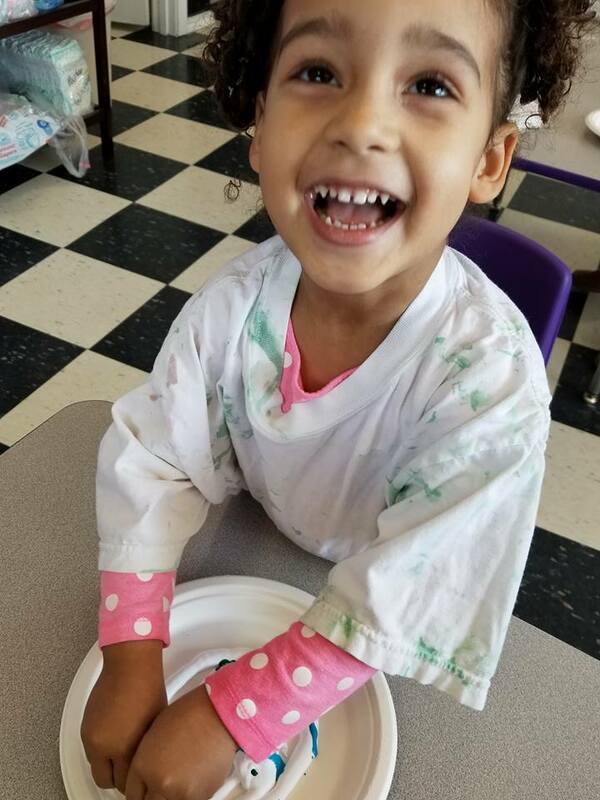 project required our little learners to practice their fine motor skills as they stuffed ribbons with their fingertips into a shower cap! 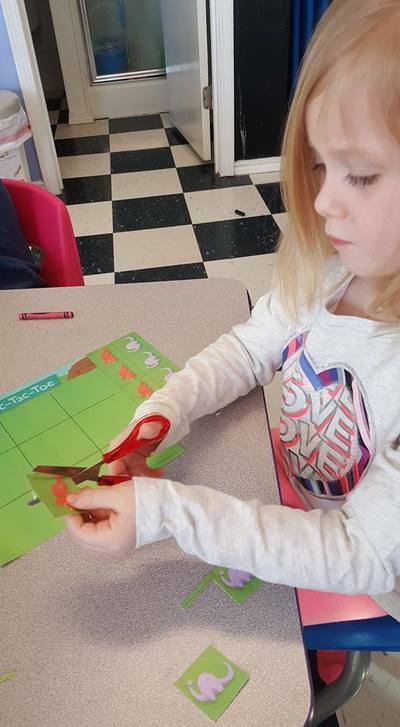 We tied off a top portion of the cap and then our preschoolers used scissors to snip eight octopus arms. The thin lightweight cap plastic was PERFECT for giving the impression of an octopus swimming through the water as it went up and down. 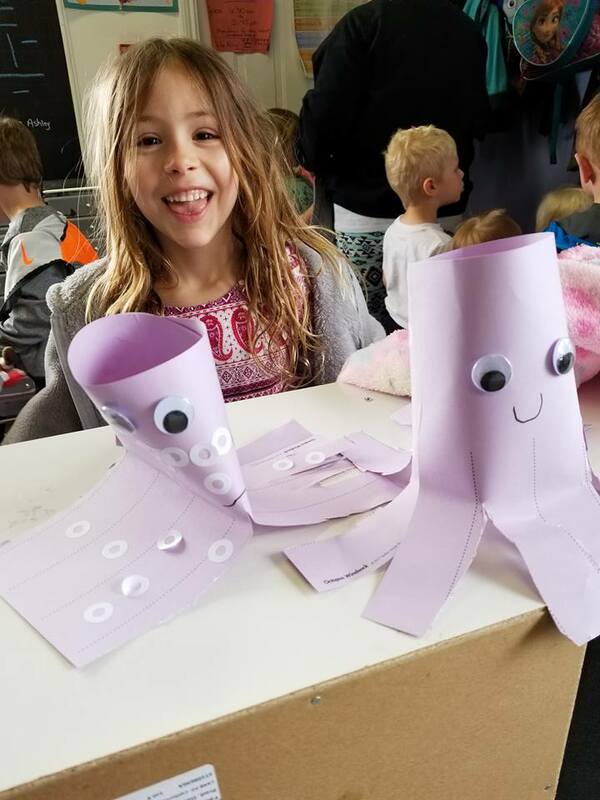 This project, provided by Mother Goose Time in conjunction with our octopus studies was a fantastic "Make and Take" activity for our children to excitedly share with their families as they reconnected and discussed everything they learned in their day with us at www.woolseyacademy.com. Commotion on the ocean! 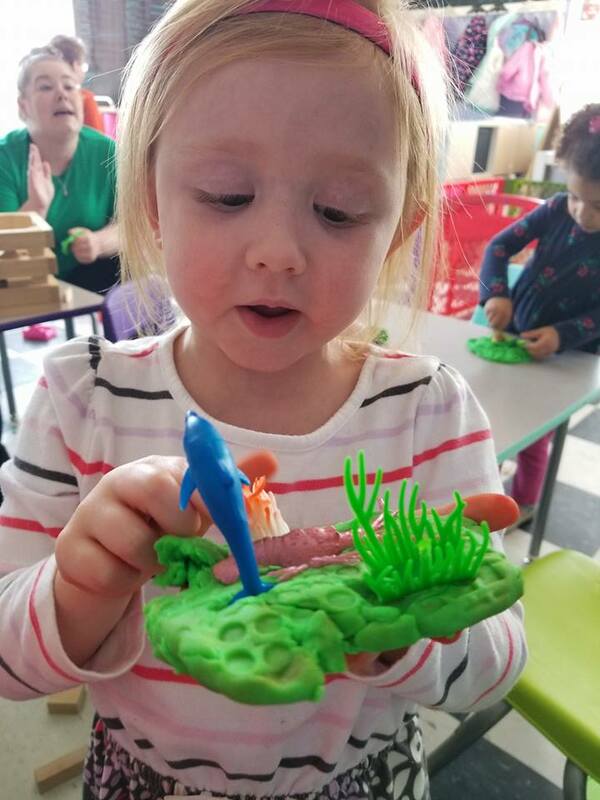 Our preschoolers LOVE ocean animals so we decided to spend a few weeks learning about the creatures, coral reefs, animals, and environments of the ocean. 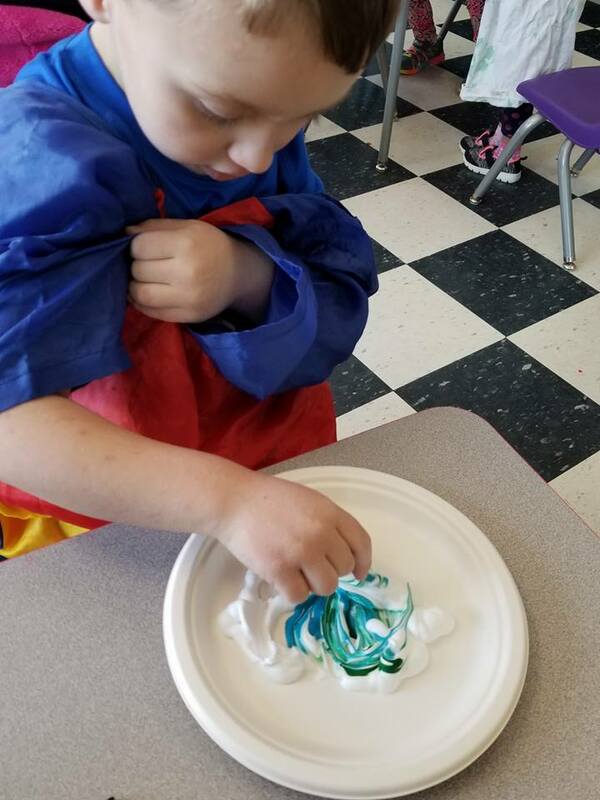 By adding sharks, fish, whales, jellyfish, eels, starfish, and shells to our dough, moon sand, and water beads, we created several science and sensory stations to capture the imaginations of our little learners. ​Of course it is EASY to have lots of meaningful conversations stemming from these natural elements of play. When children are engaged with all their senses they are LEARNING! 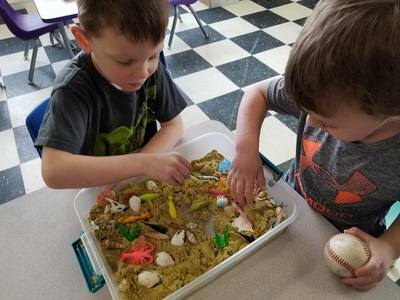 We were able to answer many questions about what types of animals were in the sand and water beads. Were they mammals or fish? Did they eat plants or other animals? 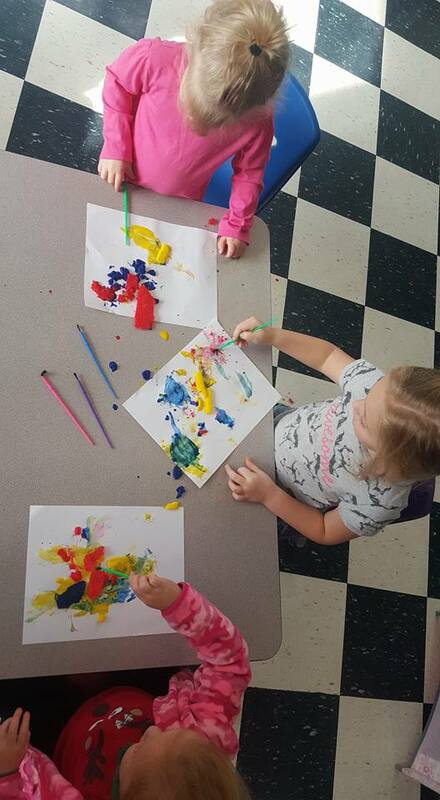 Even our littlest learners (ESPECIALLY our tiny tots) get to play and learn along side their older preschool playmates. 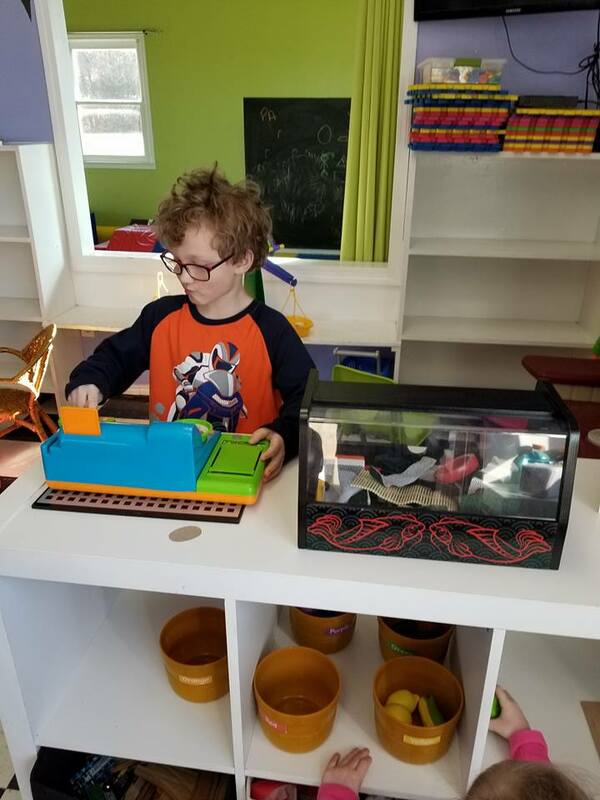 We do not separate by age, rather, we diligently work to create an inclusive environment for our students of all abilities and ages and by the looks on their faces I would say it is a grand SUCCESS!!! The importance of daily sensory play for preschool. 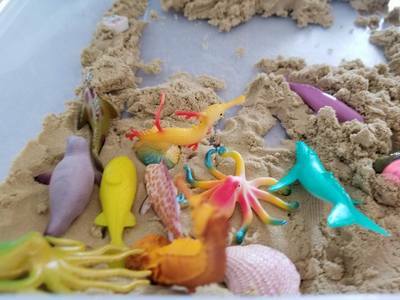 This helps children learn sensory attributes (hot, cold, sticky, dry)"
We LOVE sensory play for calming an anxious child. 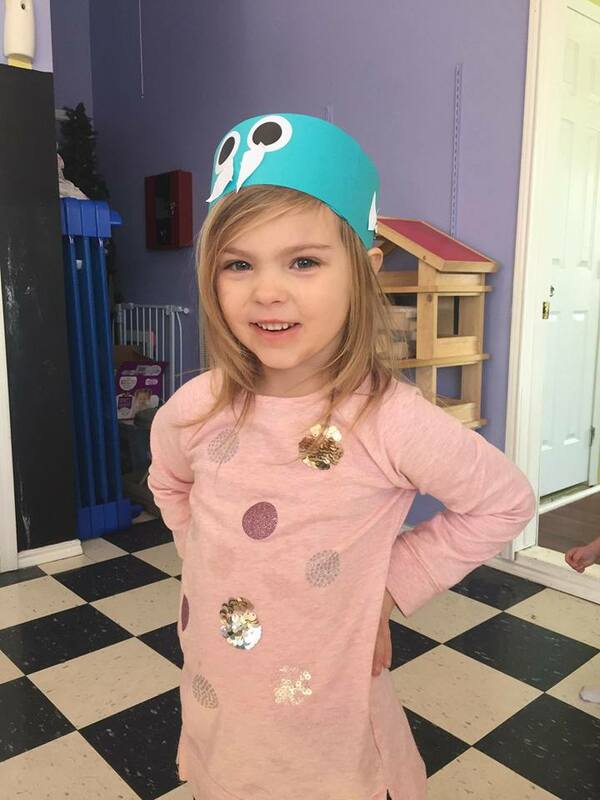 We have several children in our preschool with varying degrees and varieties of SPD's. 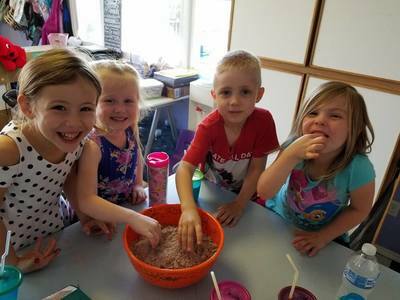 Water beads, sand, and dough's give these children a calm focus and allow them ample self-directed play time's that provide them with total control of themselves and quiet play practice with others. 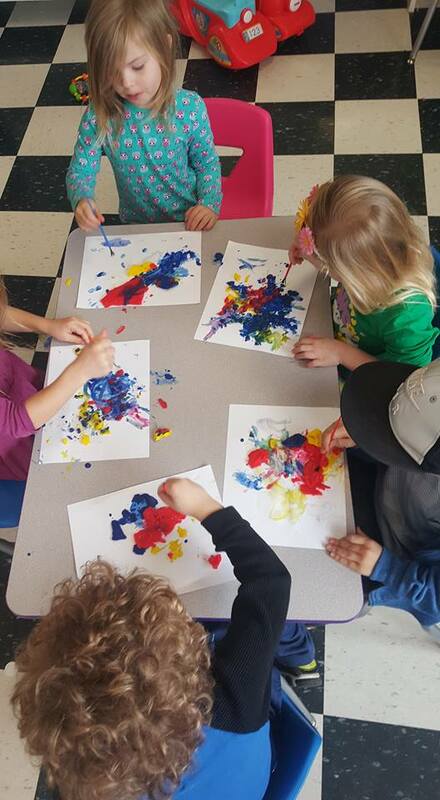 We also have added lots of math and language arts with our Ocean Commotion studies with our curriculum partners at Mother Goose Time! See our following posts for how simple shells provide fun hands-on opportunities for matching, adding, subtracting, and sorting here at Woolsey Academy! 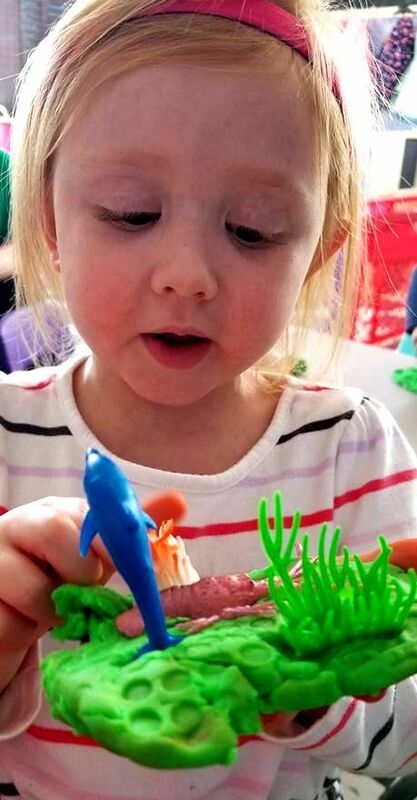 We love animals of all varieties, but if you were to ask a preschooler what their FAVORITE animals are to learn about it would be sharks and dinosaurs EVERYTIME! This above pic is no exception! 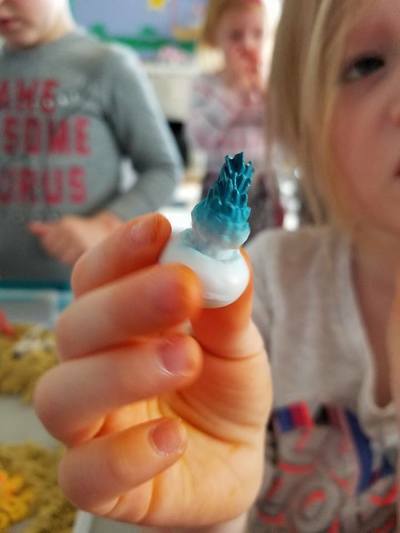 We used our homemade dough recipe this month and added a bit of blue and a bit of yellow to make hues of blues and greens just like the ocean for our creatures to dwell in. 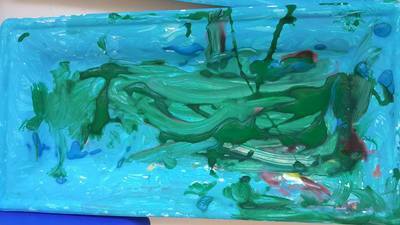 This became a cave, an ocean, a wave, a boat, a beach, and more. 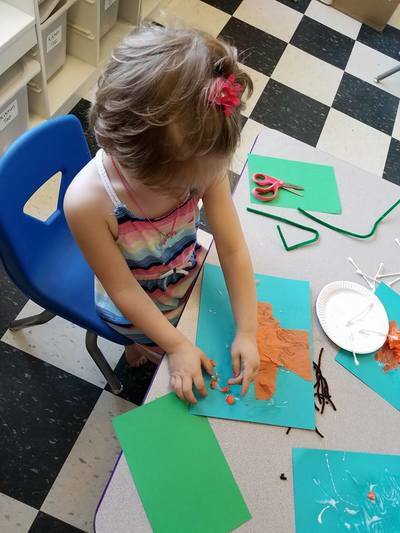 Their immense imaginations allow for unlimited potential with the proper educational materials supporting them. 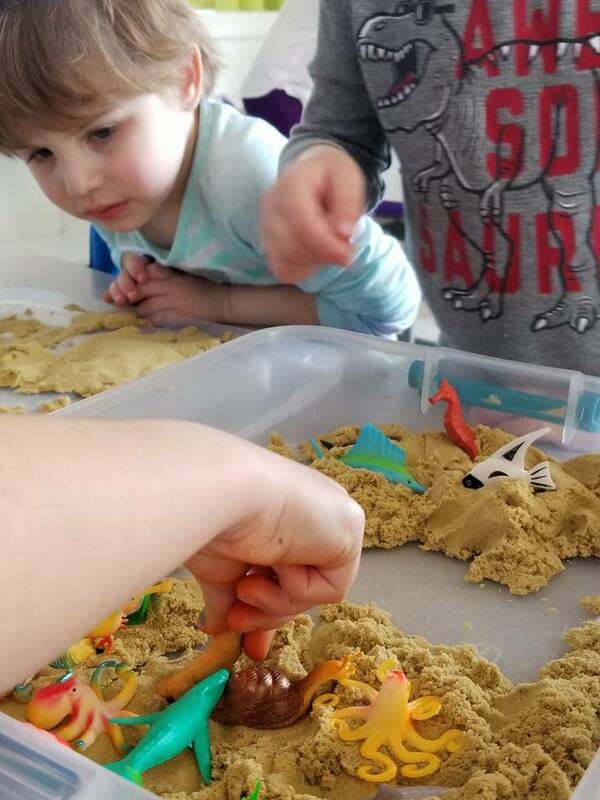 We added some brown moon-sand and made indoor sand castles and moats. 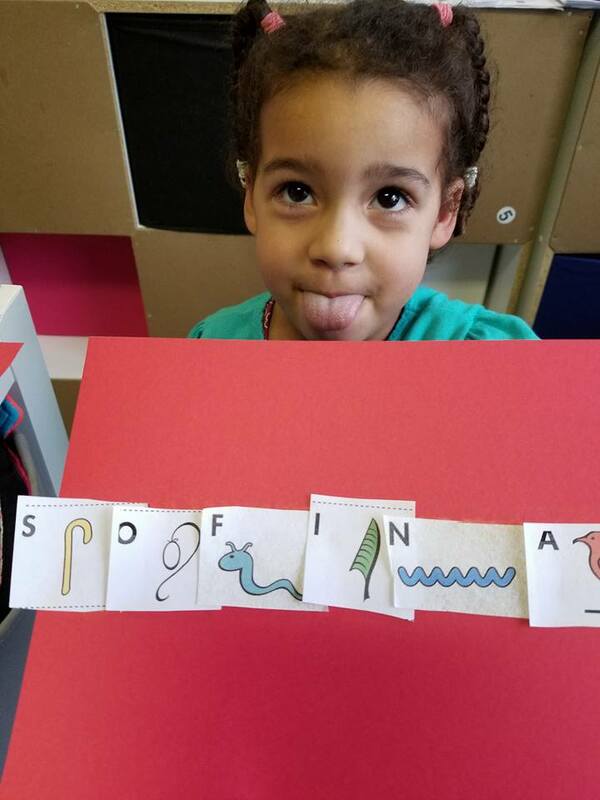 We added water beads to squish and for our magnetic alphabet fish to "swim" in! 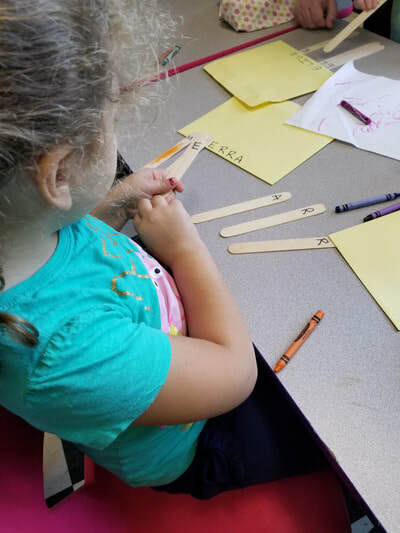 We used our letter stamps, scissors, and tongs in the sand to practice our fine motor skills for picking up pencils properly and our alphabet stencils to press and recognize in the sand. The sea anemone lives down in the bottom of the sea. The clownfish swims all day all day, safe in anemone! This sweet tune is a Woolsey Academy original! 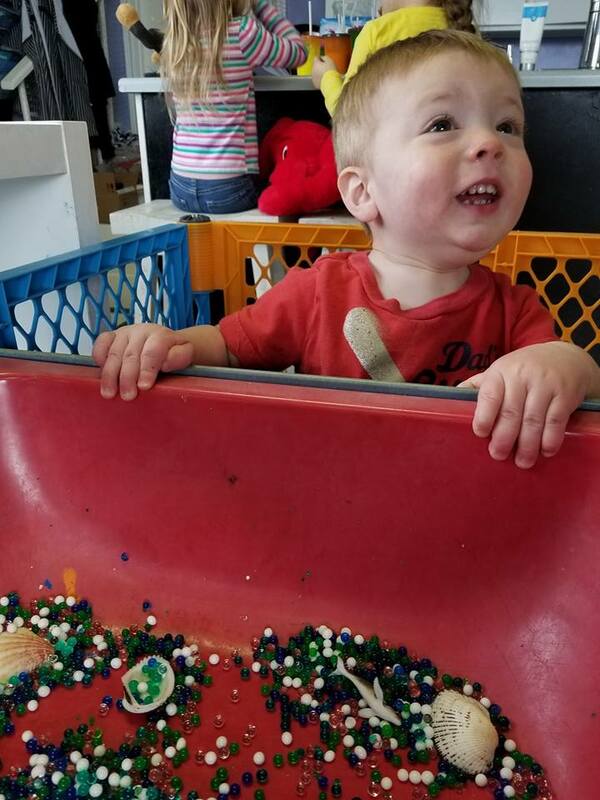 We made up this fun finger play song to go along with our clownfish learning theme. We studied the clownfish and we learned that it has a "safe place" in the sea anemone. 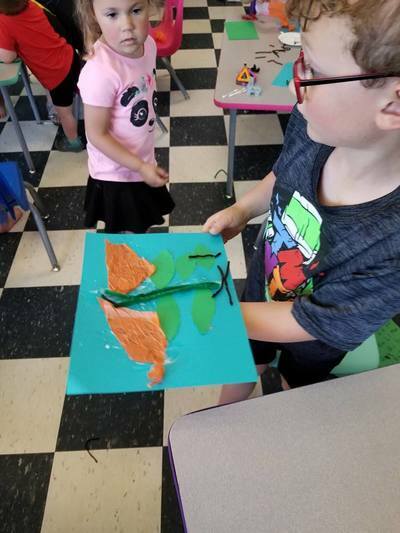 We discovered that the clownfish gets used to the anemone stings during its life and then it does not hurt anymore so it can hide safely in anemone from its predators! What an AMAZING superpower!!! 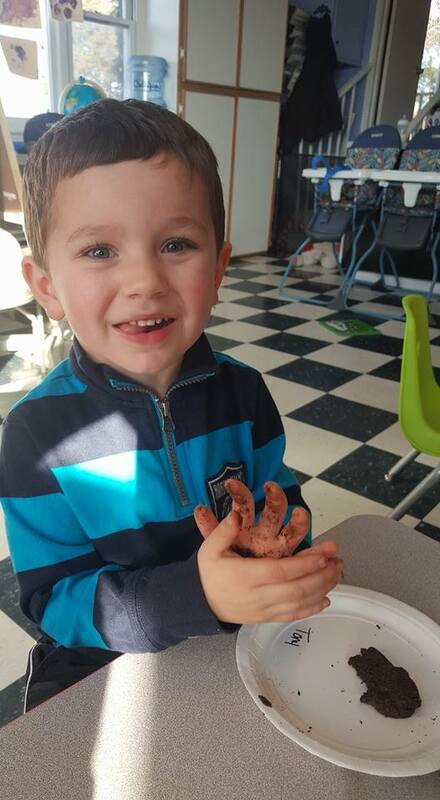 Songs, finger plays, animal recognition, habitats, and special animal powers are all part of a fun filled day at Woolsey Academy for our little learners!! As always, we wish you well and we hope you get to play today. This week we began by learning that all planets fall into one of two categories. 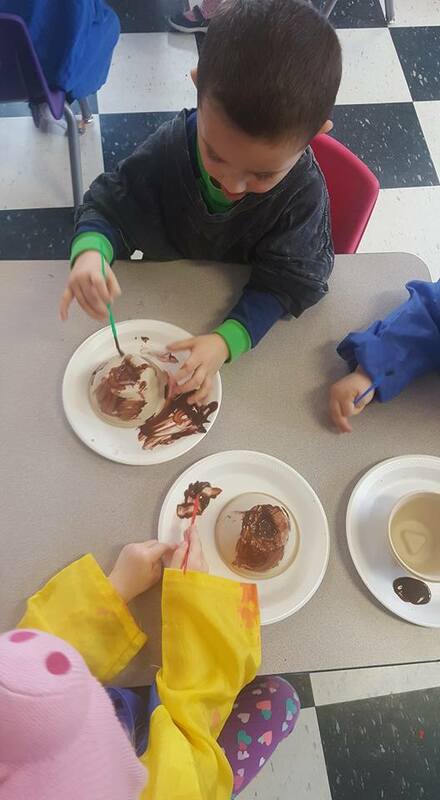 They are all either gas planets or rock planets and this week we focused on the rock planets. But first....we had to learn one of my ALL TIME FAVORITE space songs. It is from the old Blue's Clues shows. This one never gets old...just take a look and a listen! 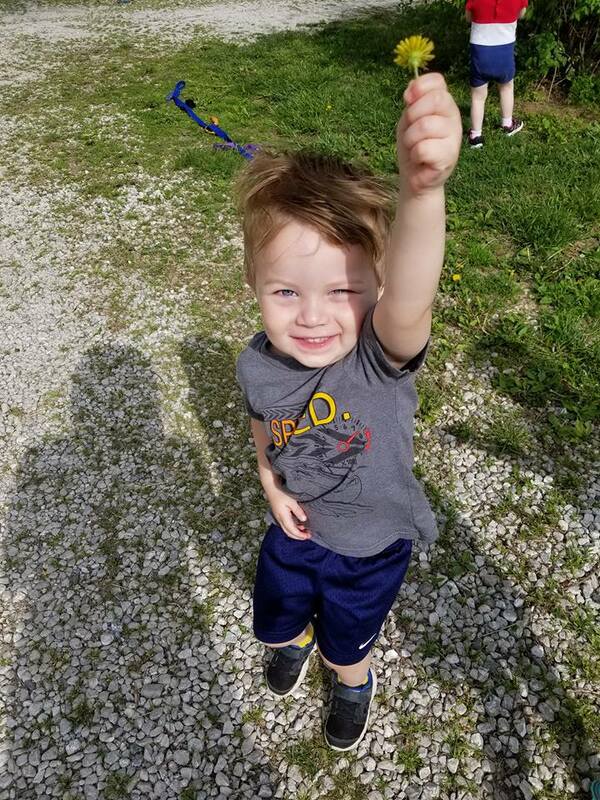 One of our darling astronauts! 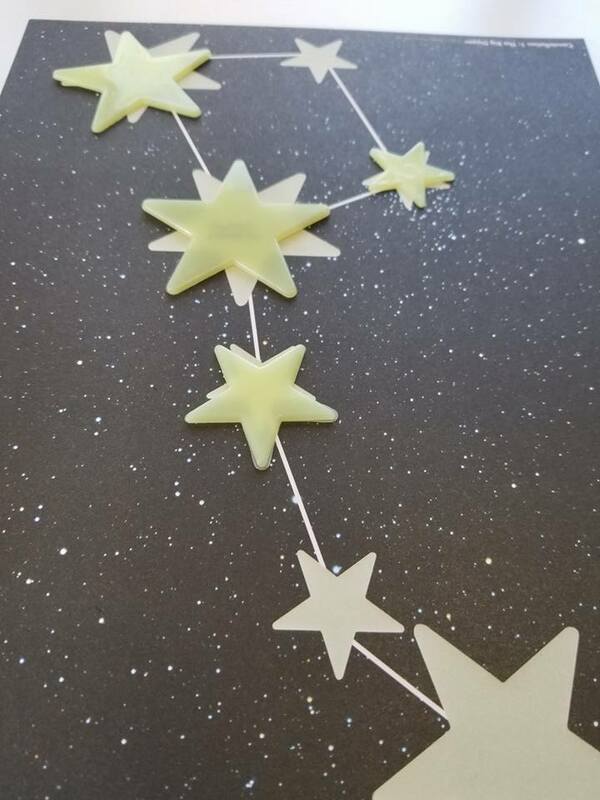 Venus is the brightest planet! Earth's home to me and YOU!! Mars is the red one, and Jupiter's most wide. Saturn's got those icy rings and Uranus spins on it's side! Neptune's really windy, and Pluto's very small (yes, we know it is now classified as a dwarf planet!!). Well we wanted to name the planets and now we've named them all!!" 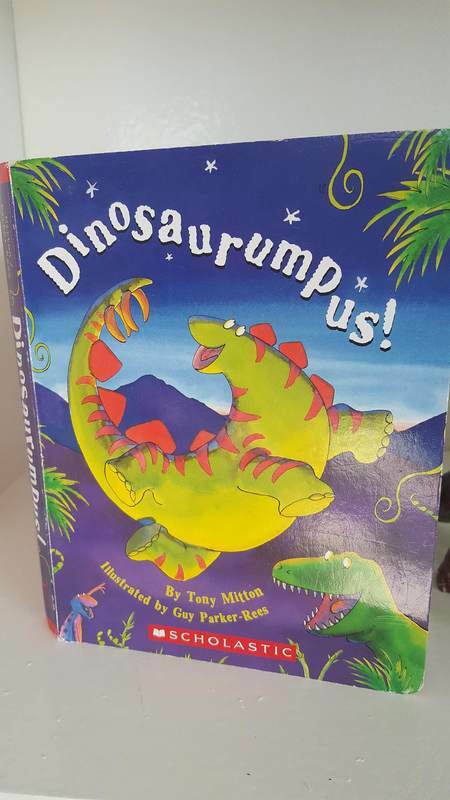 One of the things I LOVE about studying space with preschooler's is that there is a WEALTH of great children's literature on the subject like this one! We were immersed in space words like "Sun", "Earth" and "Mars" with our emergent reader book from Mother Goose Time! I love the word pointers that emphasize our site words like "look", "up", and "and". 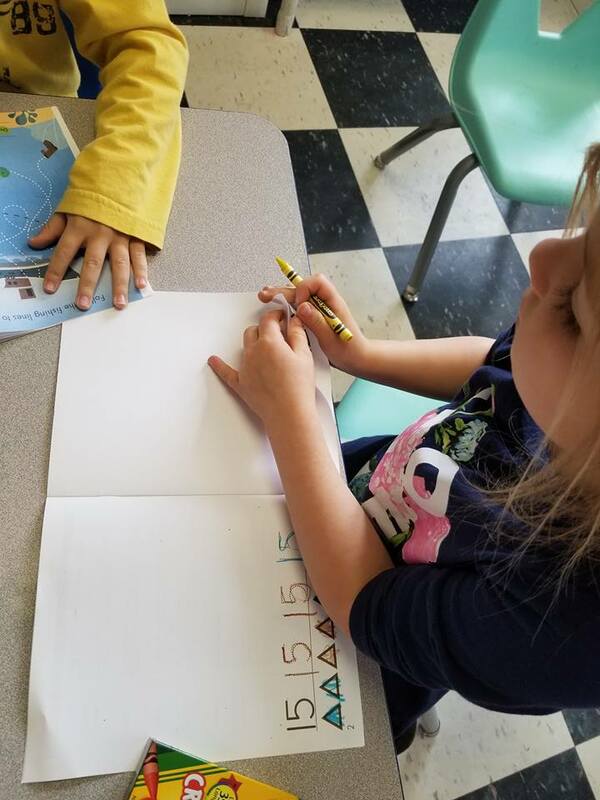 They draw attention to our special words and make it easy for our little learners to find their site words in these emergent readers and in our other space books too. 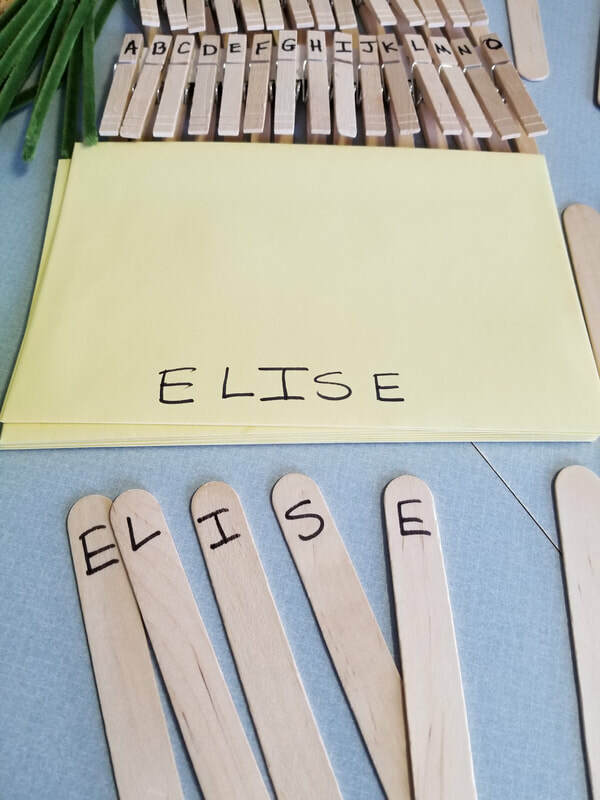 We use them to write the words and turn it into a matching game. 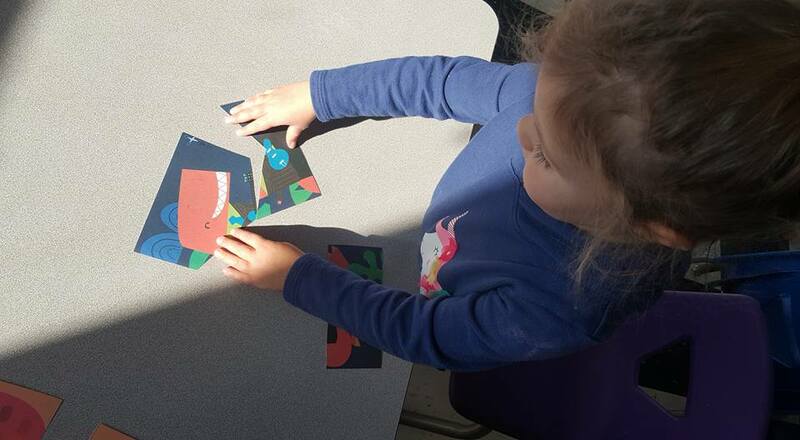 In addition to stories and songs we received some new Tangram puzzles from our curriculum partners at Mother Goose Time with a special space theme. 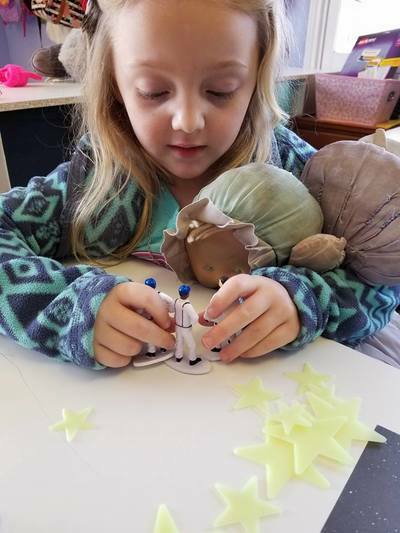 We built rockets, a space station, the Sun, and astronauts using diamonds, squares, circles,triangles, and hexagons! 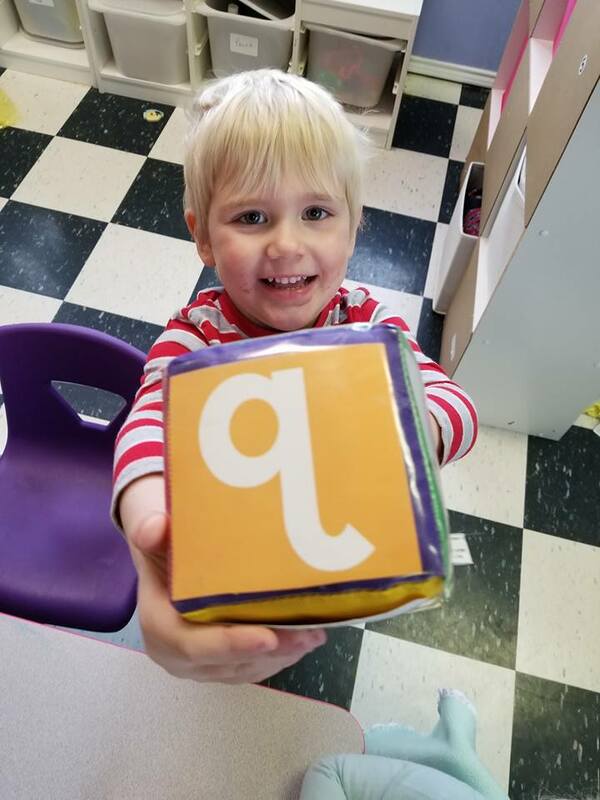 Our preschoolers played this again and again and it is the perfect way to teach shapes minus the flashcards! 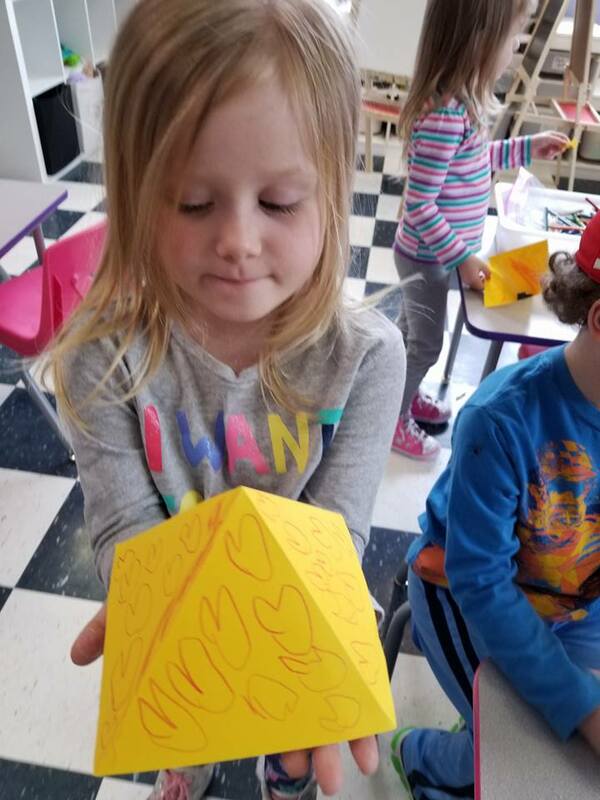 We observed how we can use shapes to make pictures of things we recognize!! Tangram puzzles are amazing for developing a math and logic minds and we utilize them daily here at Woolsey Academy. 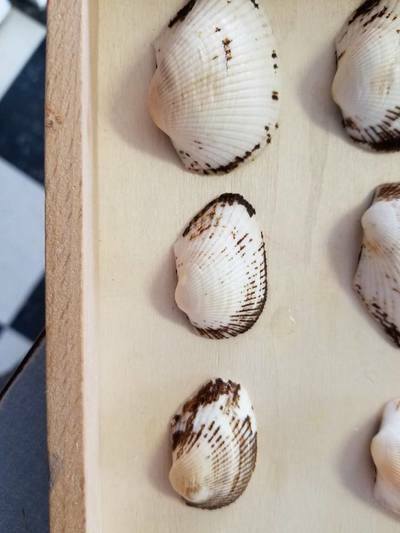 These seemingly simple puzzles are full of potential and possibilities. 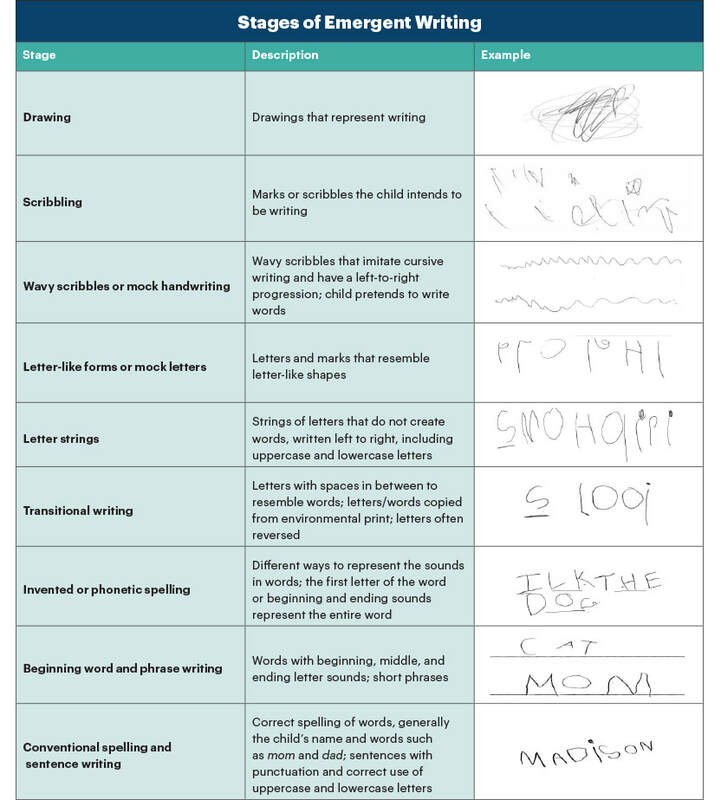 They are easily configured to any topic and can be reused and redesigned as the child's logic grows. 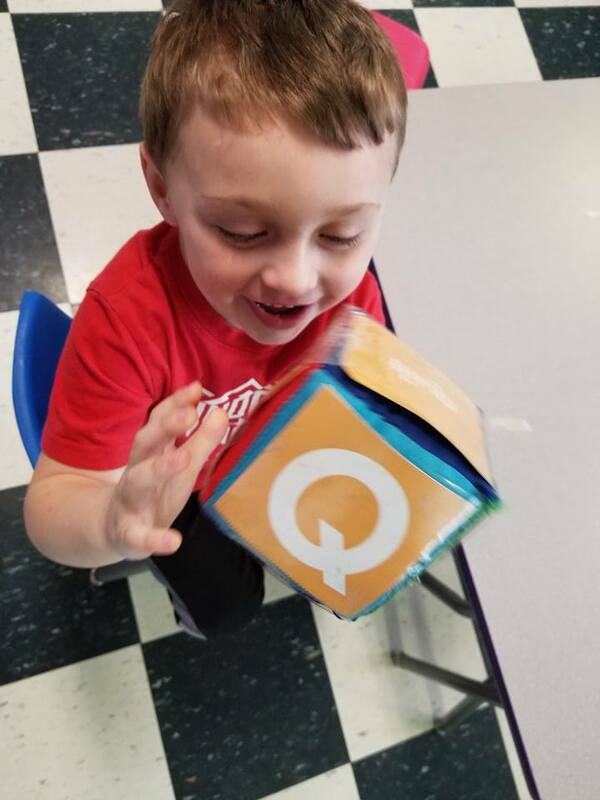 Math, Science, Music, Movement, and Literature! 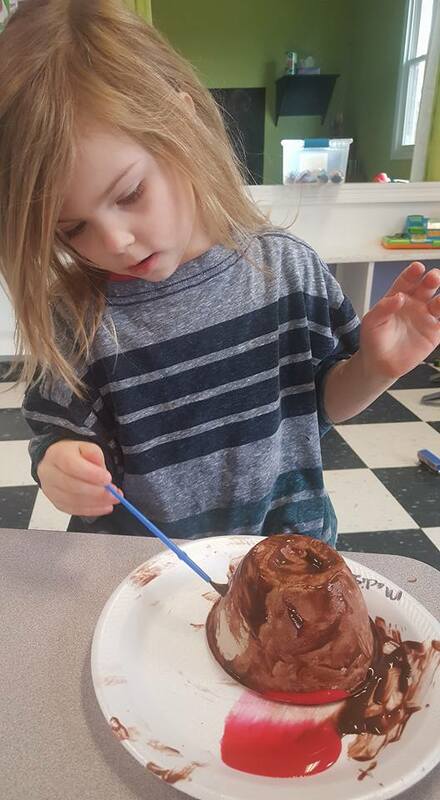 This was a great beginning to our week studying the rock planets! Every once in a while a wonderful book crosses my path that explains complex concepts with ease. 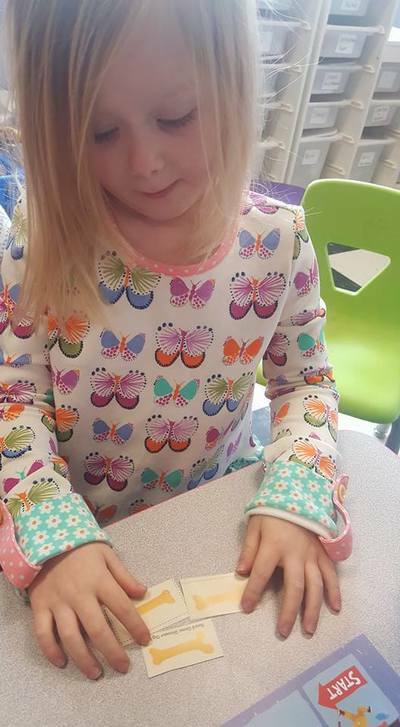 During our cultural study with Mother Goose Time's, "It's a Small World" we are observing peoples, traditions, foods, and clothes of different cultures around the world. It is giving us lots of opportunity to discuss what makes us similar and unique! "What If The Zebras Lost Their Stripes," by John Reitano deals with the topic of racism with childlike innocence. 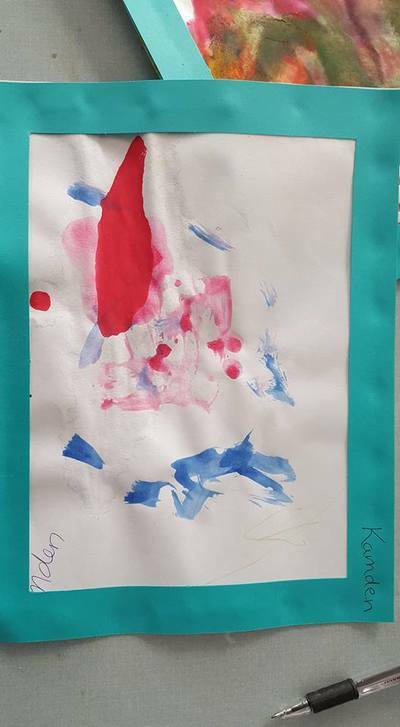 One of the things I LOVE about small children is that they don't even know to notice skin tone as something that makes them different from another anyway. They will excitedly relay to us how "My fwiend and me look JUST alike, Ms. Donna!!" because they are both in ponytails or they both have pink shoes. Small children only "hate" when someone takes their favorite doll or gets to "their" swing first. "I HATE 'dem, Ms. Donna!" to which we are able to reply, "You may be upset that you someone took your toy, but let's work together to fix it!" 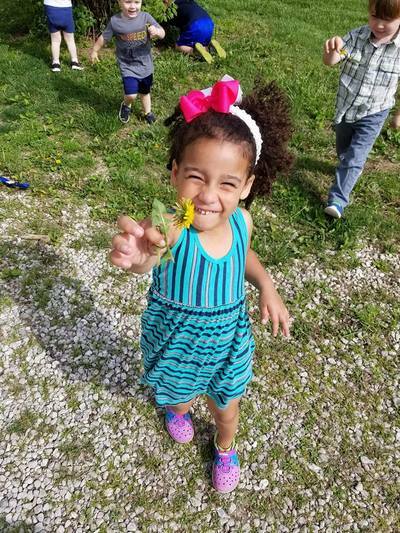 Children readily see past the surface and take note of acts of kindness, smiles, and silly moments shared. When a child does point out someone in a book with features or tones that they consider different than themselves, we discuss it. We then move to the things we have in common with different cultures; because you know what??? If we spend too much time focusing on things that make us different, we fail to see all the unique beauty we each possess that draws us closer to one another. If we can draw any universal truth from history, it is that we are all in this together. And THAT is a concept worth teaching. While searching for new books at a local outlet I came across what, at first glance, was a book about Zebras. "Perfect!" I thought as I quickly scooped it into my basket thinking I found a book about African animals. It was SO much more! 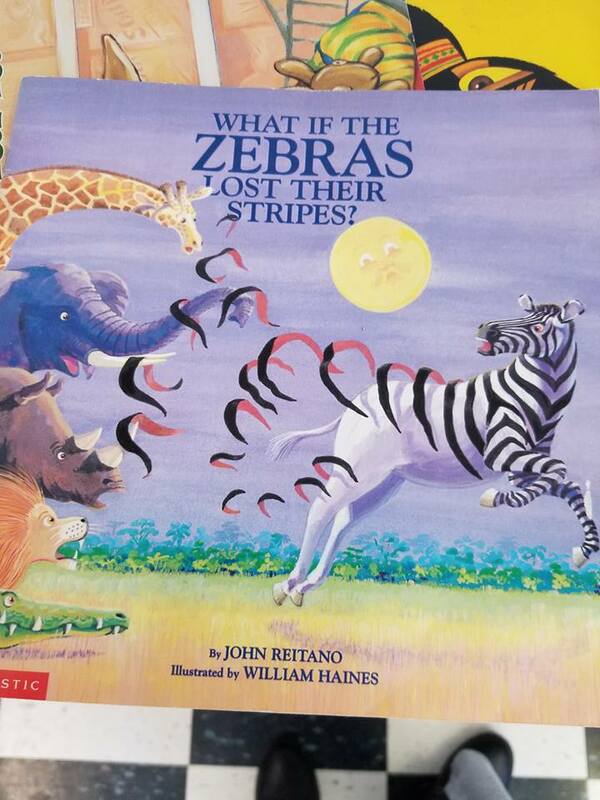 "What If Zebra's Lost Their Stripes," by John Reitano easily explains to my students how silly it is to decide if we like someone by shades of light and dark of a meek shell that embraces the soul. "What if Zebras lost their stripes, and some lost black and some lost white? Would they think that it's all right, or would Zebras start to fight?" The poignant message of this sweet book with beautiful illustrations by William Haines, and great rhyme and meter, is that the color of their fur is not their doing as it asks "What if they lost their stripes?" 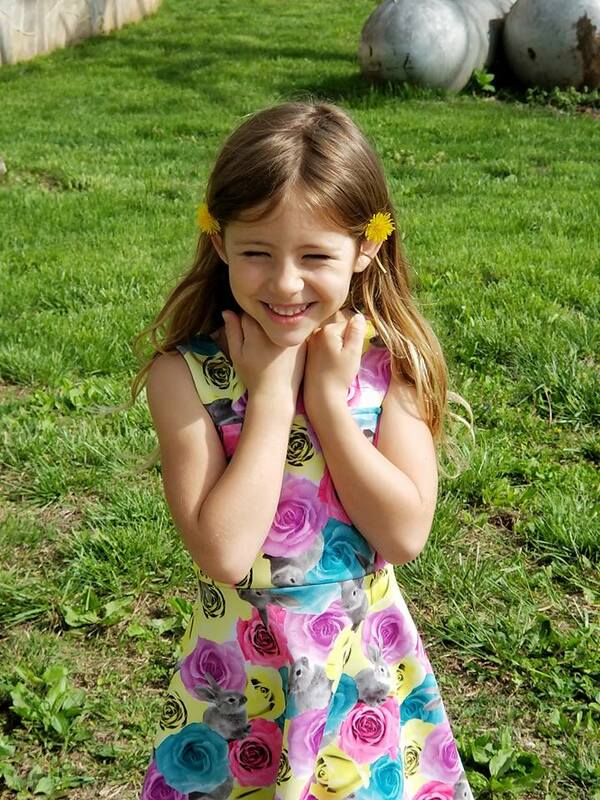 Could you even imagine teaching children anything but love? By the end we see that Zebras would be far too smart to let their colors "tear them apart!" I love CommonWorld's review of this book as they state, "If the zebras lost their stripes and became different from one another, some white and some black, would they turn and fight each other and stop living life as loving friends? 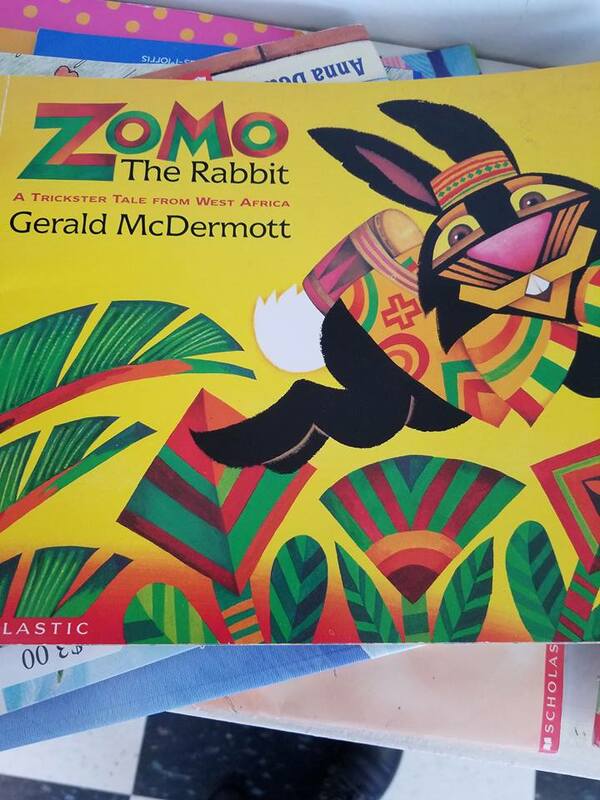 This literary jewel perfectly illustrates with ease a valuable lesson in seeing people beyond their colors, past their fur, and into their hearts. As always, I wish you well and I hope you get to play today! This beautiful little map with it's cheerful animals has drawn much attention over the past couple of weeks. Our preschoolers gravitate toward it daily and to ask questions about what they observe. The monkeys in South Africa, the buffalo in North America, and the narwhals way at the top capture their eyes. This map, along with many others, provided to us by our education partners at Mother Goose Time, have prompted conversations and questions. 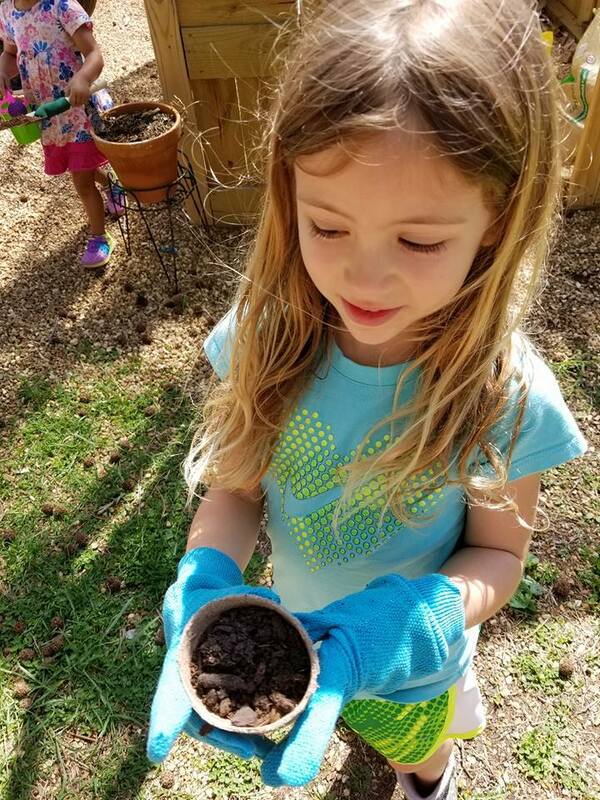 This is exciting for us teachers because we know that inquisitive little learners are engaged in organic education about the world allllll around them. We used shave cream (with close and careful observation) with blue and green to represent land and sea as we swirled and squished and mixed colors around our "globe". 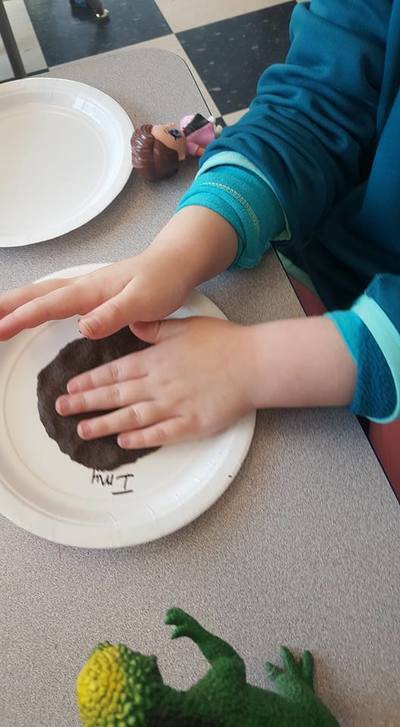 This simple little paper plate craft manufactured some, "EWWWWW!" and some "OOOHHHHHH!!!" as our students experimented with q-tips, paintbrushes, fingers, and palms. 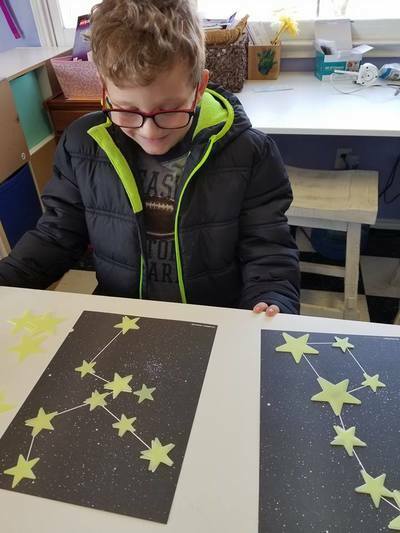 No matter their age, they ALL were knee-deep immersed in this Science and Sensory Creative Arts undertaking. 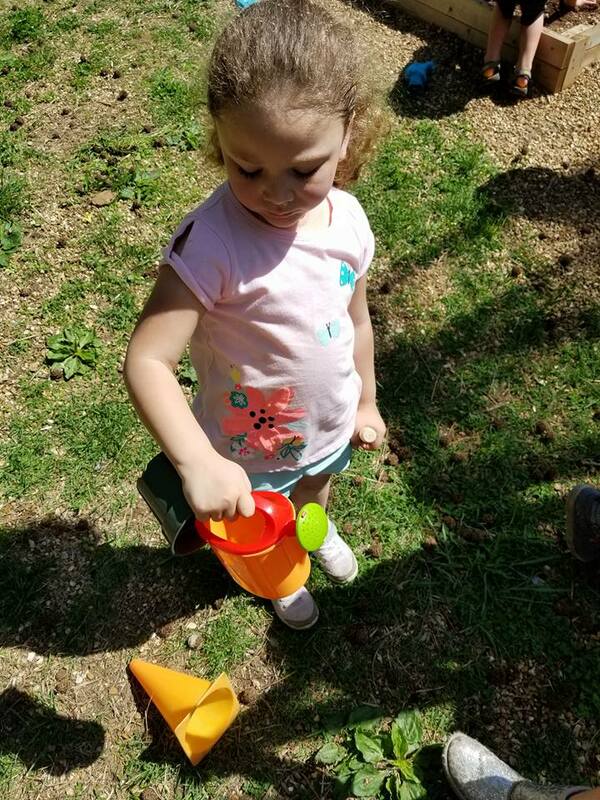 Spending our days this month focused on the places, peoples, and animals all around the world is a great big concept for little minds to comprehend, but stories and songs bring it closer to home. "What if Zebra's Lost Their Stripes" has been just one of my new favorites. 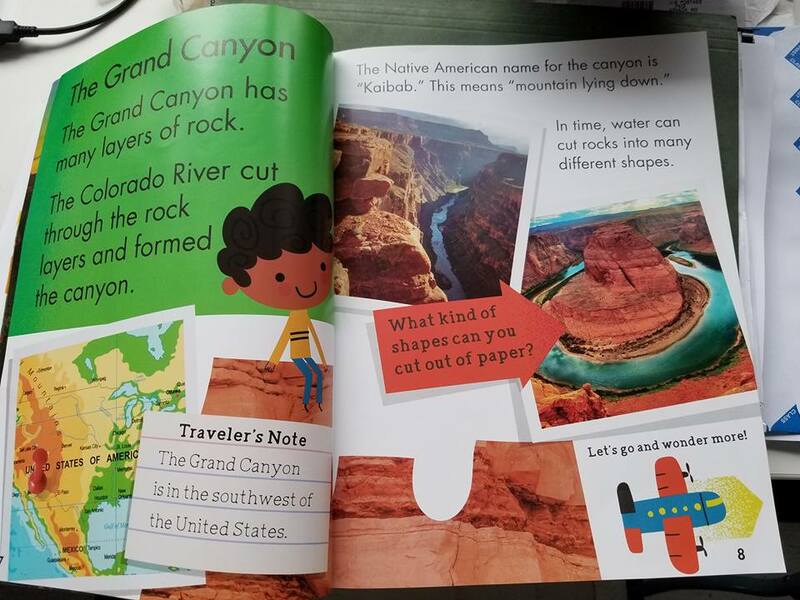 Simple books with beautiful illustrations as these are the perfect way to introduce global concepts. Further, providing rich reading experiences paves the pathways for success as children become emergent readers themselves. 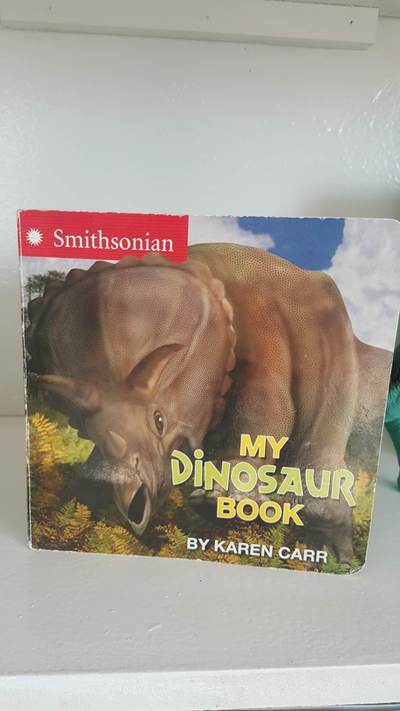 This begins at birth and we, as educators, build foundations with books such as these with meaningful content that can be connected to real life. Asking questions during reading "helps children connect the story with their own lives or that help them to compare the book with other books that they have read. 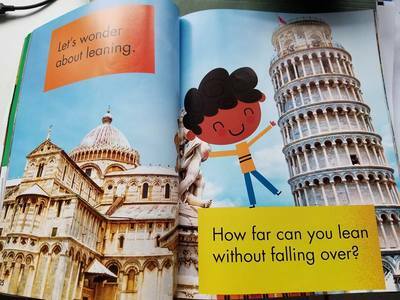 Ask questions that help the children to notice what is in the book and ask them to predict what happens next." 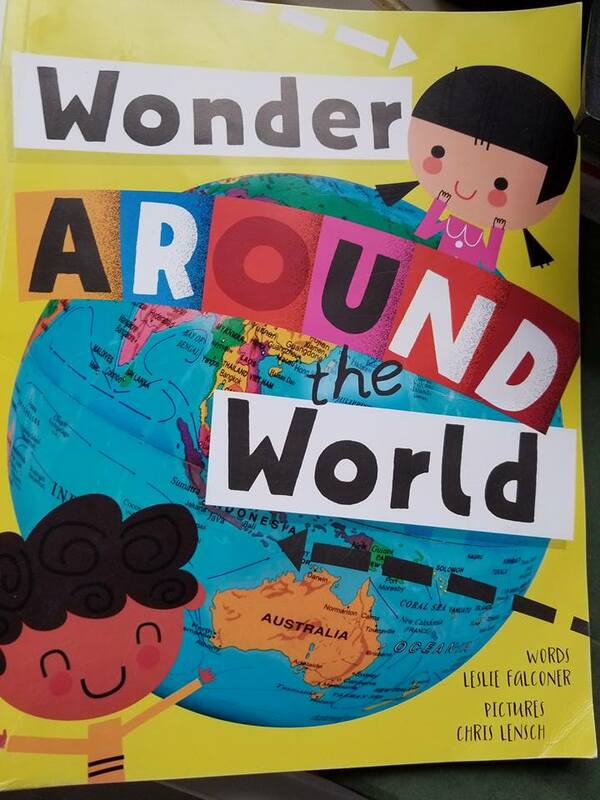 Wonder Around The World does just that. It provides many opporntunities for questions and follow up as it asks, "What will we wonder next?" Music and Movement, Rhythm and Rhyme! 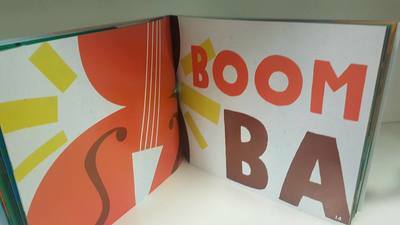 Singing familiar songs to instruments we made is even more fun! We made these sweet little drums as part of our "Africa" study and then we sat circle style while tapping to Twinkle, Twinkle, Little Star! We observed that our drums were cylinders and once we glued the tops on they made a wonderful sound. 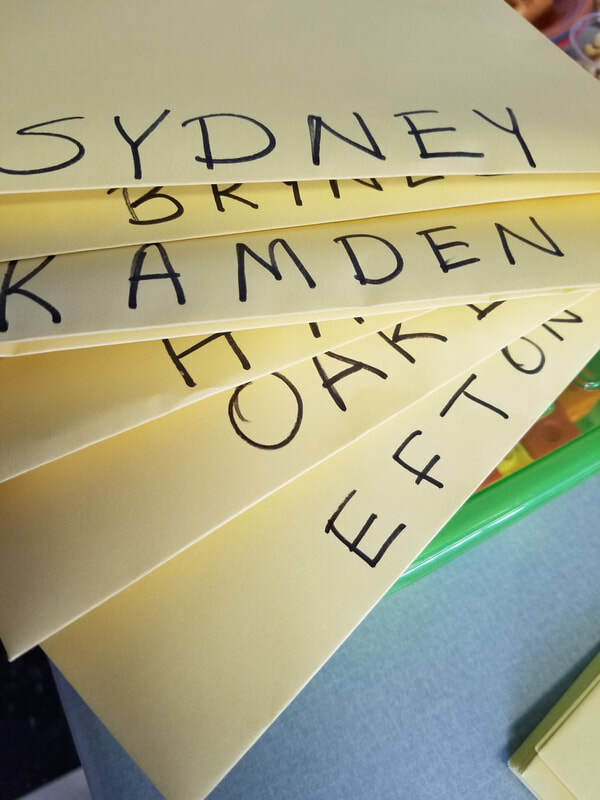 We proudly displayed these in our classsrooms and were able to take them home to share with family and friends!! Increase gross and fine motor skills and helps to develop muscle tone in the hands and arms. 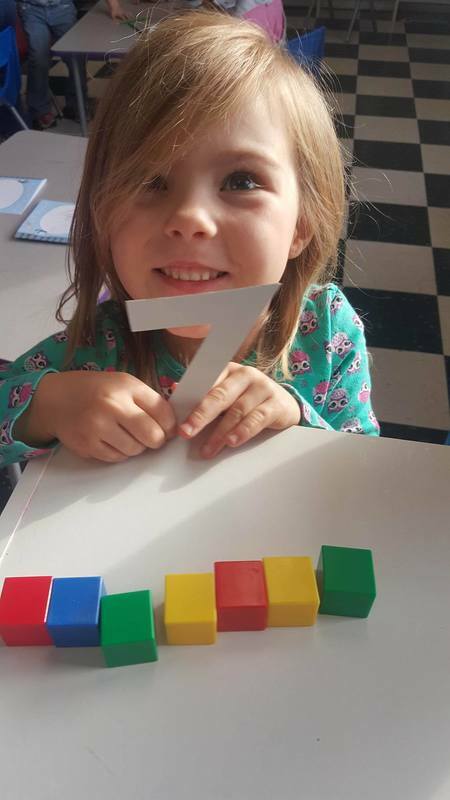 Develop patterning skills and learn basic mathematical concepts of sequencing, numerical order, counting forwards and backwards and addition/subtraction (for advanced students). 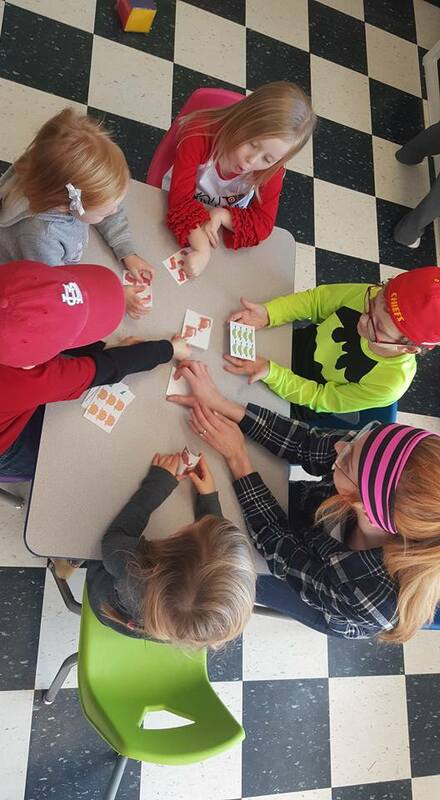 Develop a sense of teamwork and social skills such as sharing, taking turns, etc. In addition to these benefits, neuroscientist Professor Nina Kraus has conducted research that has proven that playing a musical instrument enhances the brain's sensitivity to speech sounds. 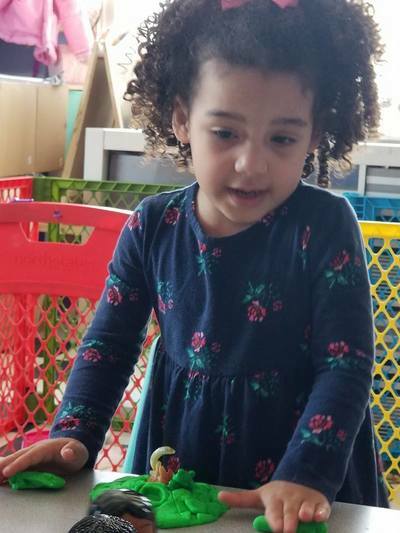 She states, "Playing an instrument may help youngsters better process speech in noisy classrooms and more accurately interpret the nuances of language that are conveyed by subtle changes in the human voice." Besides that, music is just plain fun!!! Check out our favorites!!! 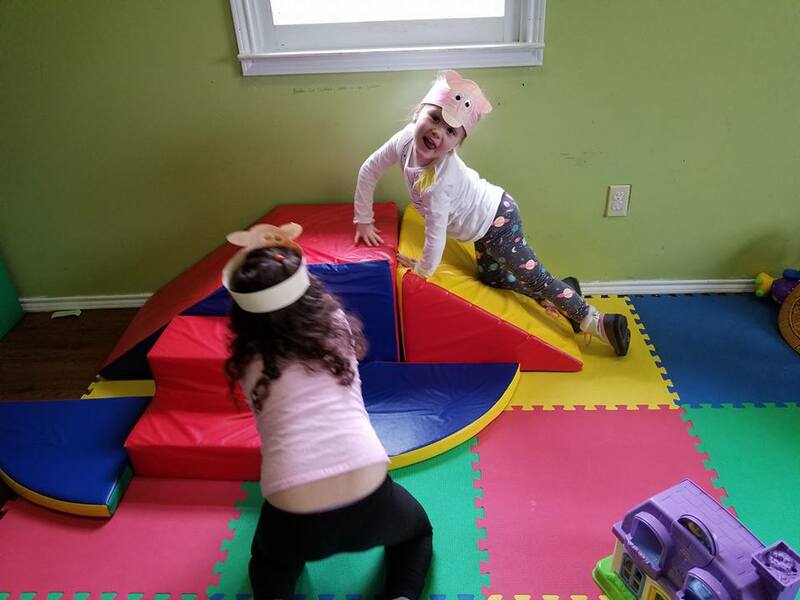 Though these two are completely different, they both provide exposure to movement, rhythm, and body awareness as we move and groove through our preschool days. 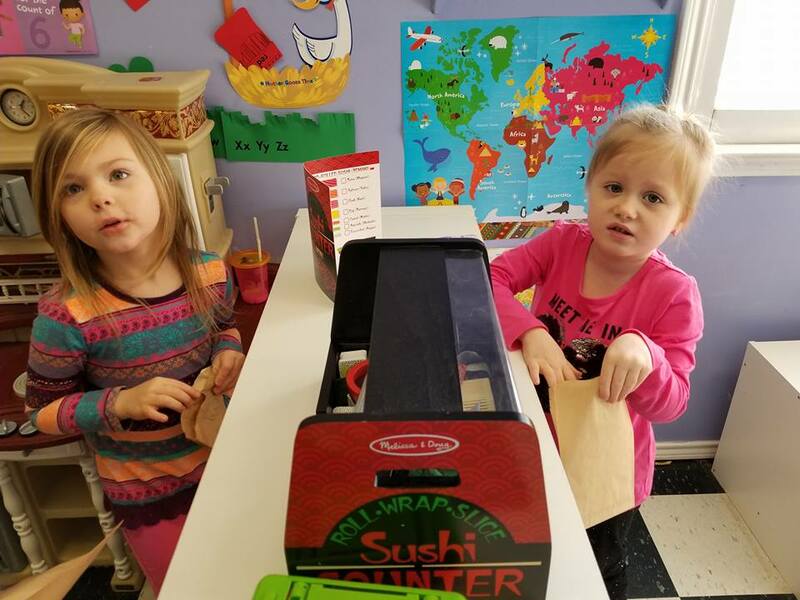 Counting our money at the Sushi Shop! 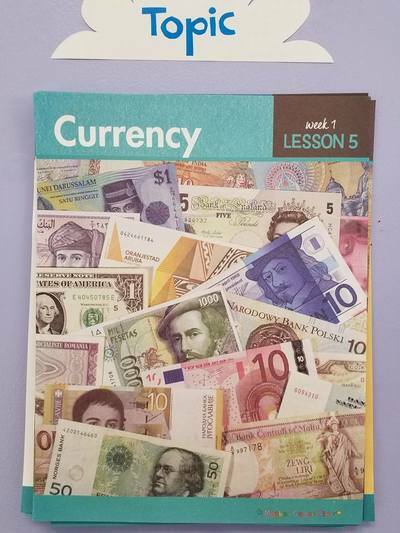 Part of this month's studies is to learn about different cultures and the foods they eat. During this month we have introduced our sushi shop to our Dramatic Play area. This is giving our little learners the opportunity to build and play with foods that look different than what they may find in at their dinner tables. They have enjoyed wrapping rice rolls and reading from the sushi menus. 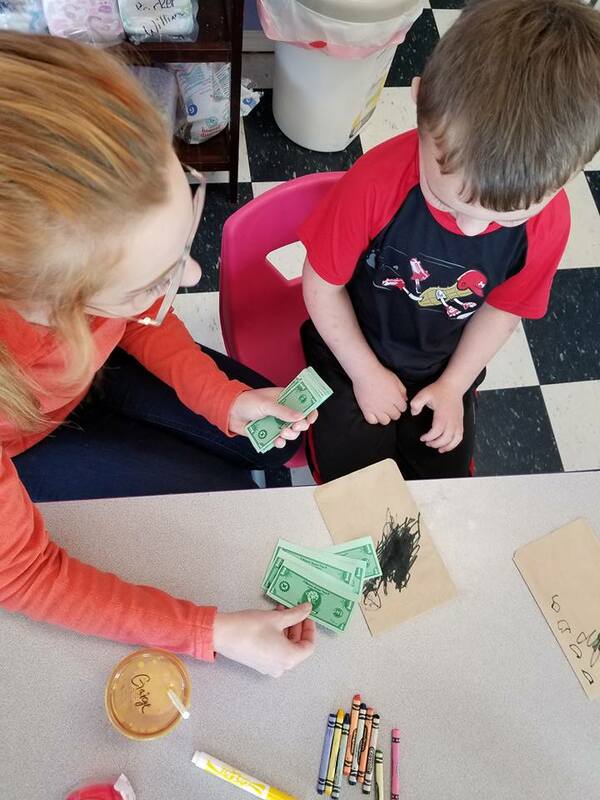 We have also learned more about money by purchasing the sushi we have made in our restaurant We carefully count out how many dollars our friends are asking for and counting back the change when we give them "too much.". We tried Japanese sweet crispy rice too! Not everyone was a fan, but they all gave it two "No Thank You" bites as is our tradition when trying something new! New foods, new cultures, new stories and songs. It's all in a day of play at Woolsey Academy for Young Learners! I just LOVE the photo-bomb cutie is the background of this sweet pic! 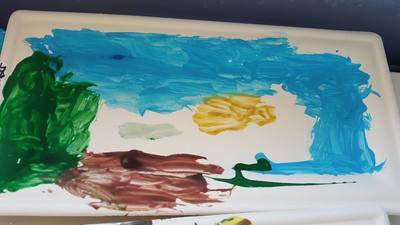 My little One'asaurus in the foreground is busily painting her Triceratops with greens, browns, and white. 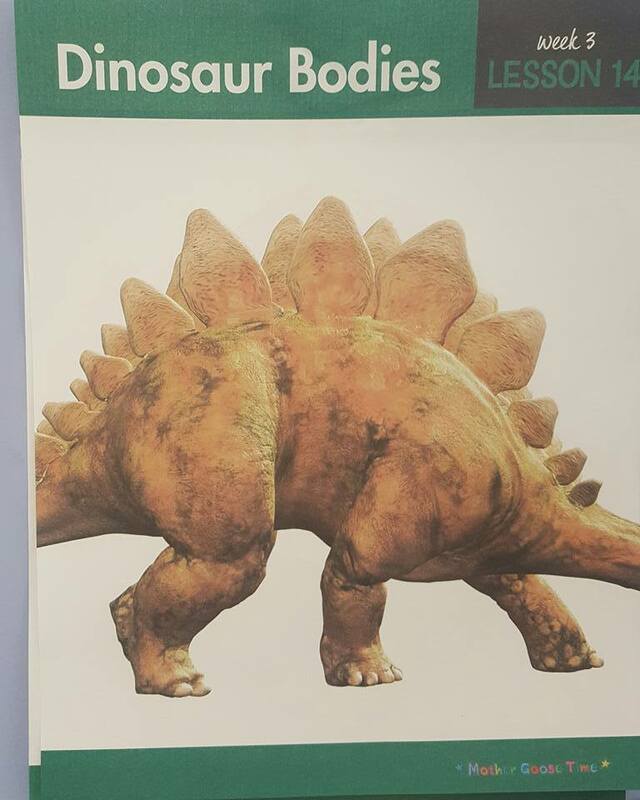 This week we focused on 5 popular dinosaurs similarities and differences. 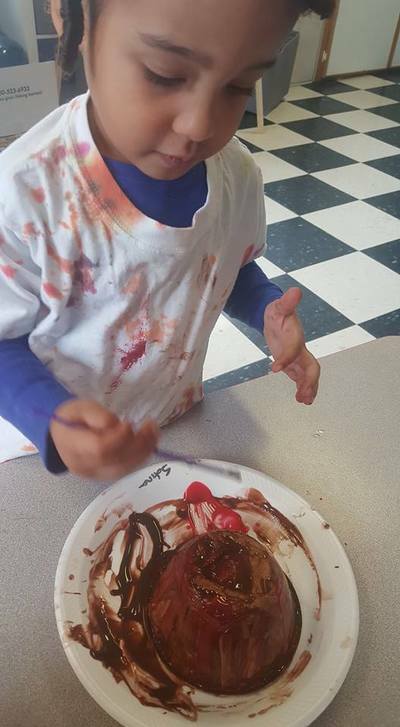 We learned the words "herbivore" and "carnivore" and what those meant. We also discovered that we, as humans, are "omnivores" since we eat both meat and plants. 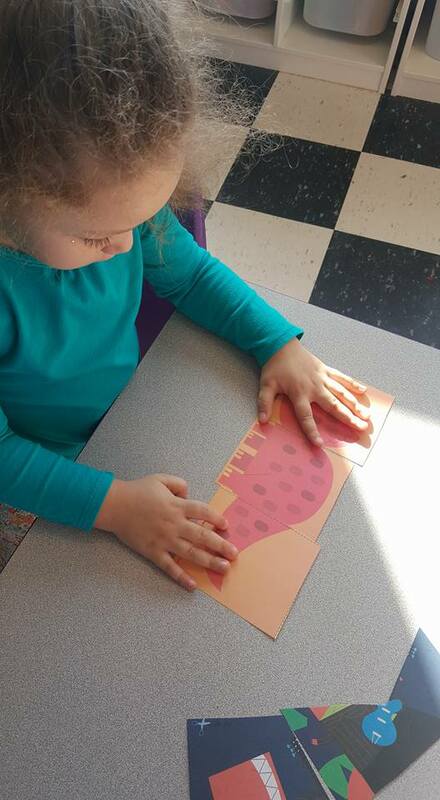 We discussed the different types of plants that we eat like apples, oranges, and lettuce. We wondered if the dinosaurs might have liked those pants too? The making of a GREAT week! "Explode," by Dancing Beats from Mother Goose Time is the newest addition to our YouTube Dinosaur Dance playlist. 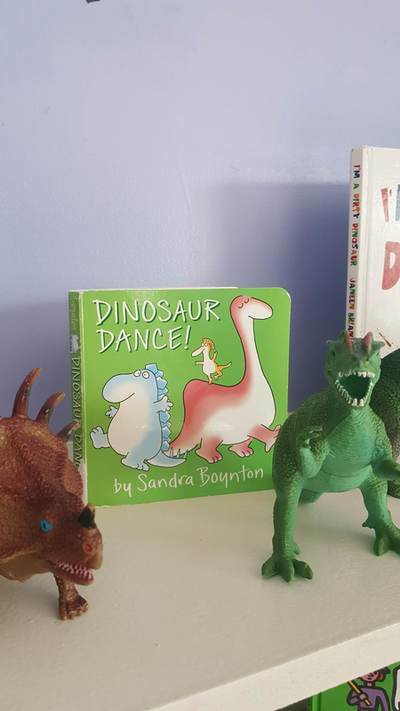 It is perfect for helping our tiny dino's how to move and groove to the beat with easy to follow dance steps they can quickly mimic and master! This one is a HIT and always has them begging to "STOMP!" This one has been great to help them learn dinosaur names and it has all of us singing in an Aussie accent! 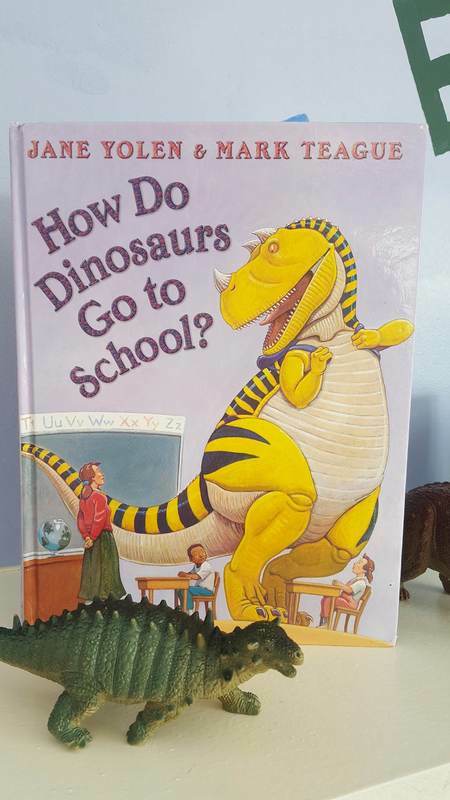 And of course, the Dinosaurs A to Z song!! But we're not just singing and dancing all day....we have SO much more to do! 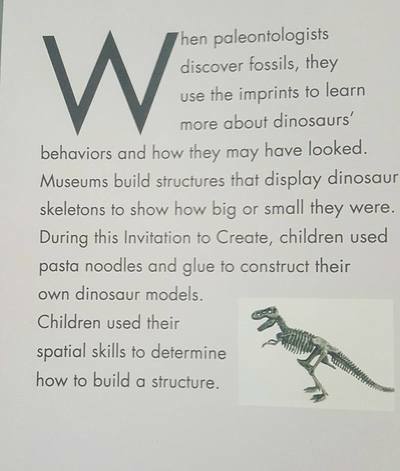 Like building with dinosaur bones to make a T-rex or Pterodactyl! 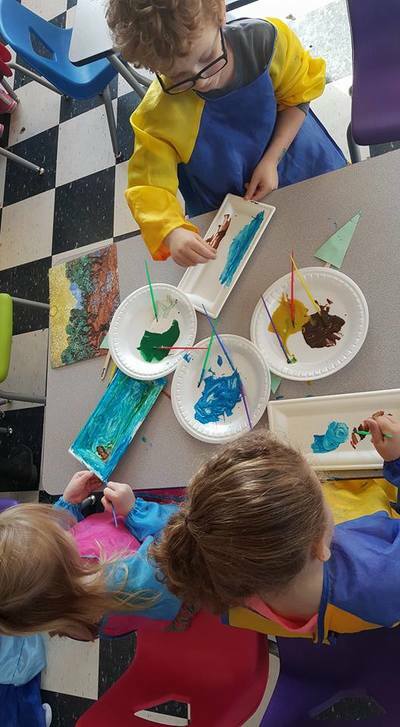 We painted with friends as we counted 17 bony plates on the Stegasaurus. 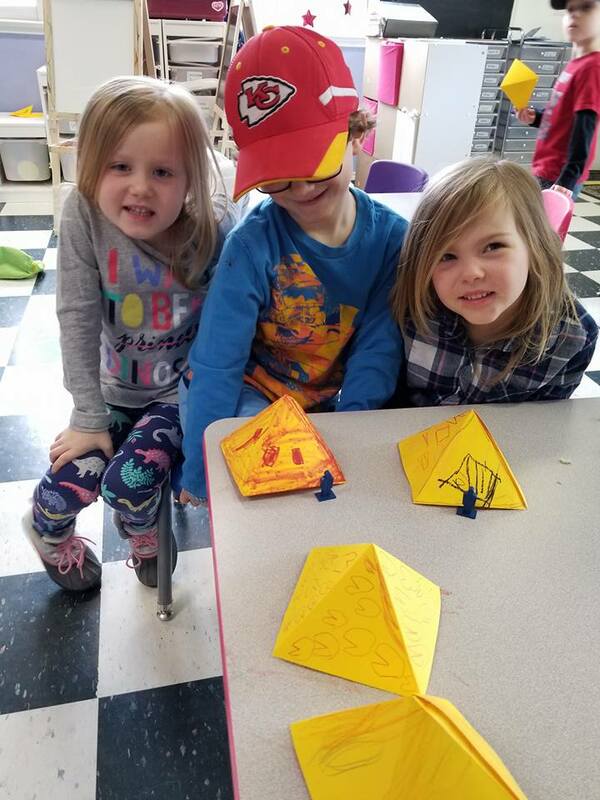 We built geometric awareness as we used shapes as materials to construct a dinosaur! 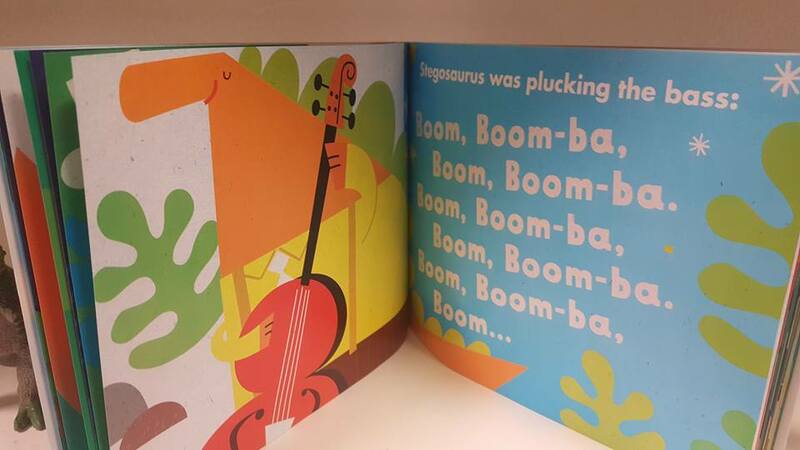 We practiced rhythm and patterns with out newest book (and a whole lot of instruments), "Jurassic Jam!" 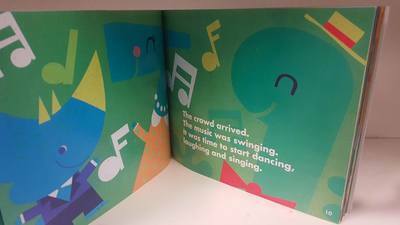 Jurassic Jam provided by our educational partners at Mother Goose Time, provides a great rhythm and meter as each page describes a grand gathering of dinosaur friends cheerfully entertaining on their instruments. 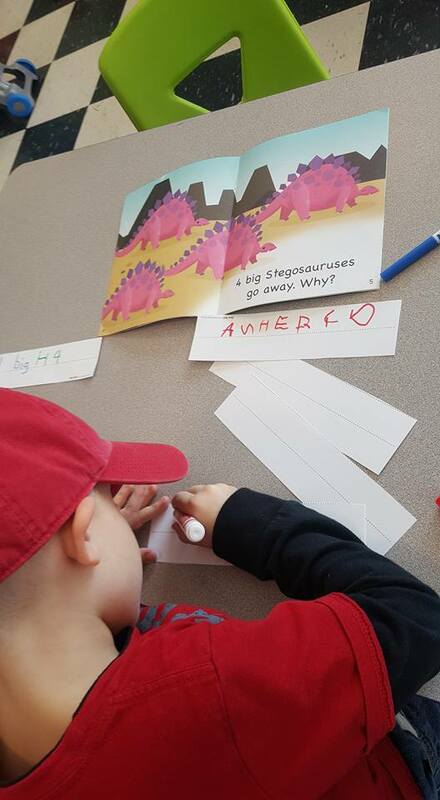 Our students quickly caught onto the patterns presented and began finishing the sequence by stories end..
We are learning about dinosaurs each day as we count our way up to 31! 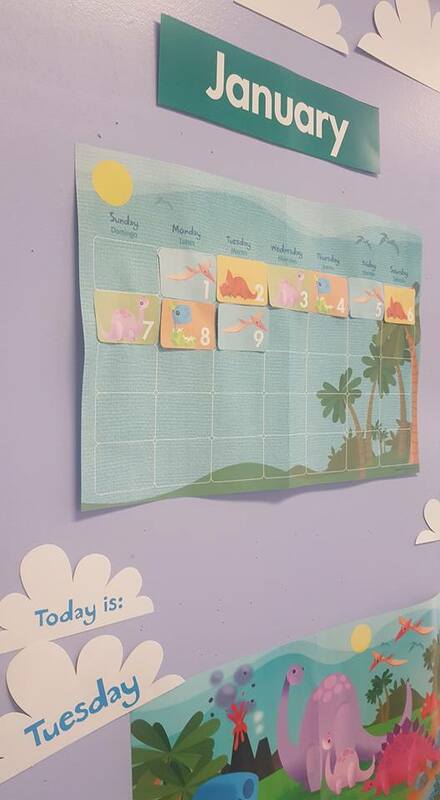 Even our daily circle time board is dino themed! 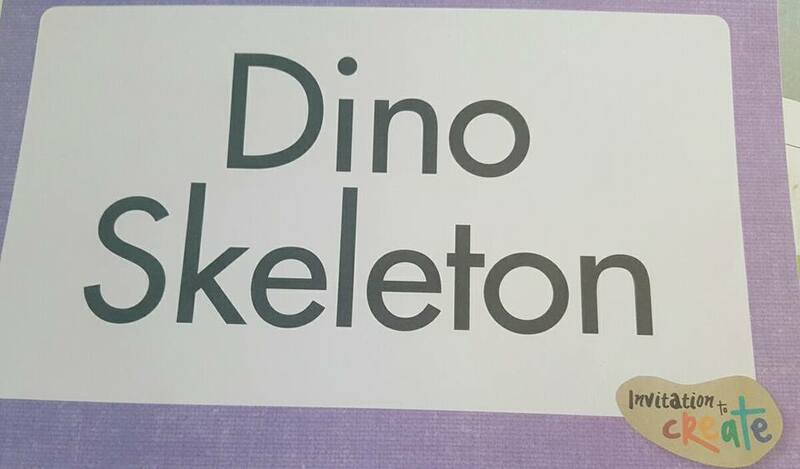 We have been matching our dinosaur friends to their information cards and learning about each one! 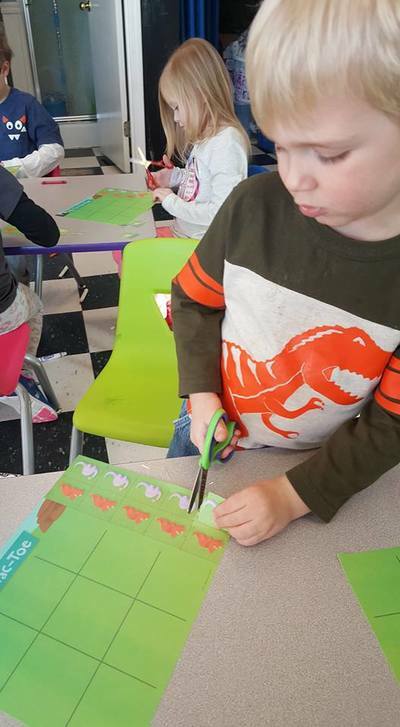 This week we have discovered dinosaurs as long as several buses put together and one as small as a mouse! From Music and Movement to Science and Discovery this week has been FULL of opportunity for dinosaur discovery and education through play! 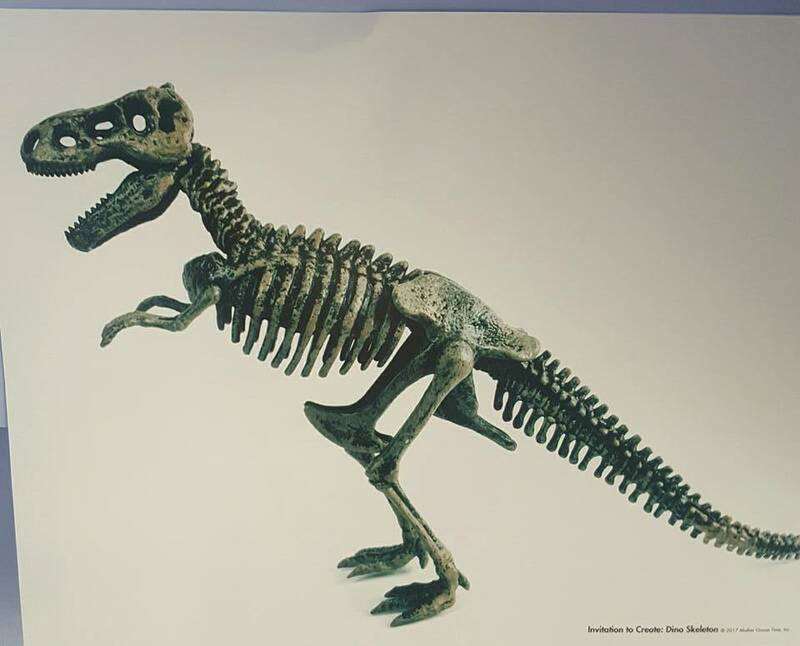 Our Month Long Dinosaur Study: Week 1, "The Dig!" Being stuck inside can become dull quickly with a group of energetic preschoolers, but this month we decided to study all things "Dinosaur" with our educational partners at Mother Goose Time. Our little learners discovered what a Paleontologist is and does as they dug into fun with this science and math filled week. 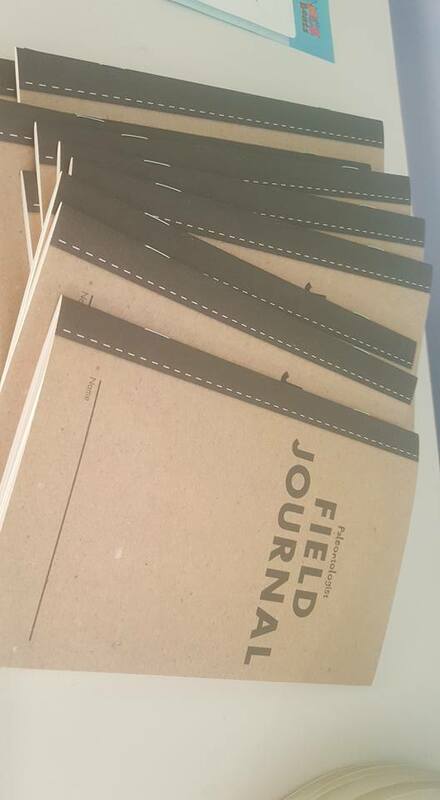 Our Field Journals provide Language Arts for our Emerging Readers, writing and pre-writing practice with shapes, letters, and numbers; plus plenty of space for recording our own observations! 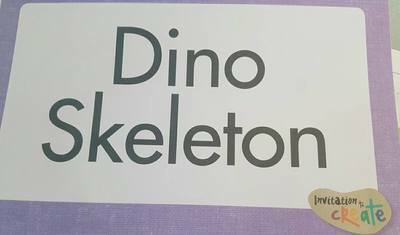 We began our week discovering what the word "Paleontologist" means - a person (scientist) that studies the history of life. 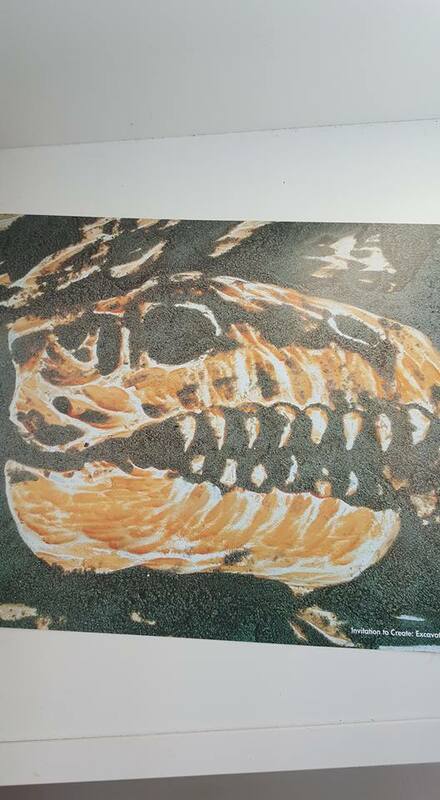 In this history we are studying dinosaur bones. 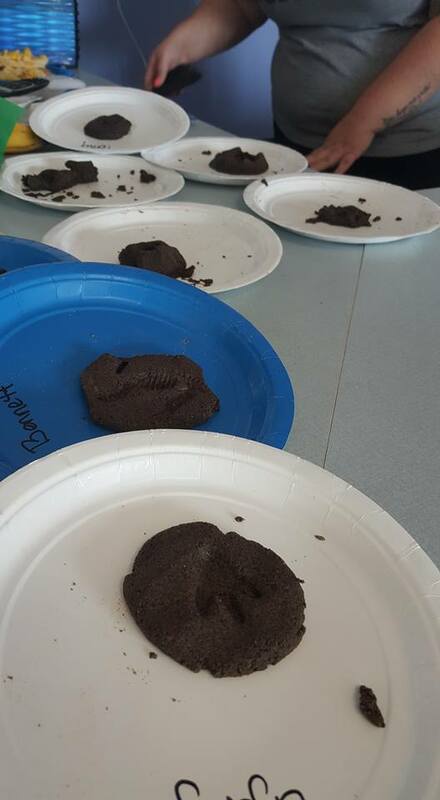 We then discussed what an "Excavation Site" was as we made our very own dirt dough to excavate and imprint fossils in to take home and share with our families. 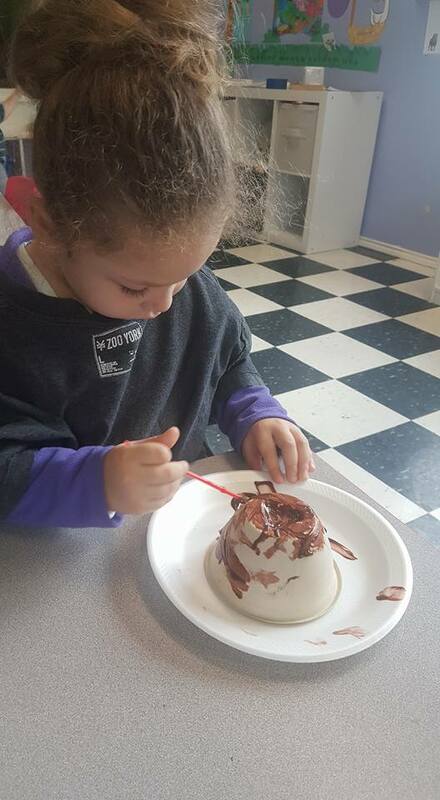 Our dirt dough was made with coffee grounds, flour, salt, and water all measured and mixed to create a soil like consistency. This provided full sensory immersion into our fossil review as our Paleontologists pressed dino feet, heads, and bodies into mounds of "mud" then placed them into the oven to harden, simulating the solid fossils like those found in real digs. 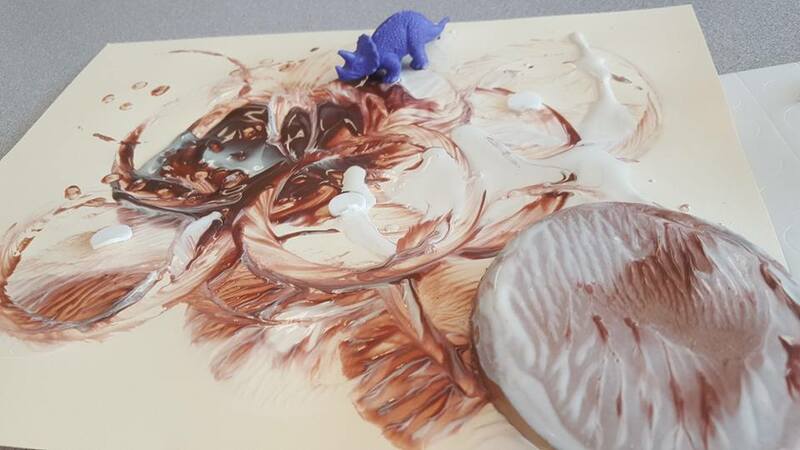 Q-tips and our favorite homemade dough make easy to create fossils. 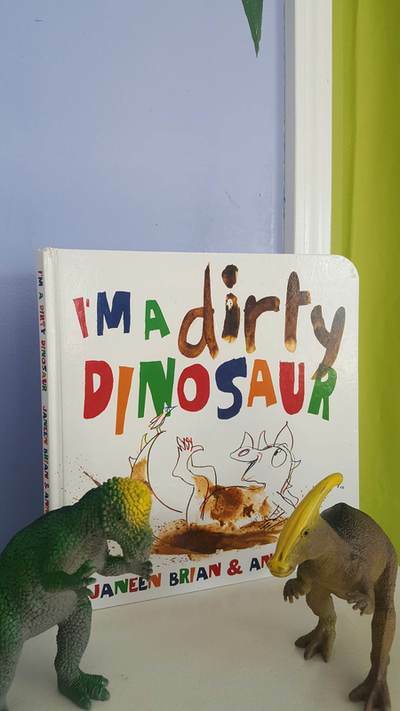 It is important to provide little learners with tools that allow them to explore complex concepts like "fossils" and these little assorted dinosaur fossils that we ordered from Amazon fit well with helping them to understand what a "fossil" is. Here is the link http://a.co/4mIEsDh. 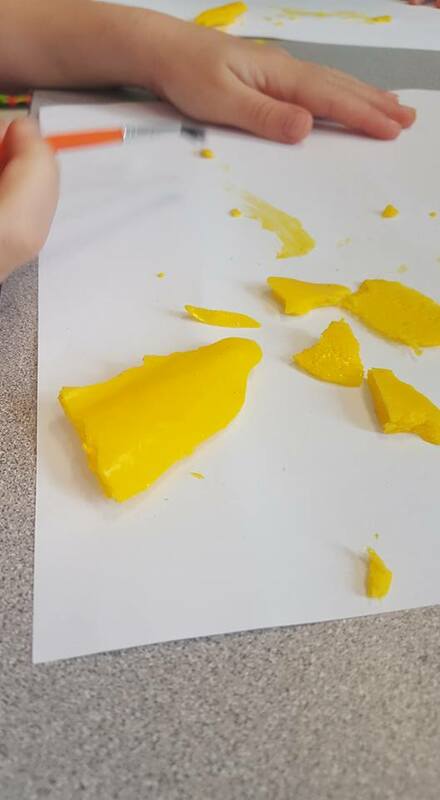 We used these for making imprints and impressions, for painting and stamping and here we used them to measure length, height, and width, comparing our veggie eaters (herbivores) and our meat eaters (carnivores). 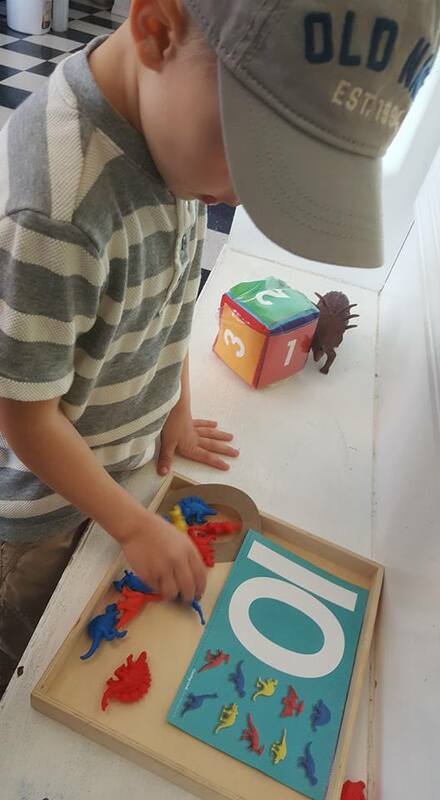 These child-sized rubber dinosaur math manipulatives and counting cards are set up on one of our math shelves and allow our students to independently add and subtract their way to 10. 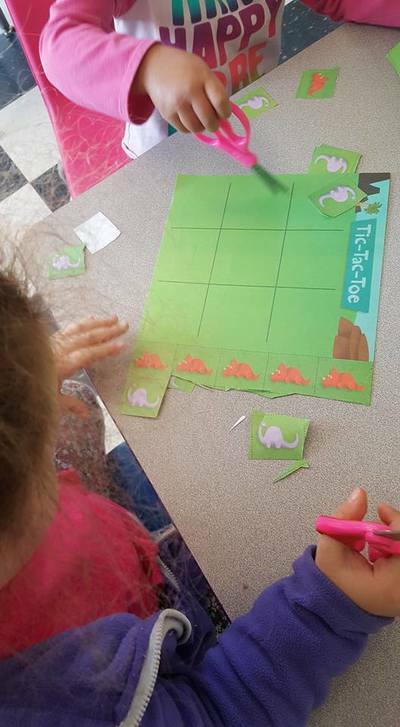 We also use these as game pieces in our new math game, Dinosaur Dig! multiple planes of achievement and skill levels that fit our mixed age group. This is just one of many that we accomplished this week. 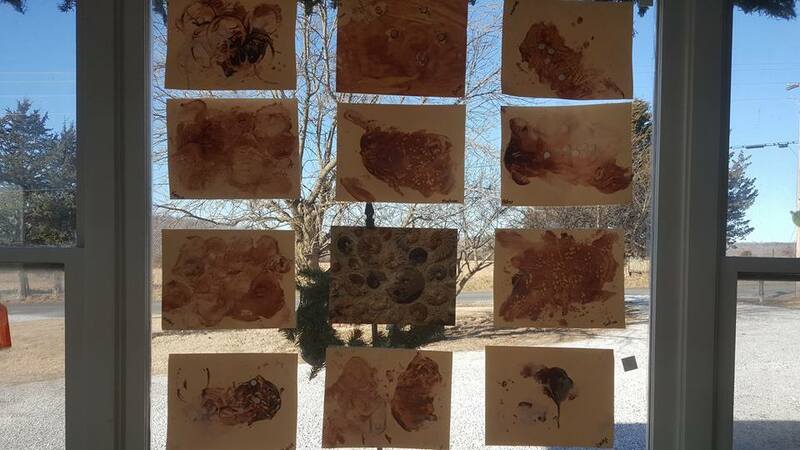 We stamped with browns, and whites as we mixed and swirled our stampers to look like dinosaur feet in the dirt. 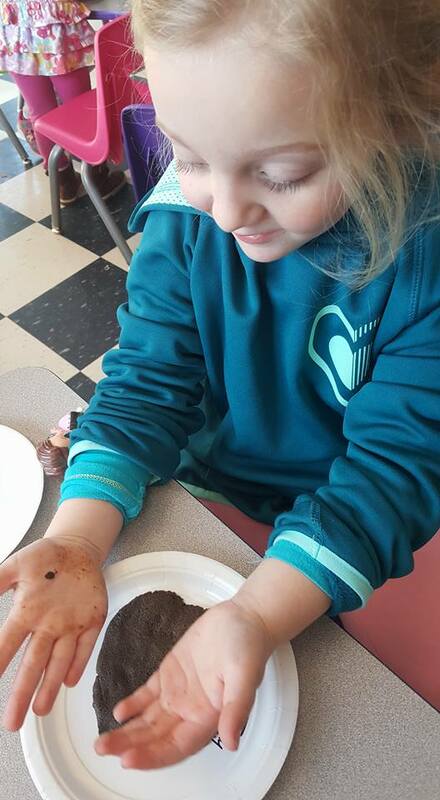 We discussed how a dinosaur made imprints in the soil with their feet that could last for a very long time as they hardened in the sun. Week 1 of this month's Dinosaur Dig provided a strong foundation for our budding Paleontologists to discover with friends while building connections with creatures from long ago to their own backyard. I write a lot about games that teach. I believe in teaching through play. I believe in experiences, music, dancing, squishy dough and finger paints, dress-up and dolls, trains and trucks that haul loads and whose tracks meander around our classrooms. Our dinosaur studies with Mother Goose Time this month have been full of opportunities for all the "fun"dementals of play and I have been like a kid in a candy store enjoying all the newness each day brings. There are, however, certain games that make me FLIP! 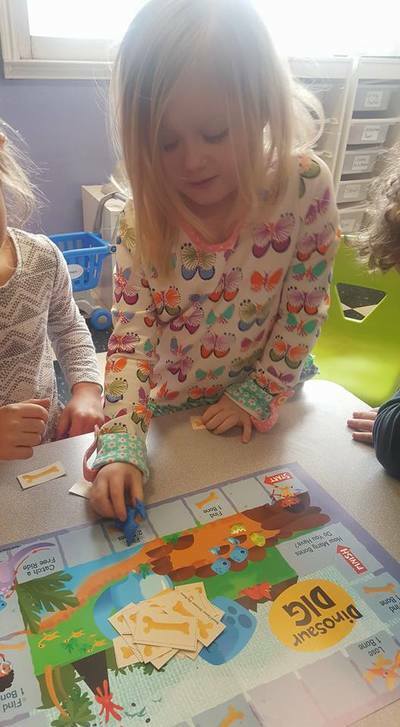 These games are always an instant hit with our little learners and provide the freedom for organic learning through engaged involvement. They don't realize the science behind the game. They don't realize that I am providing these experiences because not only do I know they will LOVE it, but they will be building critical thinking skills and not even realize they are learning. ​I can actually measure their expertise increase as they play. What makes a game special? 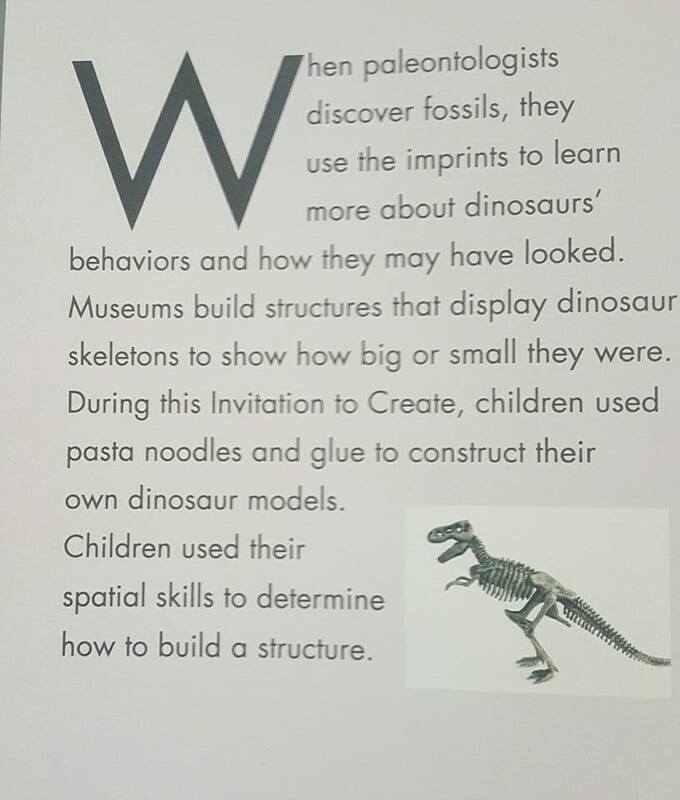 Dinosaur Dig has all the necessary components of a skill builder at a research level. As the children move their dinosaurs along the board they begin to recognize key words and letters that clue them in to what the upcoming instruction square is going to say. 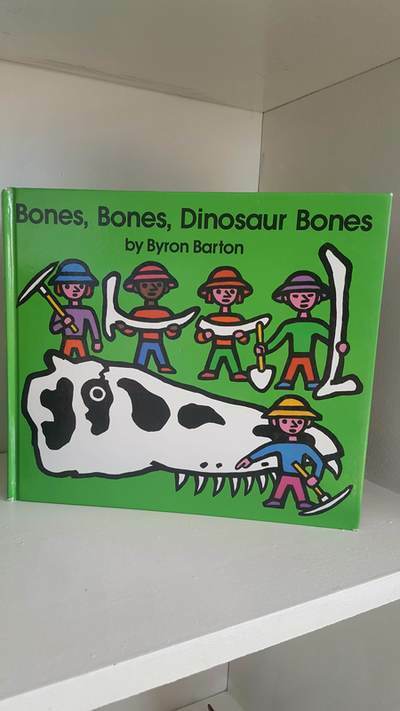 Some stated, "Find 1 bone," or "Subtract 2 bones." 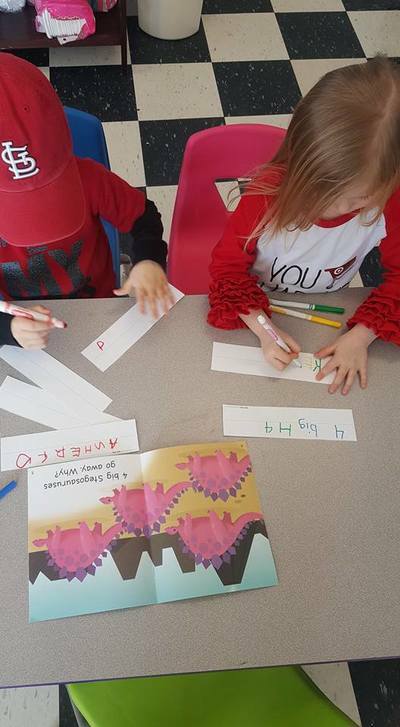 These are Emergent Readers striving to learn so they can independently play a game (Language Arts). FORGET flashcards!! Who has time for that??? As they roll the dice they excitedly count from 1-5 along the squares toward an instruction square. We carefully add and subtract as instructed. Rounding the last square we tally each child's total (math). By the end we are BEGGING to reset the board and play again. 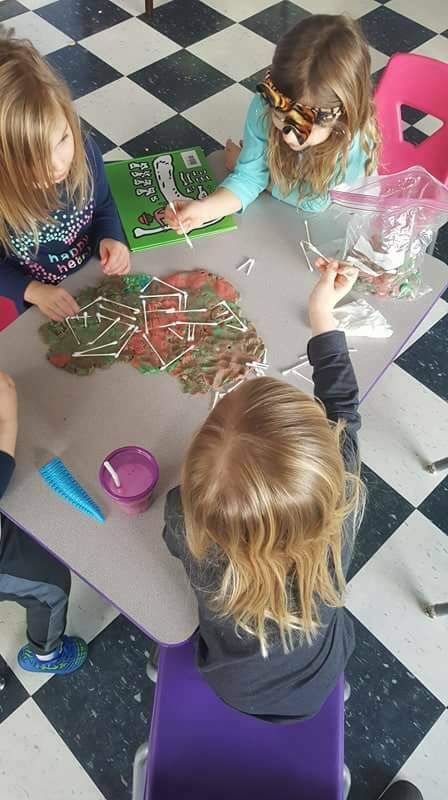 We are pointing out the "add" and "subtract" squares and giggling about how many bones we are going to collect THIS time! 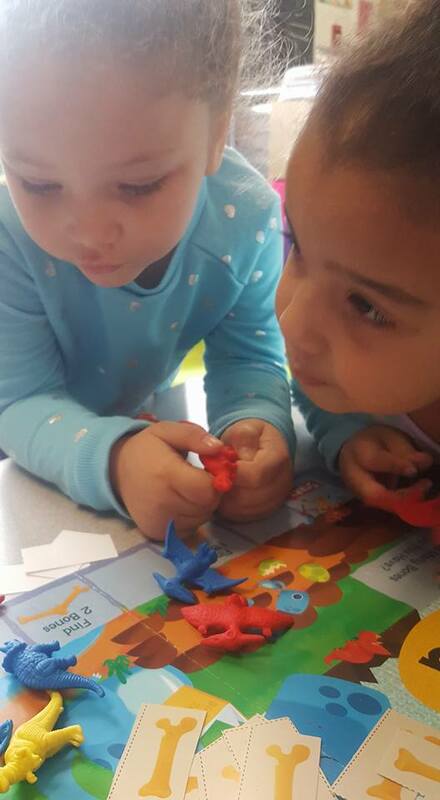 This game is built on subject matter that our children love (dinosaurs) with game pieces that easily fit into their hands. 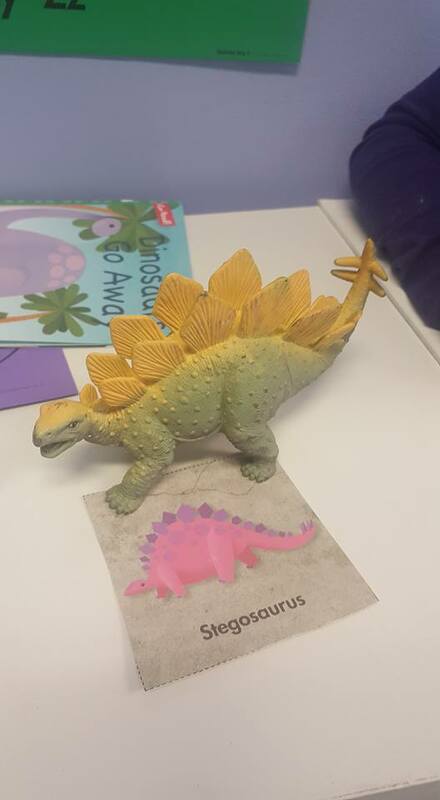 They pick out a new color dinosaur and we discuss it's name each time (science)​. We have fun conversations about whether it is a "veggie" or "meat" eater as we recall the words "herbivore" and "carnivore". 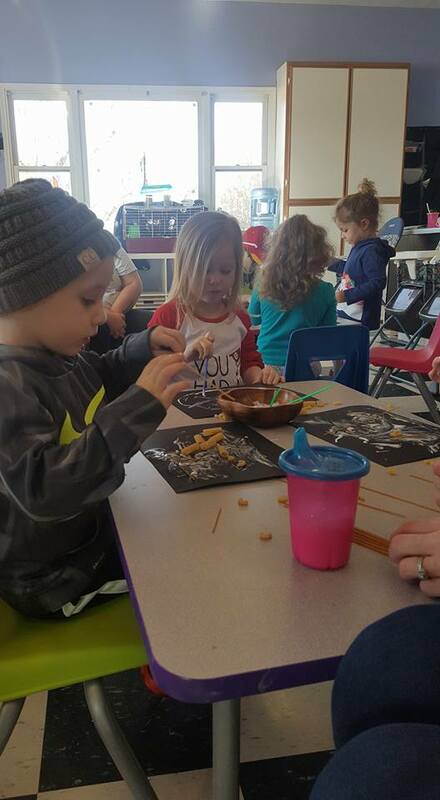 (Language Arts, Social/Emotional, Science) and we are pretending to be baby birds eating the bones we have collected as we roll and recognize, then put into practical application the numbers displayed on our dice. Research is FULL of evidence (just google "how to best teach a preschool child math concepts" and you will find page after page of articles filled with doctoral dissertations about the "how to's" and "why's" and it all boils down to one concept. 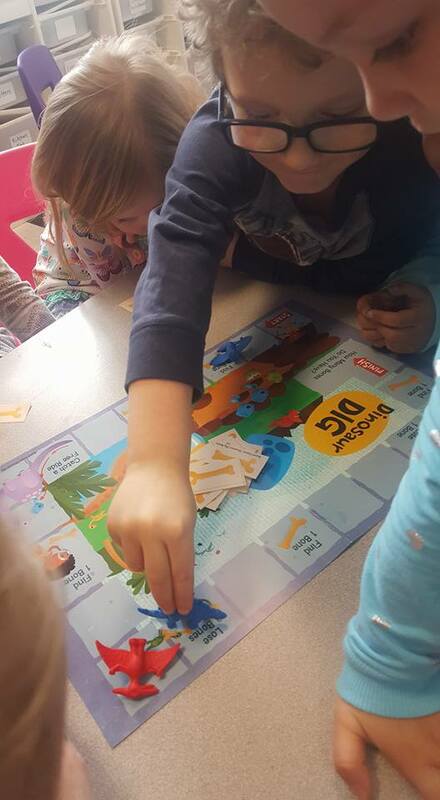 Play games...specifically board games with your child. 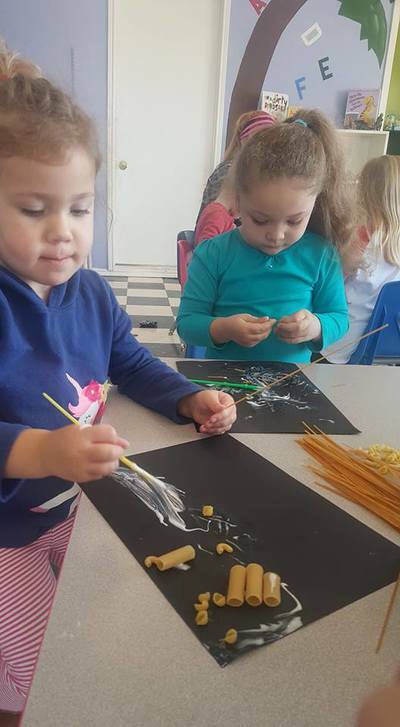 Have your child attend a preschool that teaches complex and abstract math concepts through stories, songs, and playing board games. 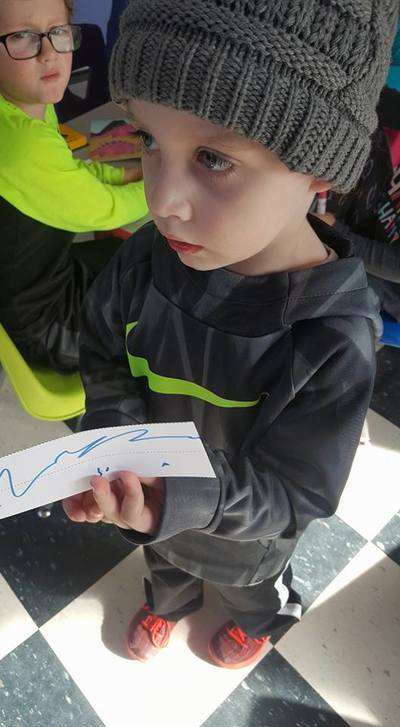 This is what we are proud to promote each day for our little students. 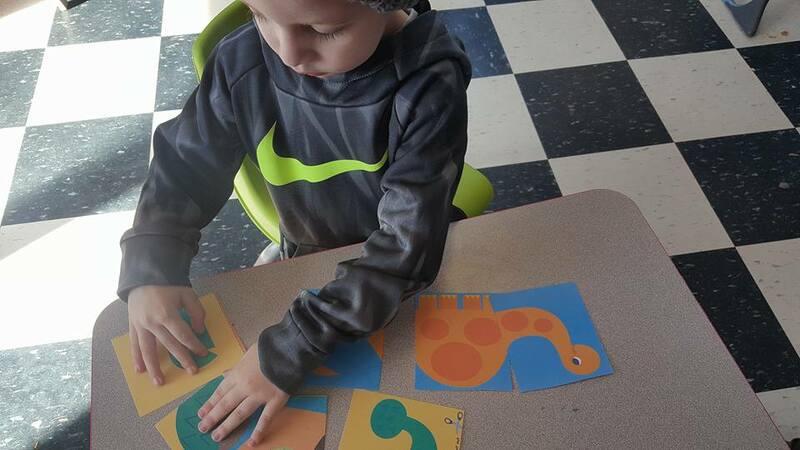 Your child's math brain will grow. Your child's social/emotional resilience will grow. Your child's language skills will grow. Now...stop reading this wonderful little blog and go play :) ! 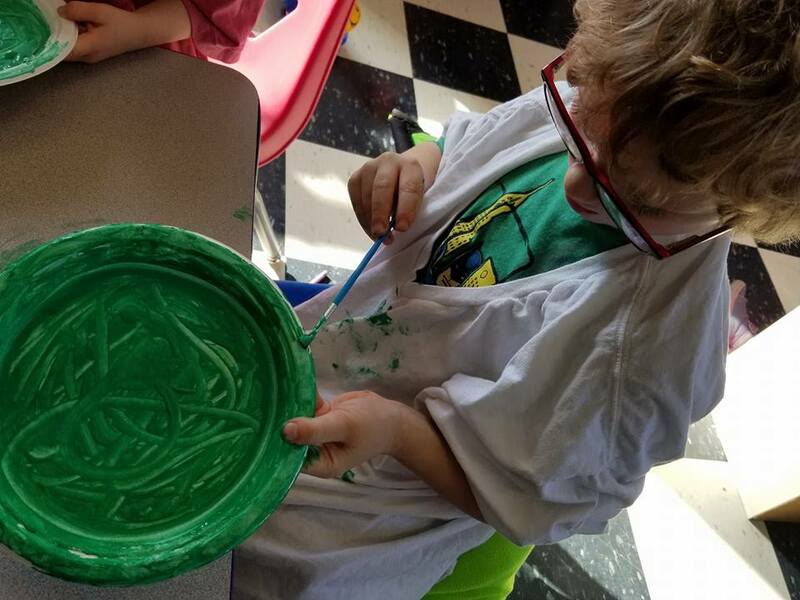 If you want to create math minds,.. play. 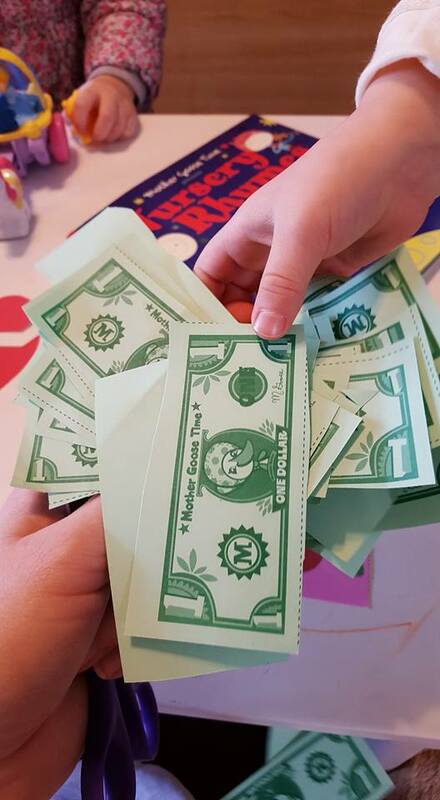 I am not talking about giving children toys and saying, "Here you go, play this." I mean play WITH them. 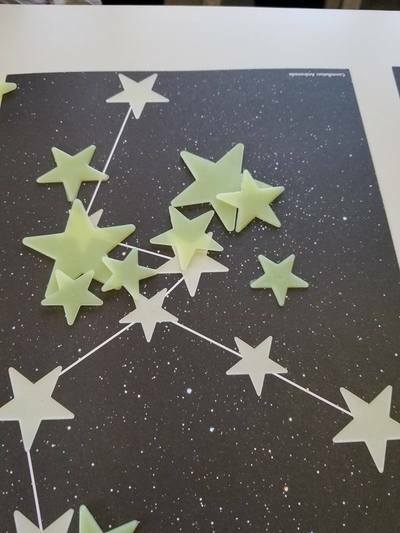 Create Invitations to Play that engage their senses and natural curiosity. 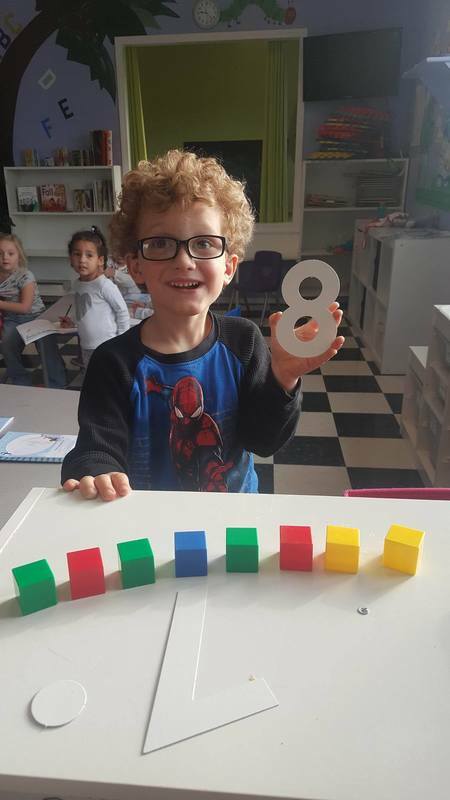 This is easily done in the preschool setting and our educators at Mother Goose Time provide an excellent foundation for math skills through multiple Invitations to Play throughout the school day. 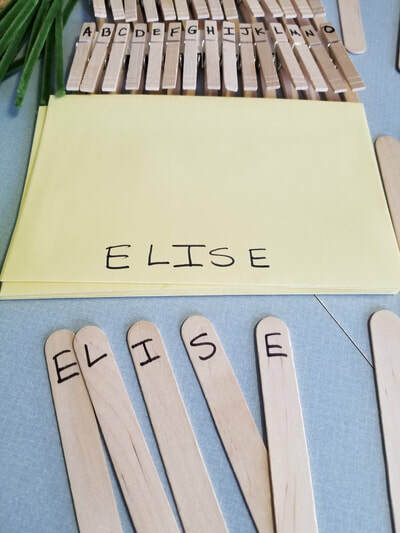 Creating an "Invitation to Play" may sound complex at first, but it is very simple. 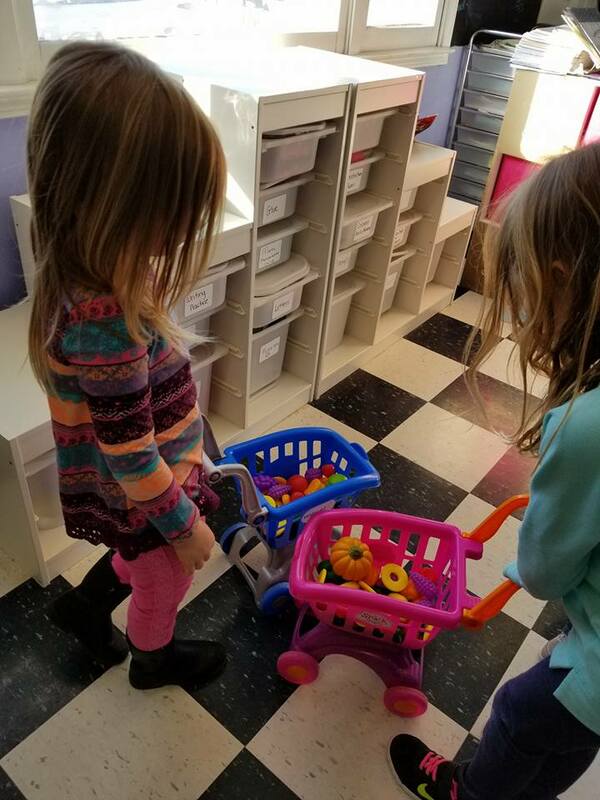 It is "staging" areas of play that the child is naturally interested in and stocking those areas with items that they can utilize that encourage skill building. This can be done for Language Arts, Science, Social/Emotional, Math, Music, etc. 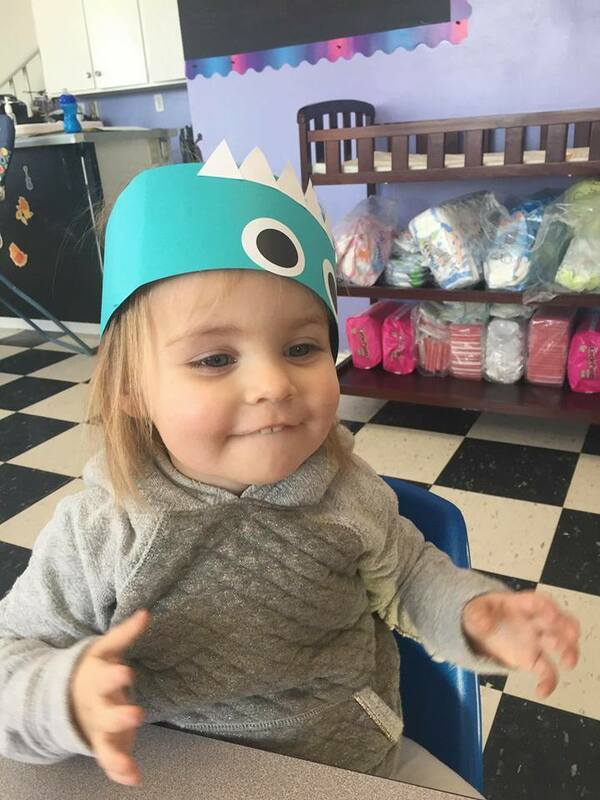 This is just one of our simple, yet highly effective "Invitations to Play." Don't those colorful little blocks just say, "PICK ME UP!!!"??? Our children carted these from one area of the room to the next. 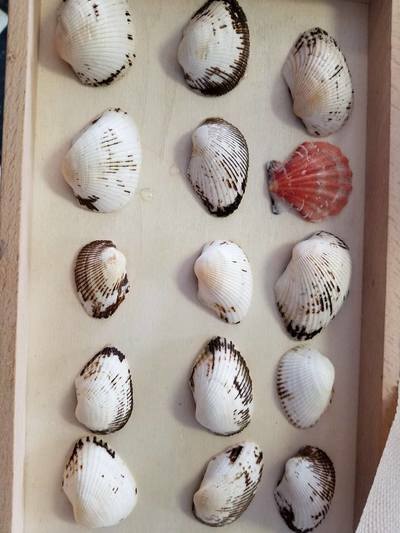 They placed them on the scales and weighed them. Three blocks on this side, eight blocks on that side. 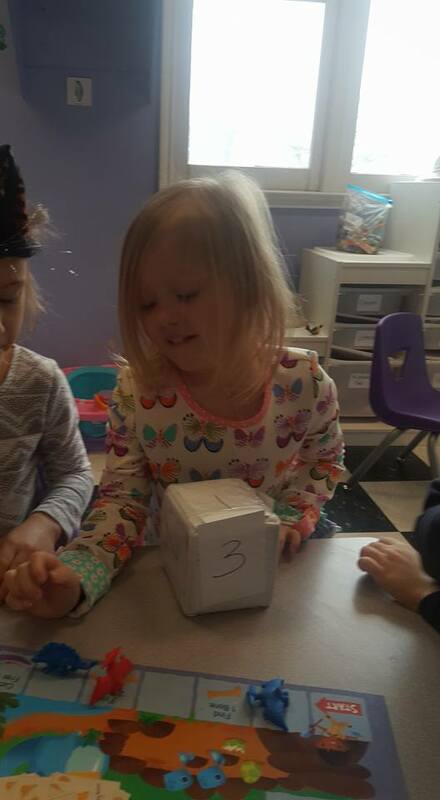 They would readjust the numbers and weigh over and over to see if 6 blocks weighed more than 2, and if 10 blocks weighed more than 1. They would grab a friend and giggle and guess whose side would go up or down. They would squeal, "I WON!!!!" with glee when their side was heavier or lighter depending on the rules they had set up for their newly created, self-directed math game. 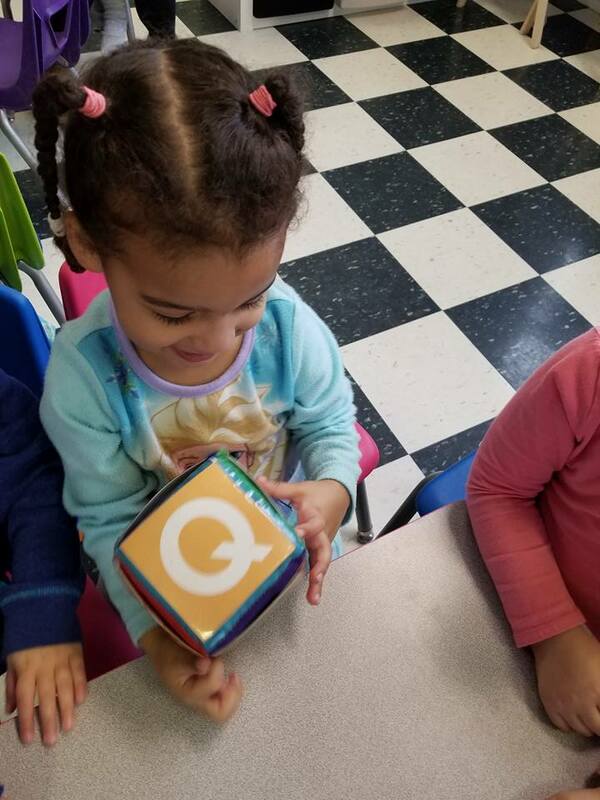 Our partner educator, Mother Goose Time, sent us these 1 inch colored cubes with our Winter Wonderland theme for the month of December and by our children's reactions these will stay out for a LONG time! Here they decided to see "How many more would it take to make 10?" 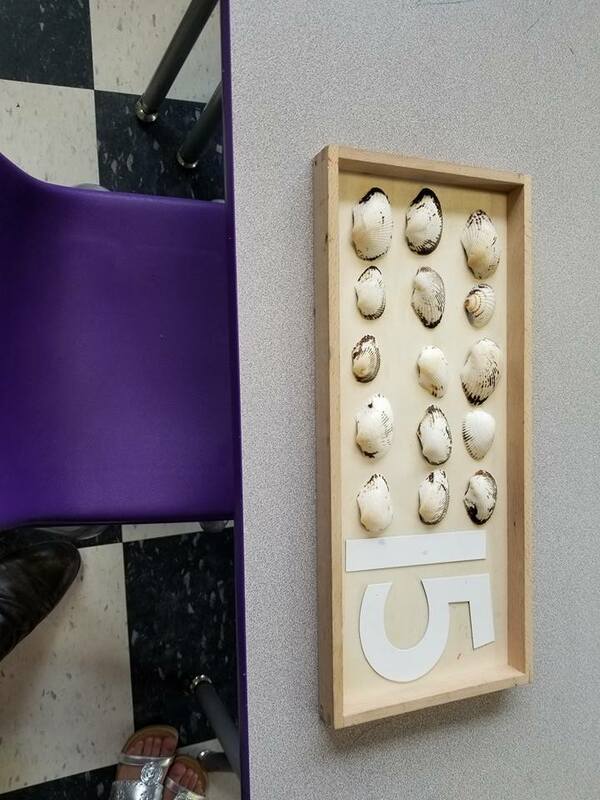 So one child set out a certain number of blocks (5 here), and the other child would count along from 5 to determine how to make 10. 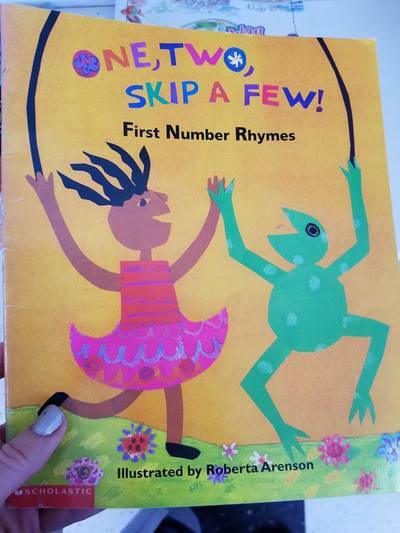 This is algebra in the pre-k years. 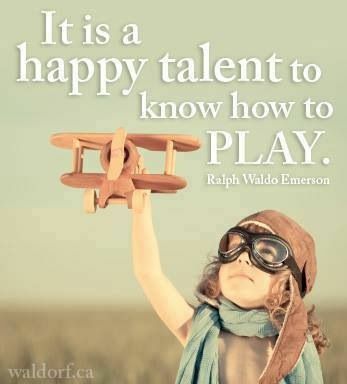 It is play. 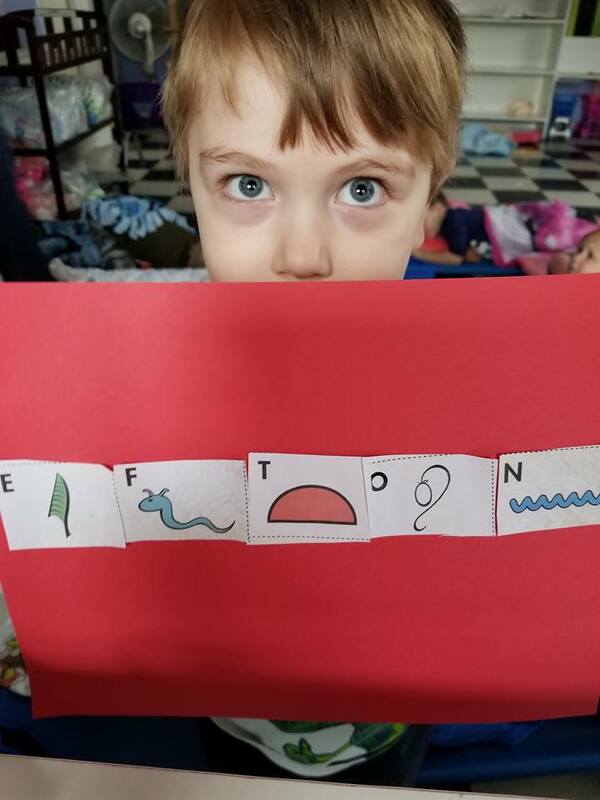 It is a beautiful mix of self-directed learning and mastery that makes this teacher swoon!!! 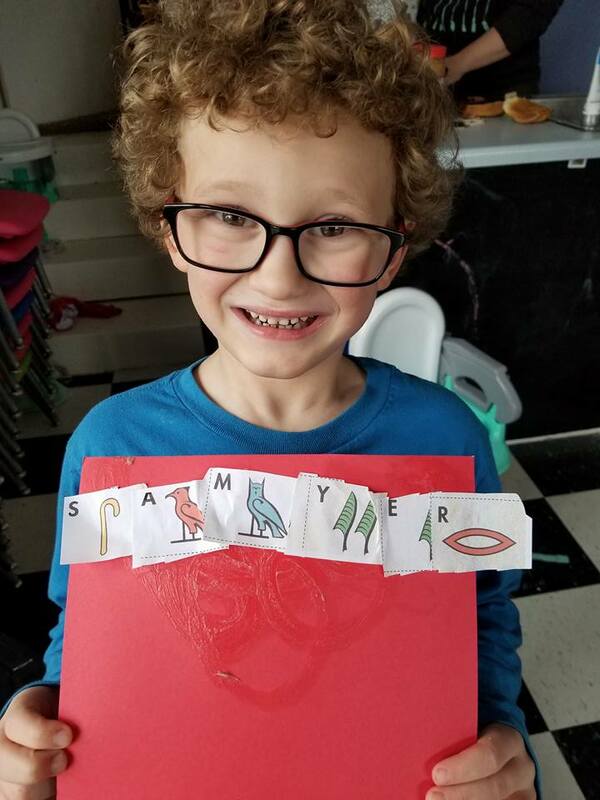 -In this video one of our younger 3's became a bit excited as he grabbed the "7" from his older classmate. She handled it like a champ! We have a mixed-age, small private center and we teach our older children to be understanding and patient of the younger ones. 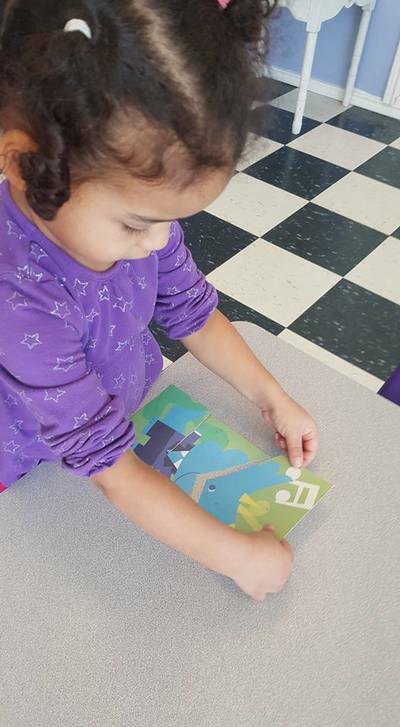 This little learner was focused on the task despite the distractions and obtained her goal! ​Aren't my kids the CUTEST?!?! As Early Childhood Educators we must provide these experiences. 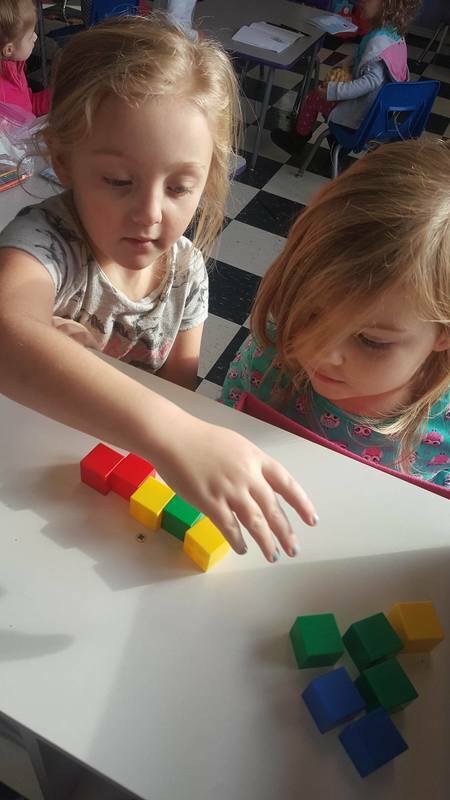 Not only did our students use these little blocks for counting, they used them to build rows and columns alone and with friends. They use them each day for measuring how long one doll is in comparison to another, and how tall the T-Rex is compared to the Stegosaurus. When we look at the life-long benefits of math in preschool we must take an active approach to providing tools and games that will constantly engage our little learners. Introducing children to new concepts is one of my favorite things to do in preschool. 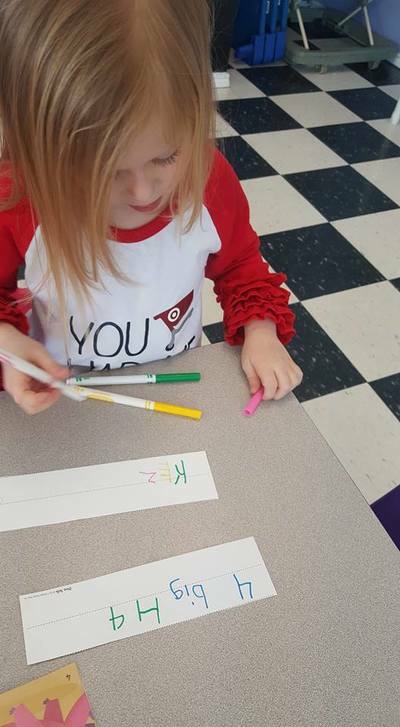 It is so easy to get into the ABC rut prepping them for Kindergarten from a "McDonald's" style checklist and even easier to drown in the mundane of daily routines and circle times. We have to keep things fresh and engaging. 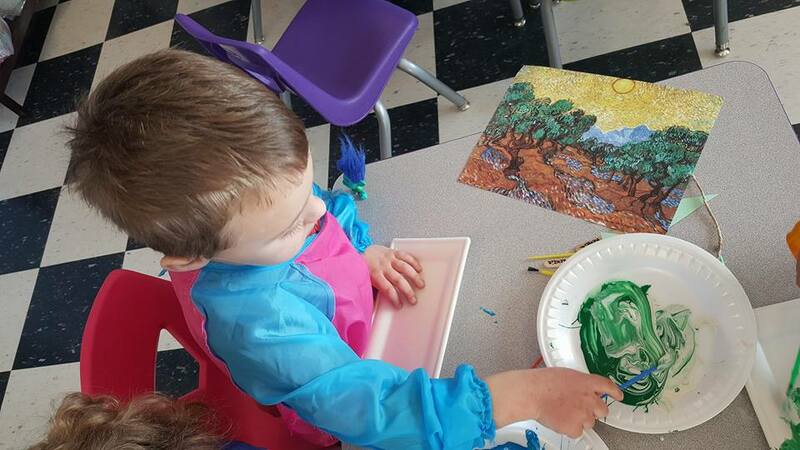 Part of that is not becoming bored ourselves and our Mother Goose Time curriculum ensures that every single day is fresh, inviting, and engaging! 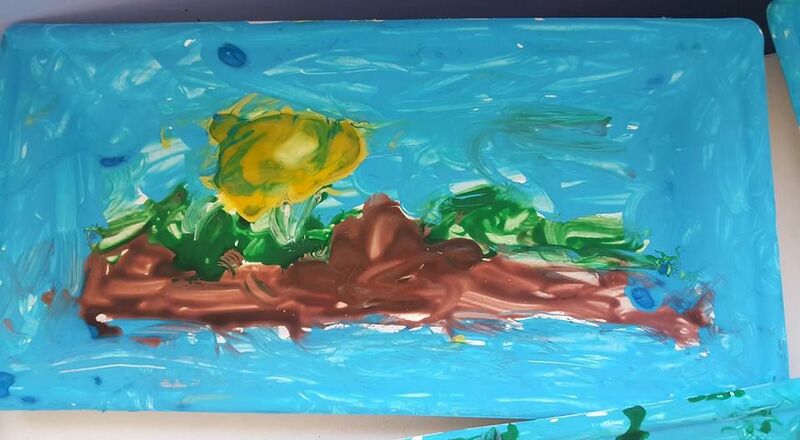 This is why I LOVE introducing children to the Fine Arts. It gives them a window into the bigger world they live in and gives us an opportunity to watch them interpret and create masterpieces of their own. Some would say, "They are too little!" "Why bother?" "Just stick to the basics..."
The basics??!! 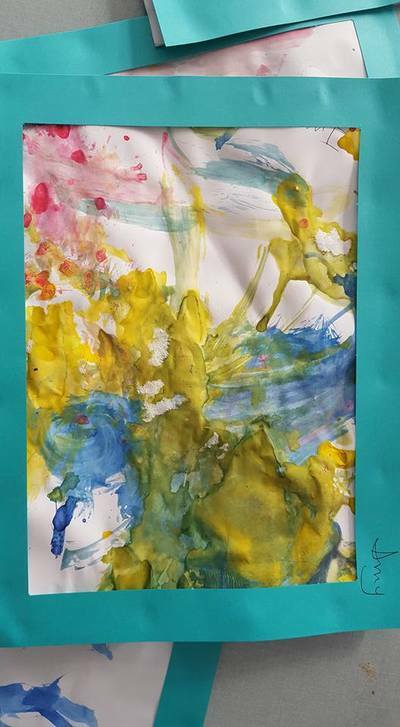 The basics assume that children are not capable of amazing things. 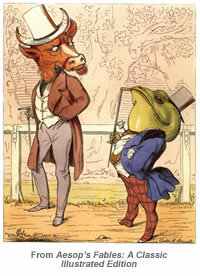 "Too little" is a adjective for small thinking. "Why bother?" 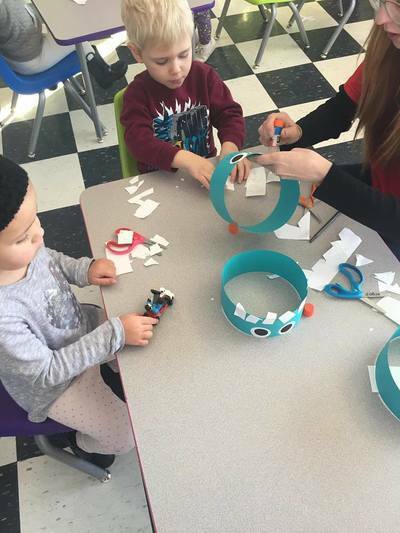 Just look for yourself and see what these little learners created with some basic materials. They are proud. They are engaged. They are imagining and creating and inventing and interpreting. 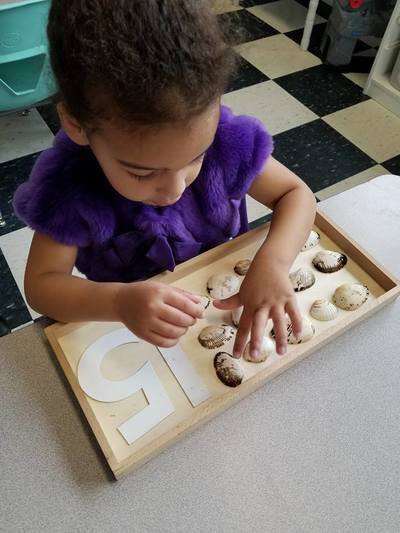 These activities build language skills, fine motor skills, observational and spatial relationship skills. What's not to LOVE!!! 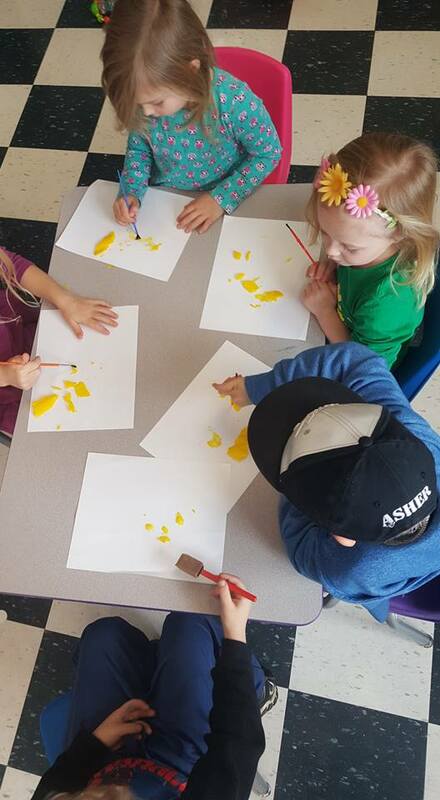 In this Fine Arts lesson we utilized Van Gogh's, "Olive Trees with Yellow Sun," provided by the educators at Mother Goose Time. 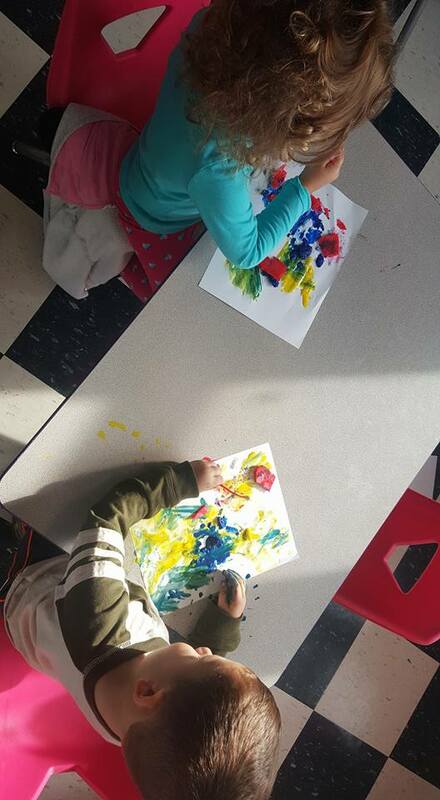 ​Teaching Fine Arts to preschool children allows teachers and children to learn together through observation and conversation. Much of how a child learns is first through conversation and engaging each student on the same level. 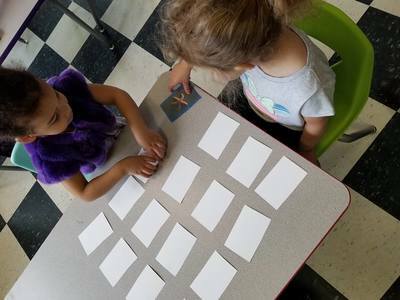 "It is important for the teacher to paraphrase the student’s comment in such a way that the student feels understood and the rest of the group can grasp what the student has said, Gulden said. 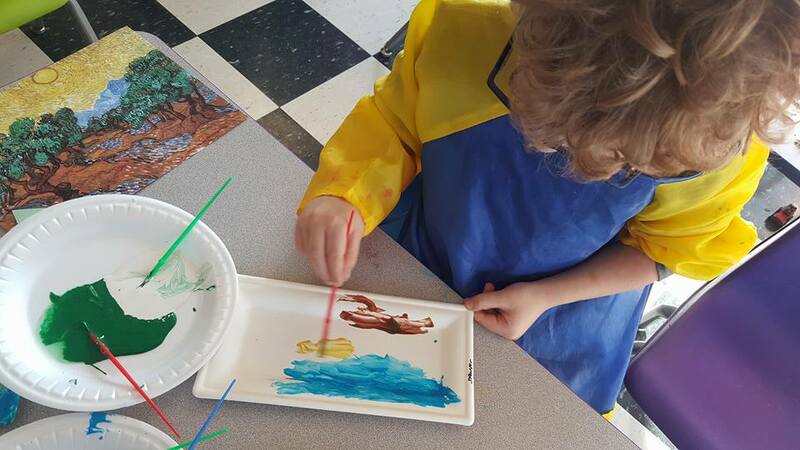 Teachers have to let go of their agendas and ideas and follow the child,"
"Using high-quality artwork is also important," Morin said, "particularly in terms of stimulating observations by the children." 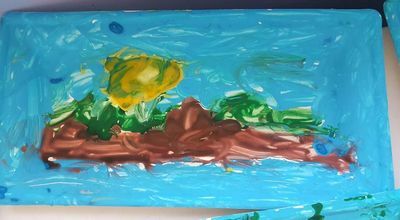 ,Grace Hwang Lynch, explained this concept well in, "The Importance of Art in Child Development." ​Language Development: For very young children, making art—or just talking about it—provides opportunities to learn words for colors, shapes and actions. When toddlers are as young as a year old, parents can do simple activities such as crumpling up paper and calling it a “ball.” By elementary school, students can use descriptive words to discuss their own creations or to talk about what feelings are elicited when they see different styles of artwork. 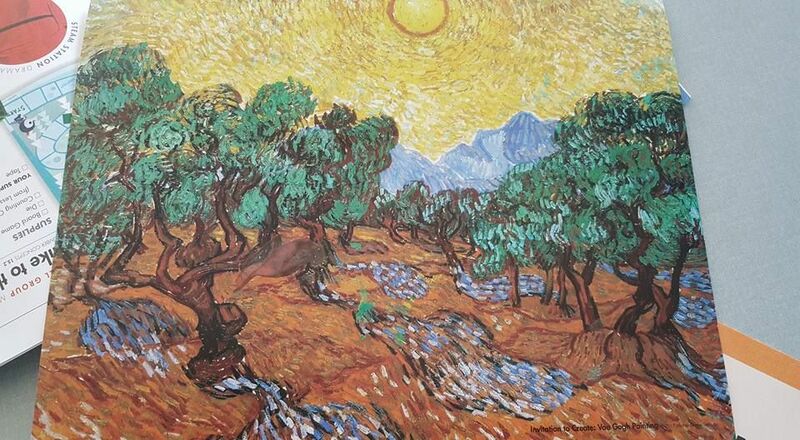 ​Improved Academic Performance: Studies show that there is a correlation between art and other achievement. 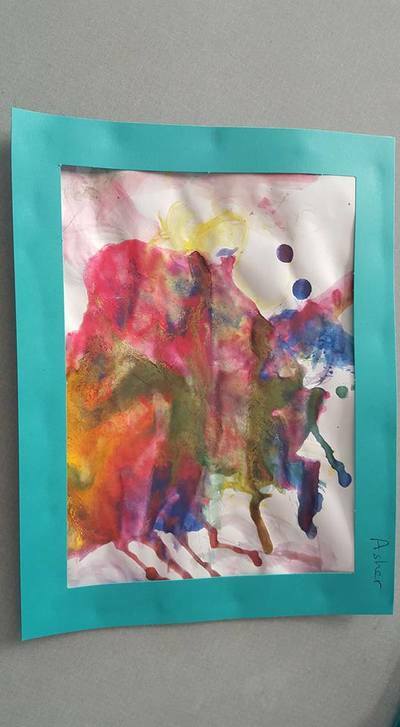 A report by Americans for the Arts states that young people who participate regularly in the arts (three hours a day on three days each week through one full year) are four times more likely to be recognized for academic achievement, to participate in a math and science fair or to win an award for writing an essay or poem than children who do not participate." 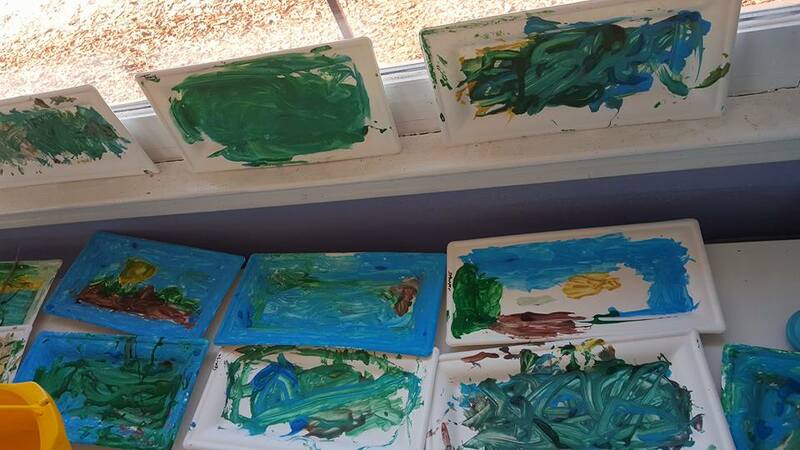 As you can see from the variations of interpretations and level of development each child has a unique masterpiece. 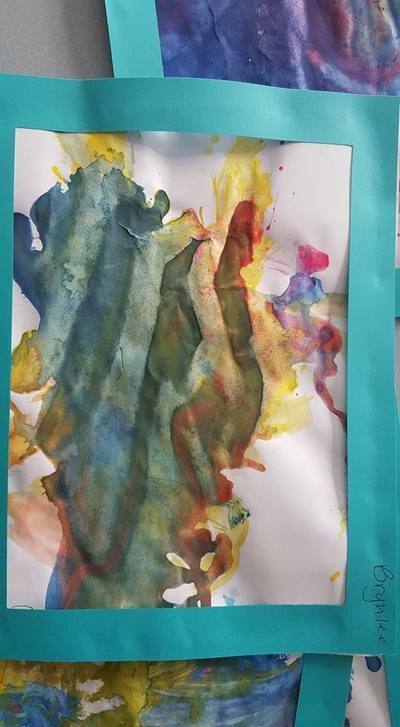 These went home with smiles and compliments and were a grand addition to many art walls and refrigerators. We love providing the time and freedom to allow our students to experience the Fine Arts and recreate what is in their own hearts and minds. 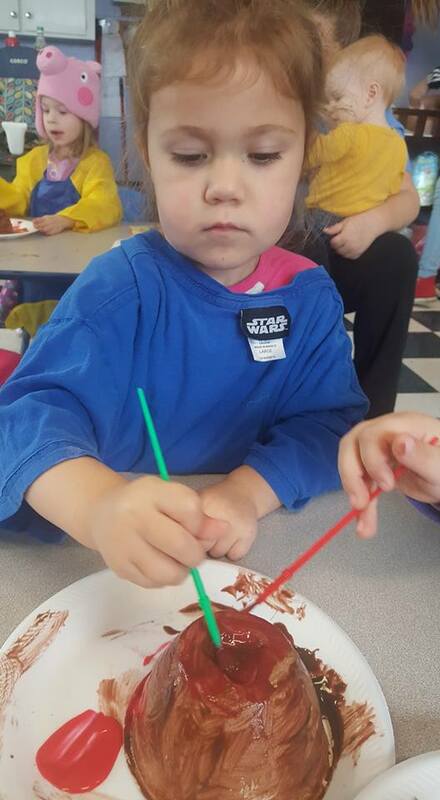 All in a day of play at Woolsey Academy. 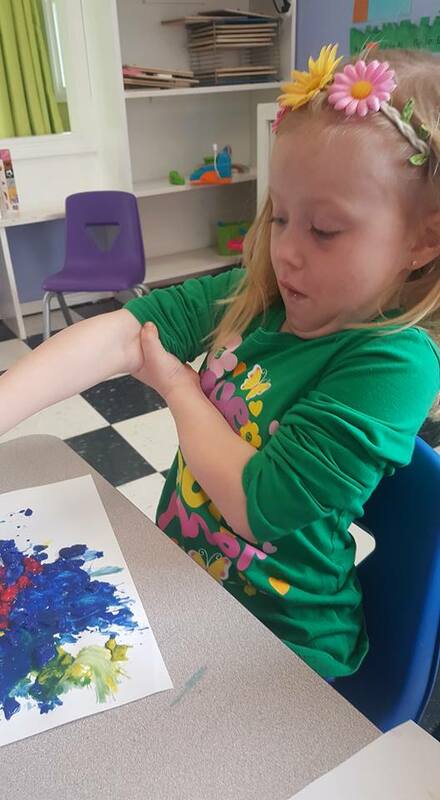 One of our sweet students excitedly observing that her paint is mixing as it melts and swirls! Our children LOVE our daily routines with Mother Goose Time. From stories to science to Fine Arts, we are greeted each day to our student's questions, "What are we going to do today?" "What are we making today?" "uniquely weaves 33 research-based skills into playful games and discovery projects. 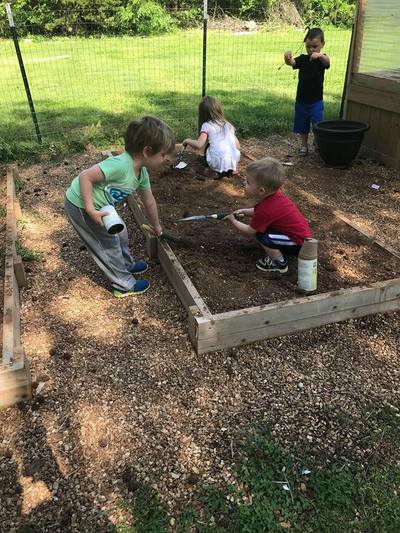 .The cross-disciplinary model supports a child’s on-going social-emotional, physical, language and cognitive development." 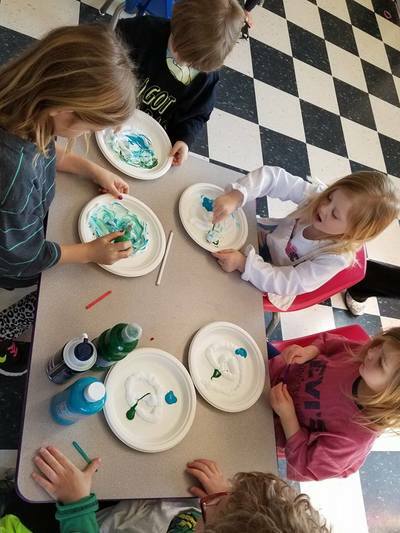 In December we get to discover "Winter Wonderland" and our first week was FULL of freezing and melting! 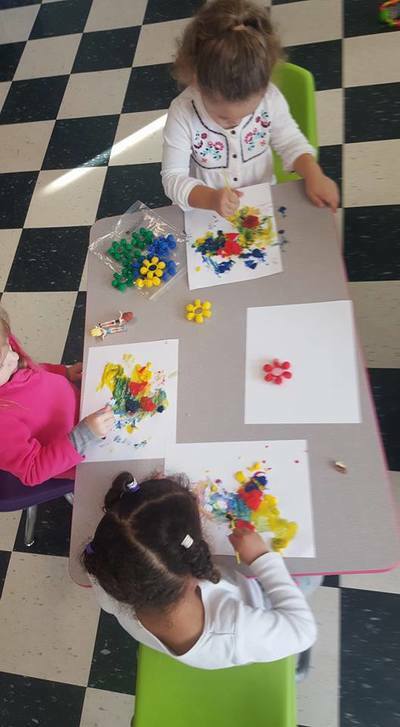 Young children greatly benefit from discovery and being allowed to make their own unique observations through a variety of mediums. 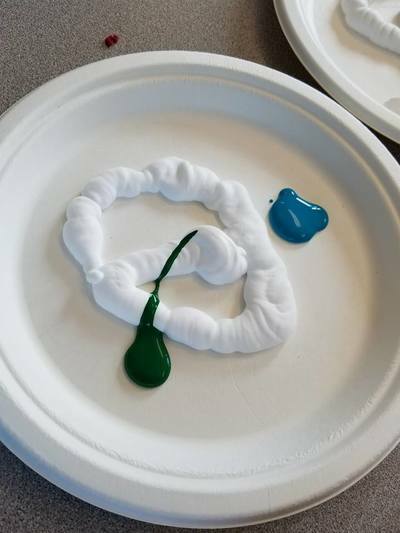 To which I followed up with exploration and observation questions like, "WOW! What is your paint doing!?" "Ms. Donna, I see PURPLE!!!" We rightfully framed the beautiful masterpieces that our endearing artists created to give them their proper significance. The S.T.E.A.M. 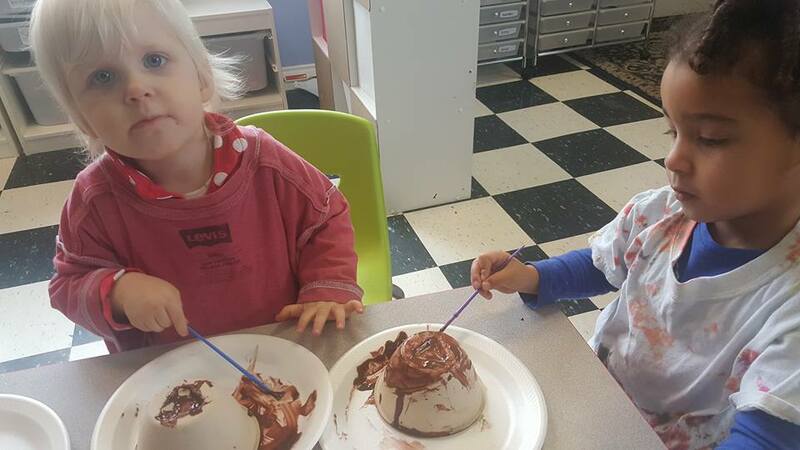 process experienced provided our little learners with invaluable opportunities to extend art and science into play as we, "support children in their exploration by creating an environment that promotes observation, exploration and explanation, asking open-ended questions such as 'What do you think might happen?' or 'What do you see happening?'." These types of activities are vital to developing, "strategies for active exploration, thinking and reasoning and develop working theories for making sense of the natural, social, physical and material worlds around them." 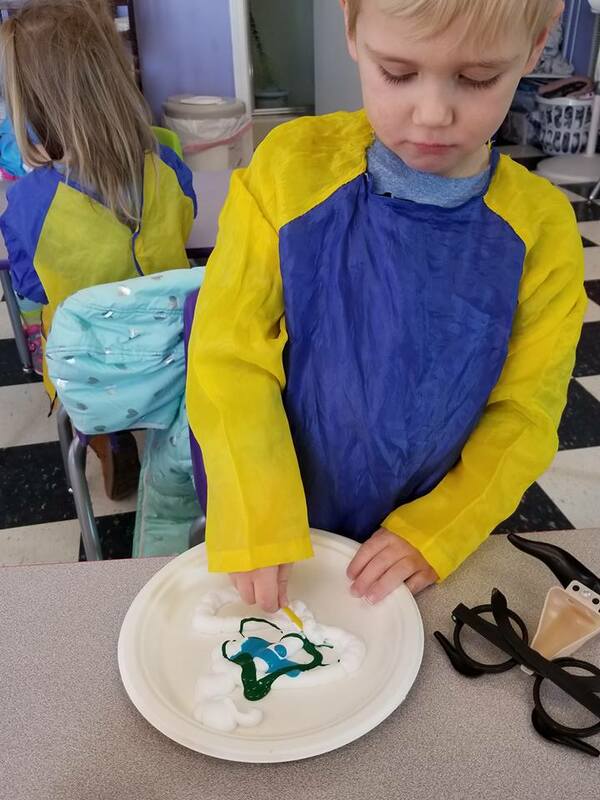 This was just one example of many experienced in our week of Freezing and Melting at Woolsey Academy! This little piggy went to market....this little piggy stayed home! We began our day with these sweet little piggies counting, "1, 2, 3, 4, 5!" as we poked and punched them out of their frames courtesy of Mother Goose Time! We laid them in rows. 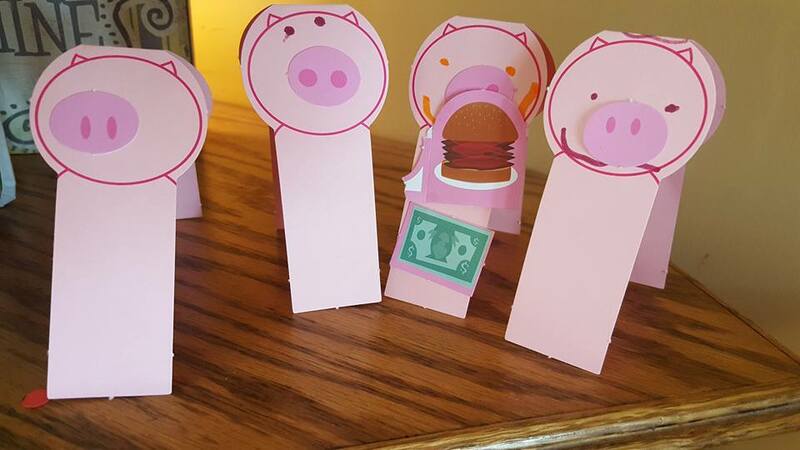 We folded them and gave them little frowns, smiles, angry, and scared faces as we discussed the piggies journey from market, to home, to the dinner table and the piggie that was so, so sad because he had nothing to eat! We discussed what we would do to help our friends if we had something yummy or going to the store and our friends were sad. We decided that sharing our meal and asking mommy or daddy if our friends could come along would make our dinnertime and our shopping trips even more fun! 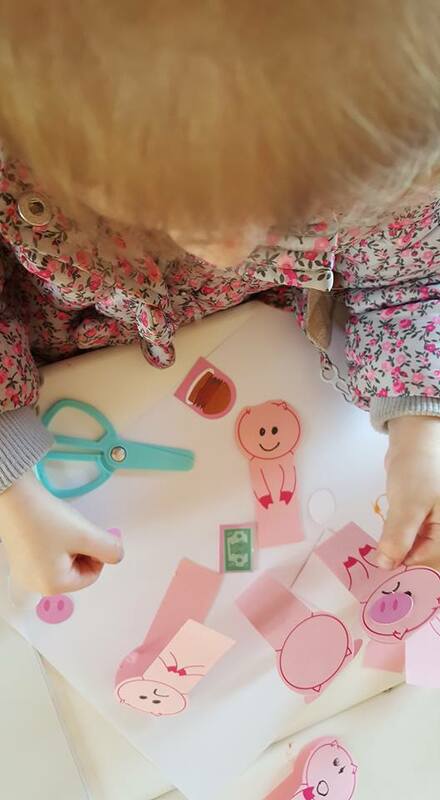 As they gave their little pigs emotions and words, I gave them time to retell their stories, their way. I gave them time to pretend and play, to invent and dream up knew scenarios. 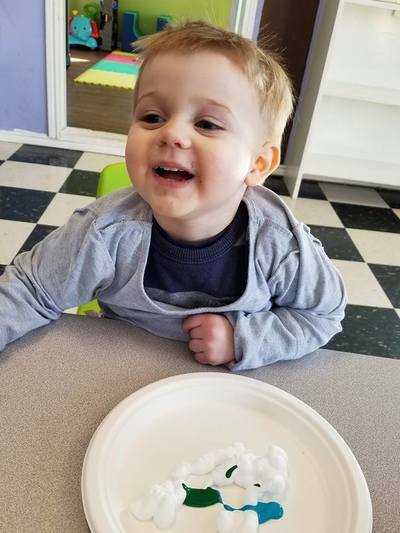 Retelling a story with props is a developmental milestone and a very important skill that preschool children need as stepping toward reading readiness. Utilizing well known and easy to obtain stories such as Nursery Rhymes helps small children with recall and helps them to connect their learning day with their family experiences at home. 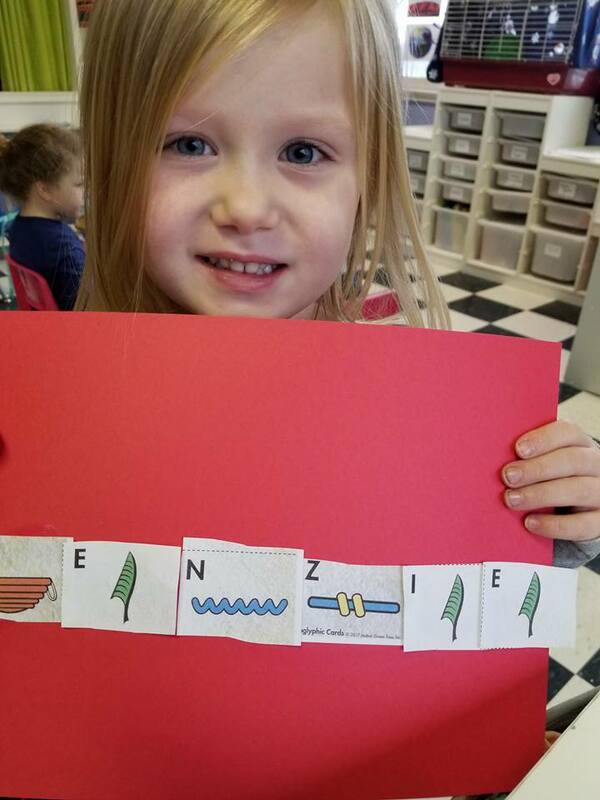 ​"Children learn through retelling a story. The magnetic quality of storytelling is the universal power to remember, entertain, inspire, create, and know—a personal process that connects to the language of the children. 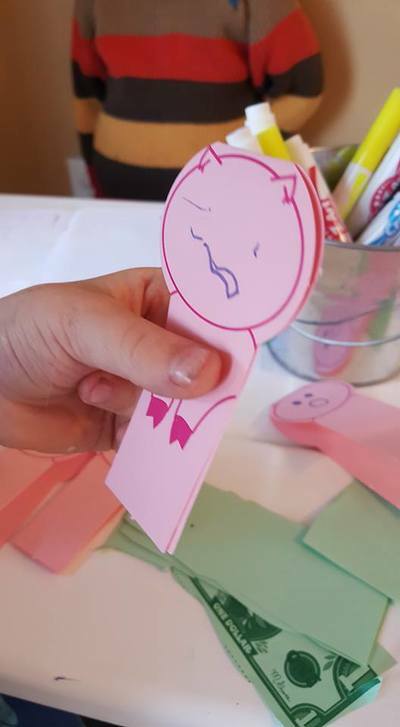 Drawing children into the telling actively engages the listeners, creating a shared experience that bonds the teller and listeners. This co-creation is very different from the story viewing young children frequently experience in today’s high-tech world. (28 www.naeyc.org/yc n Young Children • March 2002 2001)). 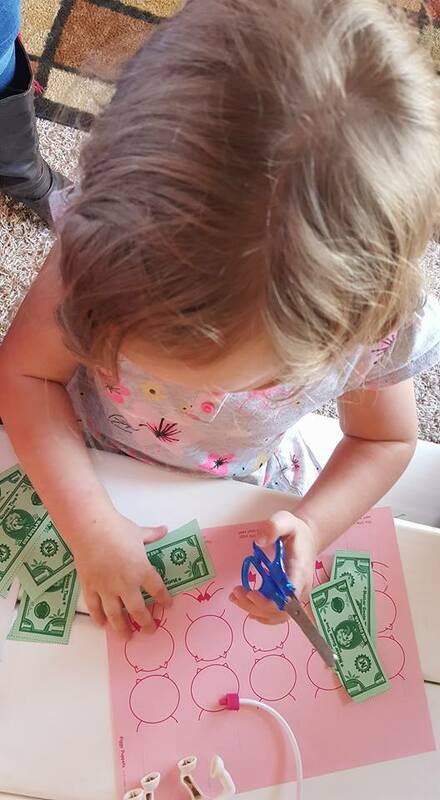 We practiced our fine motor skills cutting money for the piggies to go to the market with, then our money counting skills by counting each "dollar" one at a time. 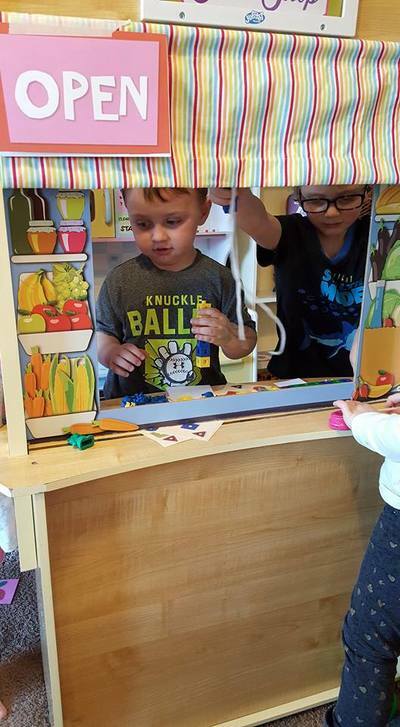 We added and subtracted by purchasing "roast beef", bananas, apples, baby clothes, and many other items at our market! We took turns being the shop owner, cashier, and buyer. We shopped, made decisions on purchases based on how much money we had in hand and how much items cost. 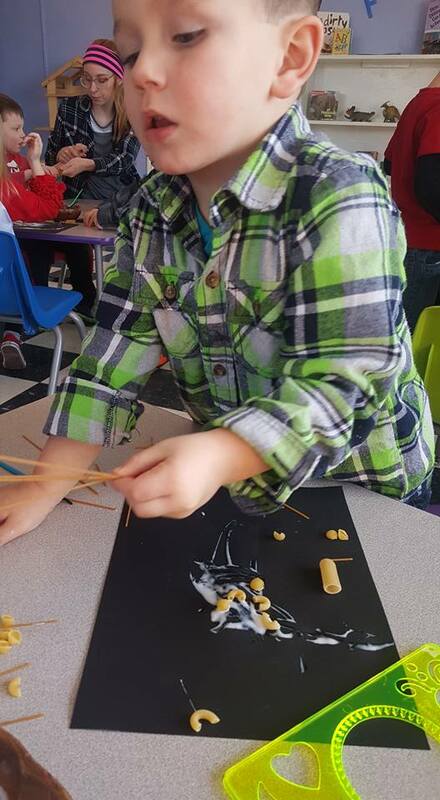 This was all wrapped up in teacher supported play. I helped them as they needed assistance with adding and subtracting. It prompted conversations about how much we could purchase and items we should save for another day. 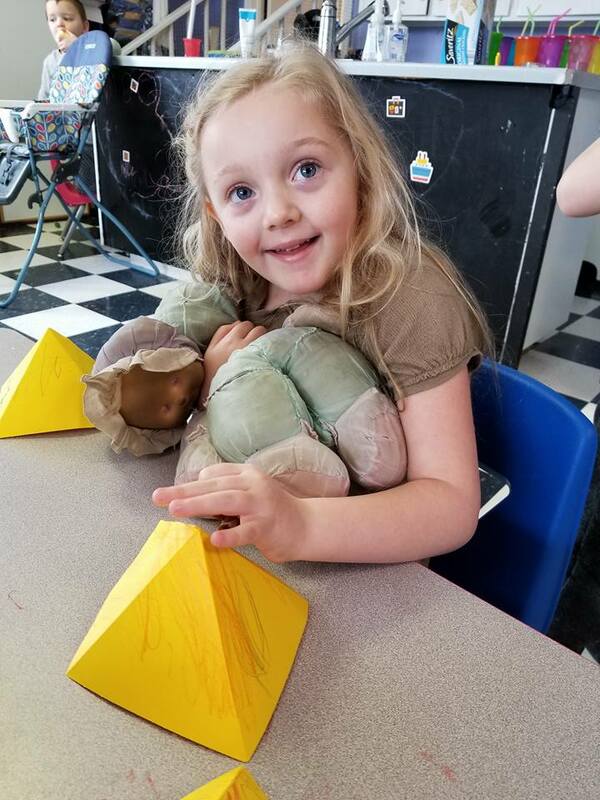 These social/emotional and math skills were all powered by P.L.A.Y!! What a great way to promote S.T.E.M. in real time, child led, teacher supported moments! 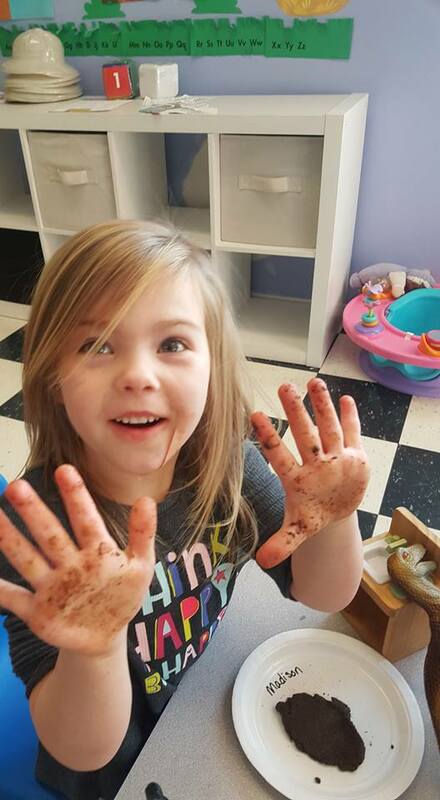 Each day during our morning rituals the preschooler's ask, "Let's do something fun today!" I say, "What would you like to do?" 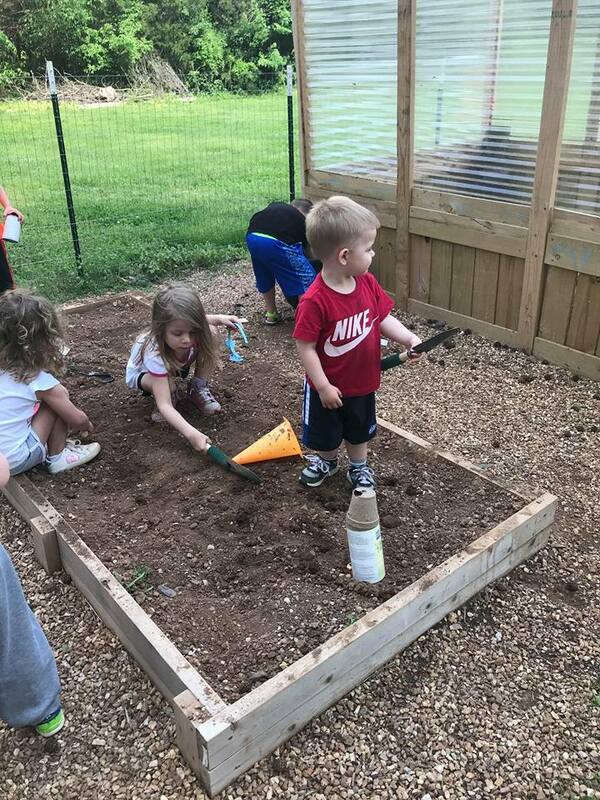 They run to that magic box and start digging. Packages and papers flying, experiments, loose parts, yarns, ribbons, paint brushes and books scatter until they land on it, "THIS!" "We want to do THIS!" There are squeals and hustle as we open packages and assemble the plans. We observe. We discuss. We hypothesize. "So what will we need to do this?" I ask. They think and plan... "We will need....." and the planning and gathering turns into a process. The process turns into progress and before we know it we have a full day of play ahead. I love their excitement. I love that they know I will help them accomplish anything they can imagine. I love it when holidays roll around and they are beaming to make hearts or clovers or Christmas trees. 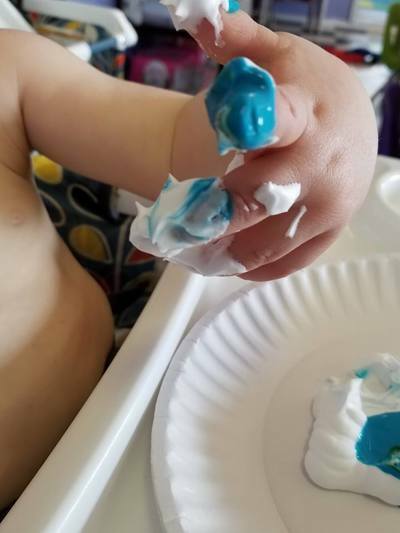 ​There's nothing better than the twinkle of tiny eyes and paint covered hands. 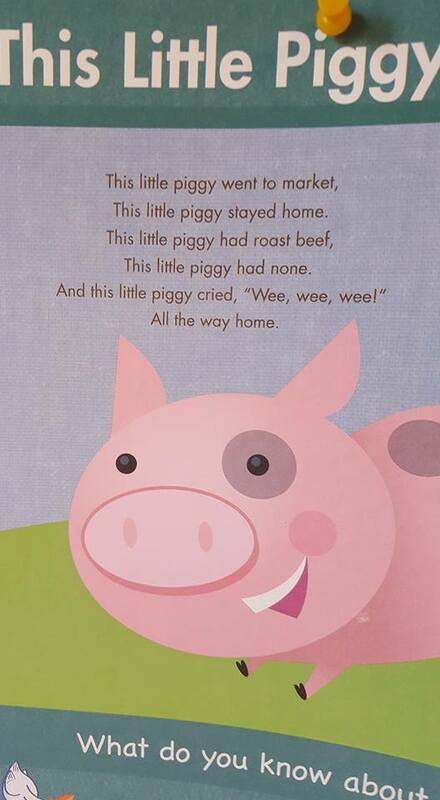 Most of my little one's know many of the nursery rhymes we are covering. Today was Hickory, Dickory Dock! 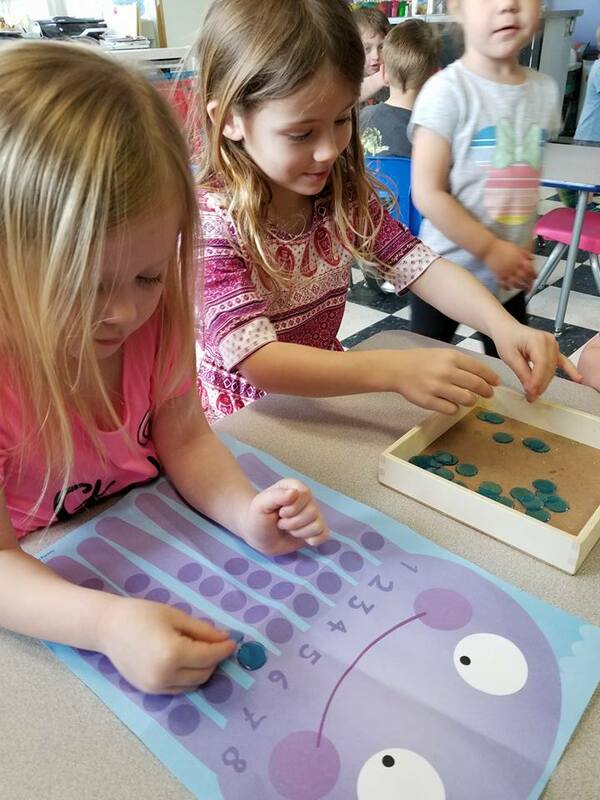 This clock game is one of my favorite new math games from Mother Goose Time! "Why isn't the number 1 at the top? "Where is the zero?" After explaining that clock numbers go in a circle we practiced walking around numbers we placed on the floor. Like little mice we scampered around and around. We then allowed the 2's to continue this active, gross motor play while the older 3's and 4's played the game. In this game they had to practice their social/emotional skills of turn taking, waiting patiently, and politely saying, "Your turn _______" if their friend becomes distracted and forget whose turn it was. These skills are, in my opinion, even more important than the number recognition and counting practice they are receiving by playing this game. This is just another reason why I LOVE games that teach. 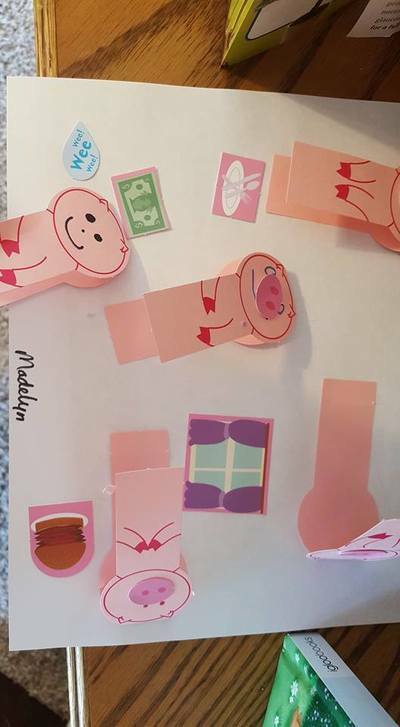 They can be "teaching" letters, counting, sequencing, that cows pass gas for heaven's sake, I don't care! 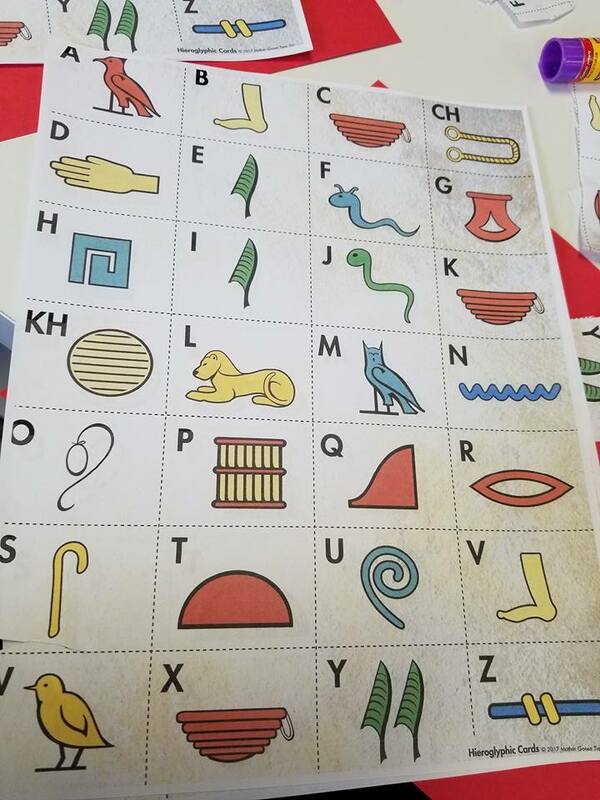 What they are actually teaching a child in regards to his or her social/emotional development FAR outweighs being able to recognize a lower case "r" or that 13 come after 12. 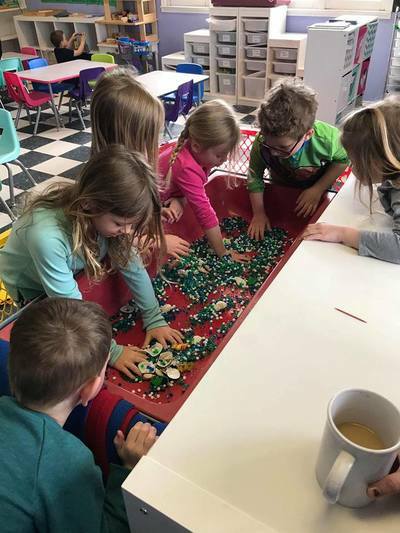 They are teaching patience, persistence, perseverance, taking turns, and that sometimes we win and sometimes we do not, but that we all get to play together. 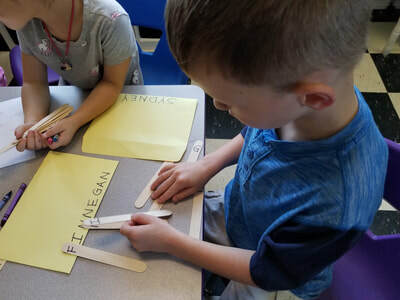 This article in ChalkBeat discusses the psychology behind self-regulation and the vital importance and superiority it holds over Kindergarten entrance math or reading levels. 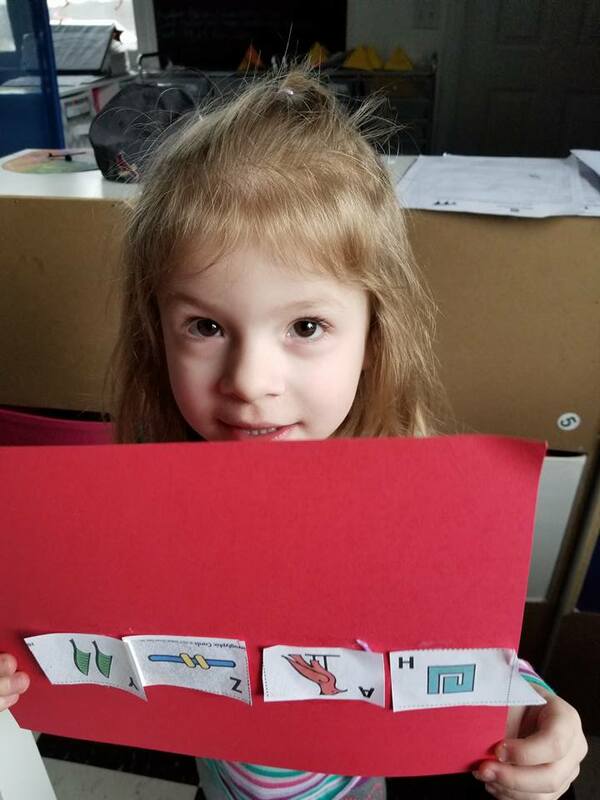 "In psychology, this lack of self-regulation is referred to as “executive function.” Research shows that executive function is a better indicator of academic success than IQ or entry-level reading or math skills. 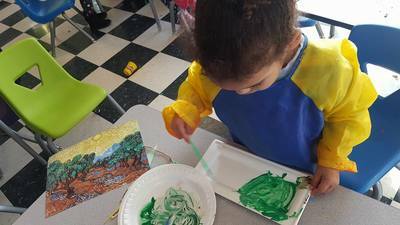 Anecdotal evidence suggests that a quarter of all children don’t have the skills they need to learn. Forty-six percent of kindergarten teachers reported in one study that more half of their children did not have sufficient levels of self-regulation. Another study of Head Start classrooms found problems with self-regulation, such as kicking or threatening others, occurred once a day for 40 percent of students. There is, however, a silver lining: executive function capabilities can be altered quickly if caught and changed early enough. The problem is, parents are regulating their children instead of teaching their children how to get control of themselves. Praise doesn’t increase kids’ achievement It has been a long-standing belief of psychologists and parents that praise was an important motivational factor for promoting achievement. In fact, this type of nurturing based on constant praise is actually more likely to create children who are willing to cheat to get by. 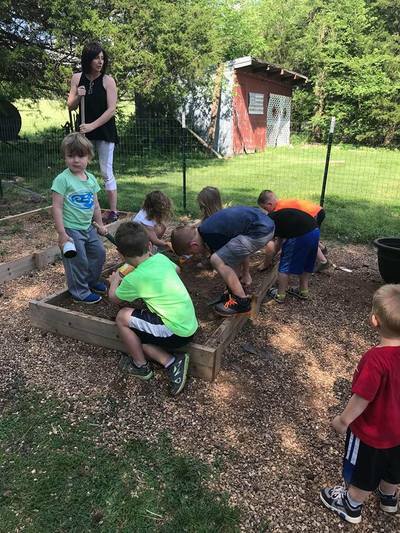 “It instills in them the idea that had they prepared well enough, or tried hard enough, they could have succeeded, rather than risk being told they have failed or that they aren’t smart,” said Merryman. We are robbing our kids’ sleep Today’s generation of children get one hour of sleep less than children did 30 years ago, and the effects of this are just now beginning to be realized. New research has tied this sleep loss to numerous problems facing today’s children including ADHD, behavior problems, academic problems and even child obesity. 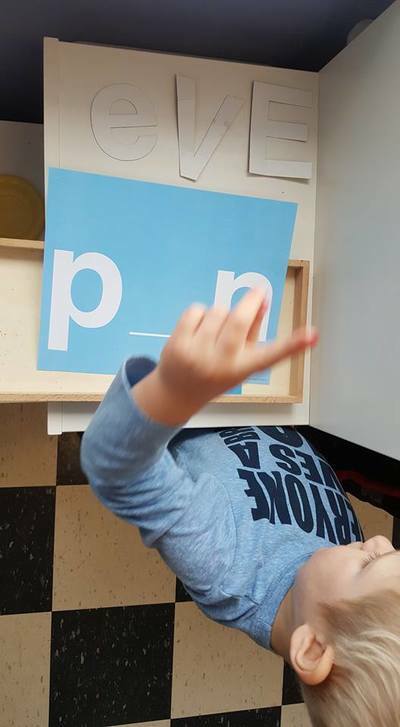 The role parents play Kids playtime has diminished as parents have put an emphasis on teaching letters and numbers, according to Leong. She also pointed out that children are in very segregated age groups and don’t have much interaction with older children who can be mentors of play and learning for younger children. This leads to lessons taking three or four times longer to teach to children because they literally have to learn to play again. 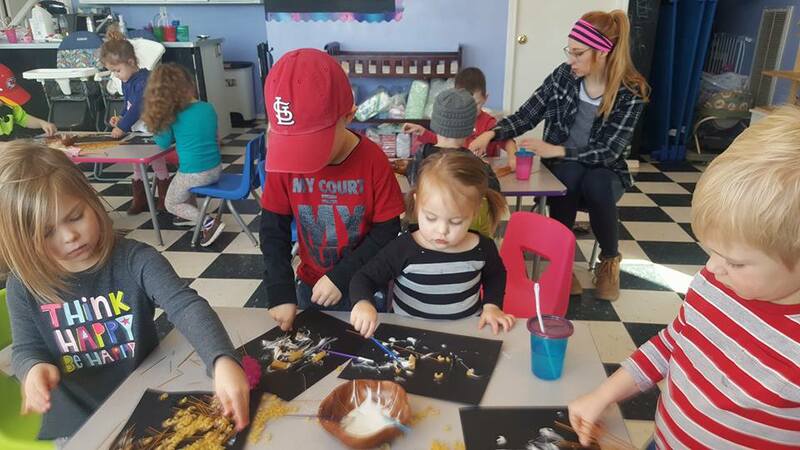 Parents can learn to be creative with learning opportunities that pop up while cooking, shopping, or running errands. 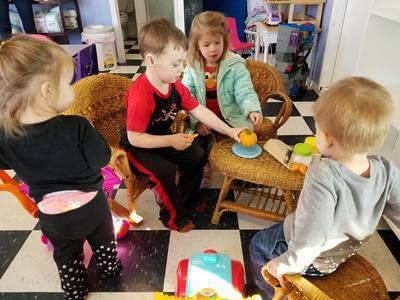 “We put our kids in situations where they are isolated from real life, which is easier for parents in some cases. Parents spend a lot of time trying to keep their kids occupied rather than seeing these as opportunities to teach their children about real life,” said Leong. 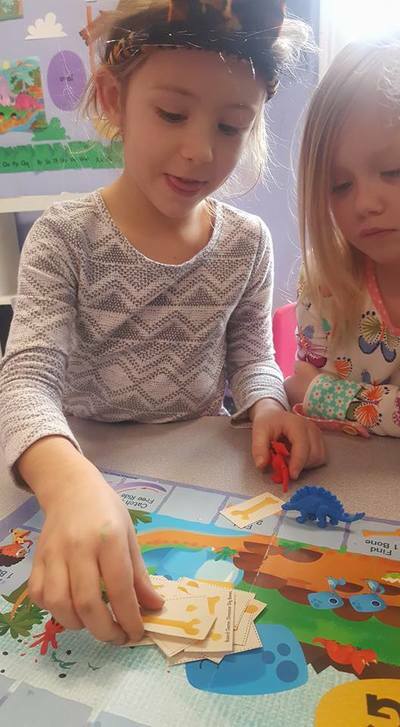 The skill of self-regulation is a teachable, not an inherent skill and allowing children the time to experience conflict, decision making, and turn taking with the use of games that have predictable as well as non-predictable outcomes is vital to their academic success which translates well into their adult years. So for you and all the little ones in our lives, I wish you well and I hope you play today!! 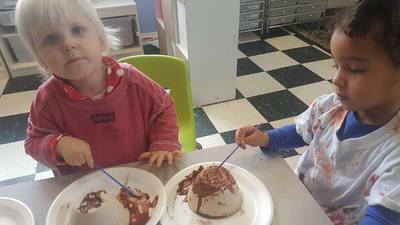 What it means to have an "inclusive" childcare. This term used to mean "everyone gets a turn at kickball," or "we all get to have our names on the clubhouse wall." It still does, just in a different way. It now means everyone. EVERYONE. 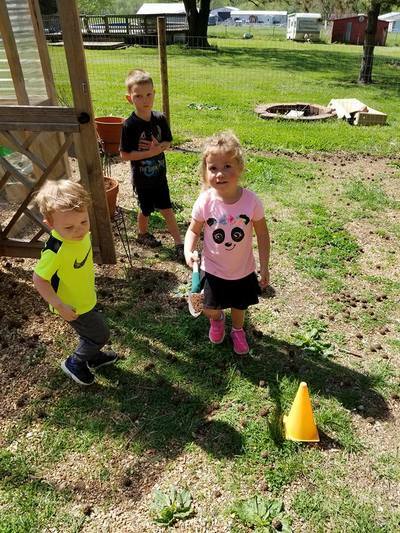 The 10 year old with a wheelchair, the 2 year old with a speech or hearing impairment, the 5 year old with an SPD (Sensory Processing Disorder for those that don't know.). 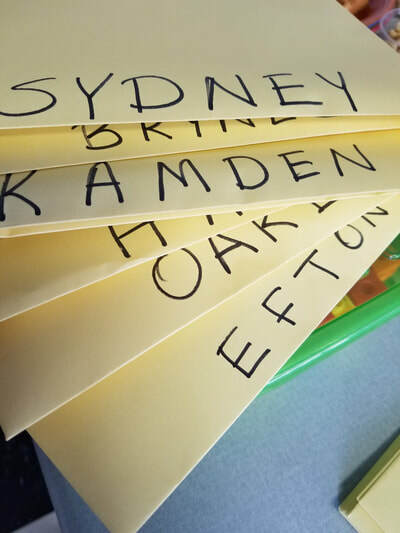 It means we include everyone's names in our classrooms, our childcare's and our preschools. But what does it look like? 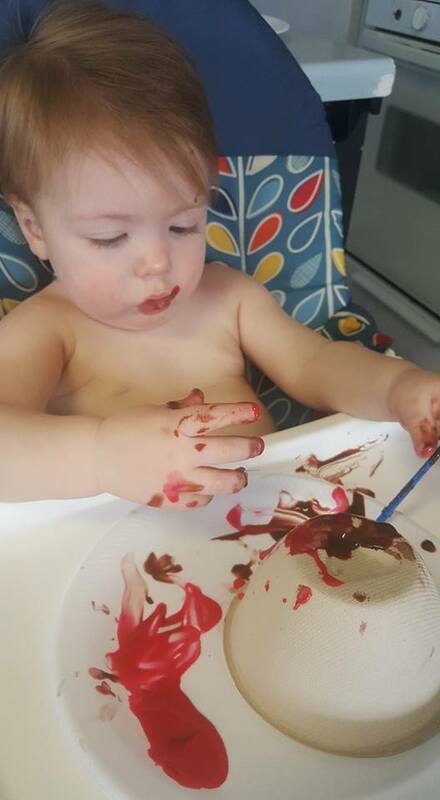 There are days when the child that has an SPD and is VERY sensitive to sounds, textures, or activity levels comes up with a new game or method of doing an art project that suits him personally, because finger painting literally makes him throw up (I mean projectile!). It is an incredible moment to be part of. 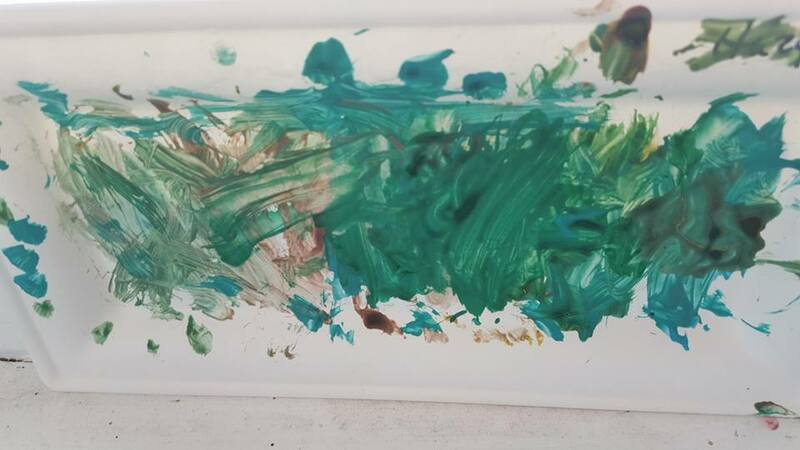 I stand awestruck as my little one on the "Spectrum" and non-verbal grabs a nearby car so he too can join in the painting. He came up with it himself!! This is big. BIG! 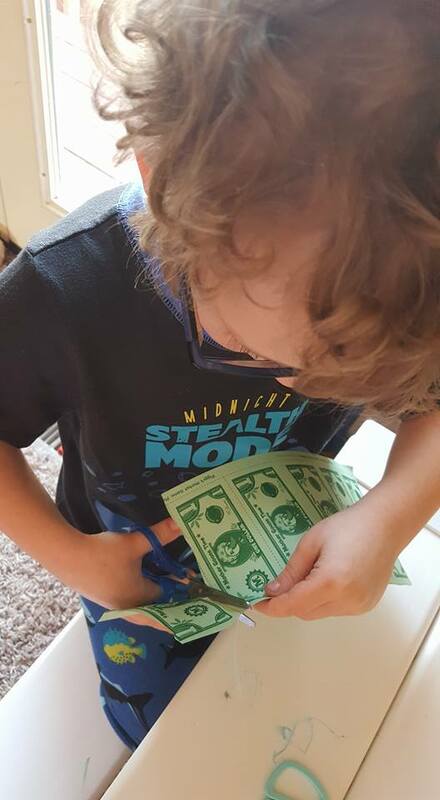 It means he understands his own needs. He desires to take part. He is making a way. It is progress toward independence and it is beautiful. I type with tears in my eyes just recalling the moment. Lord, help me there are days. 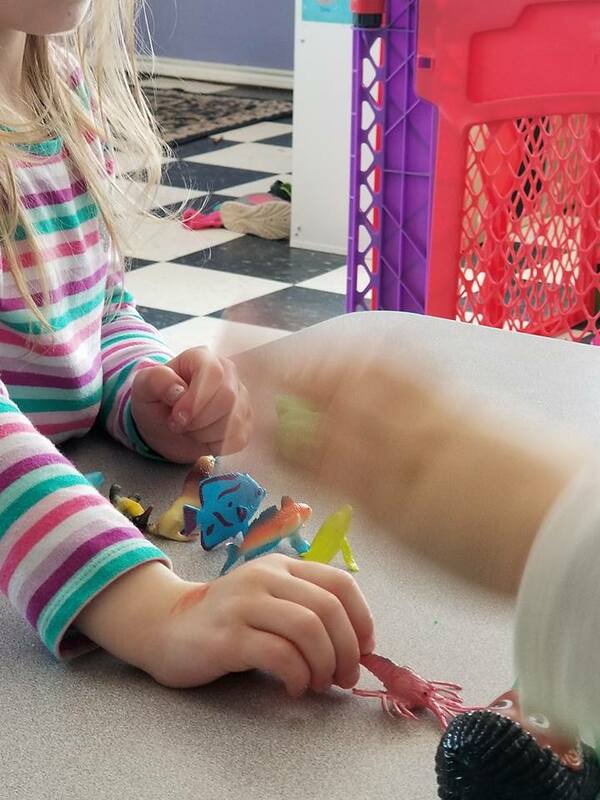 Days when my two little ones with SPD's of varying degrees plus my little on the "spectrum" are feeding off of on another's energy like the monster from Scooby Doo. You remember the one. The gang tries to zap it, catch it, feed it, starve it out. NO MATTER WHAT THEY DO IT GROWS BIGGER, and BIGGER, and BIGGER!! 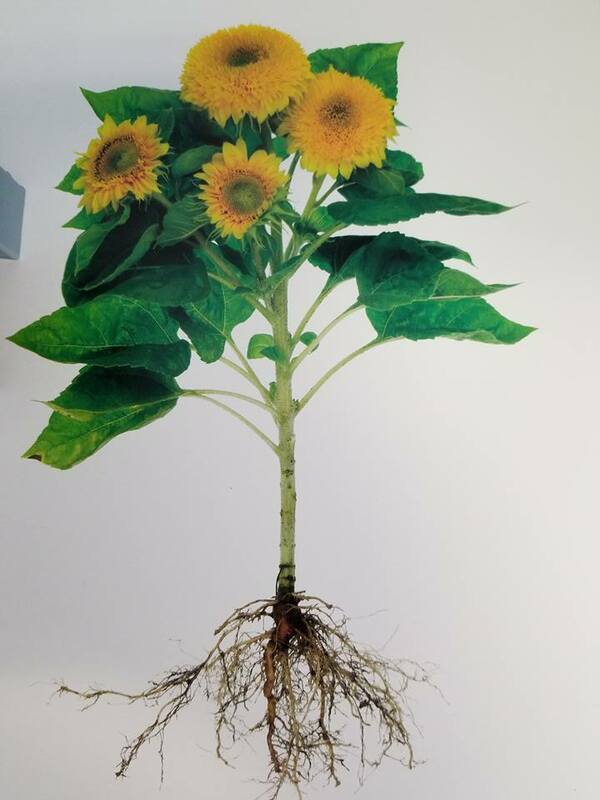 Any amount of energy in themselves or the environment makes it grow. These are also the days we can't go outside because the wind chill is zero. These are days when parents pick up their children and I have to wonder if they think I am losing my mind!! These are the days when I feel like I just might be! Then I research. I read. I pray. I reflect. I remember the good times. I recall the magical moments. I welcome a new day. Who knows what it will bring? It is o.k. for parents picking up to see the good moments and the bad. They have them at home too. We are all in the same boat. In those moments they get to witness, first hand, that Ms. Donna won't duct tape them to a wall. I may chase, use my "firm" voice, even hold one on my hip and one by the hand to keep them from literally climbing a wall and jumping from the trim (I have one that can do this, no joke). And we will come out of it. We will all survive together. 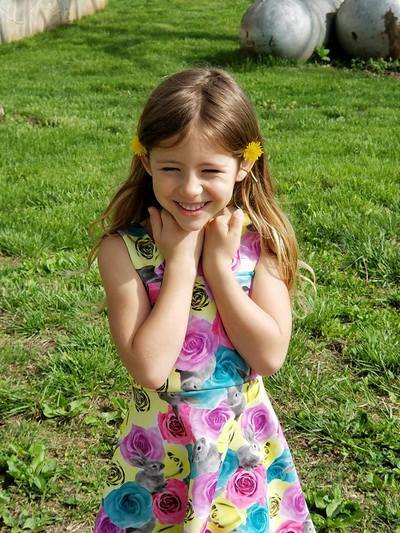 It is good for children to see other children not being "happy" at all times and know that everything will turn out o.k. We get through it together; the tantrums, tears, meltdowns, crazy, excited times. We do it all TOGETHER because we are a family. When one of us hurt, we all hurt. When one is happy, we are all happy. 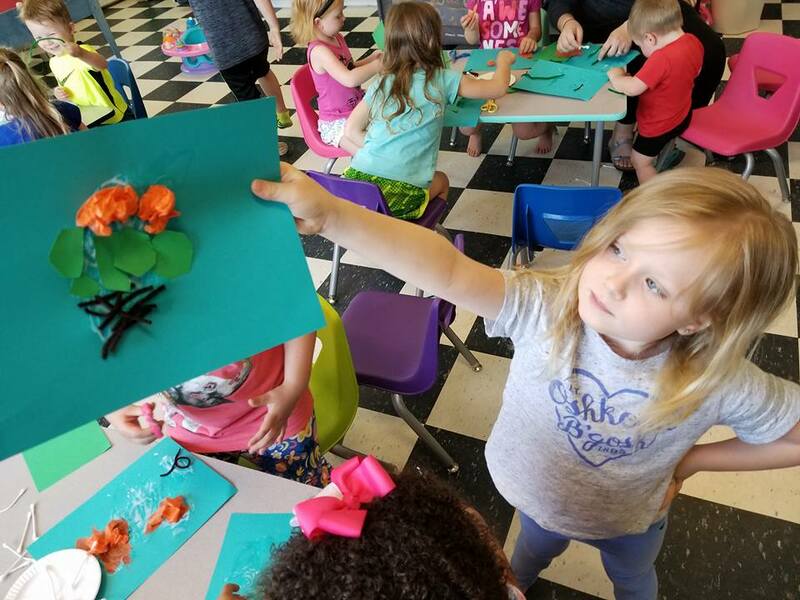 We celebrate, grow, and learn together. But what about the times we have to say goodbye? 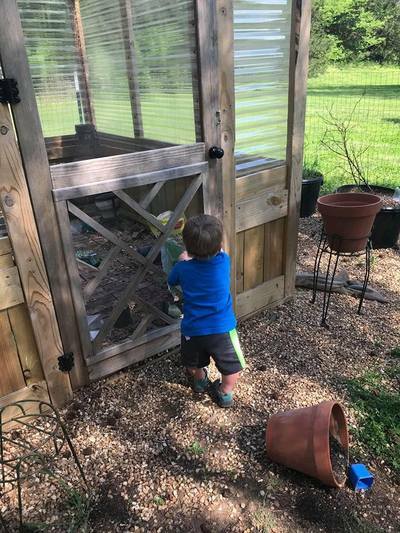 Those days when we realize that a little one's needs exceed our ability to maintain a safe environment or maintain safety for that one child or their friends? 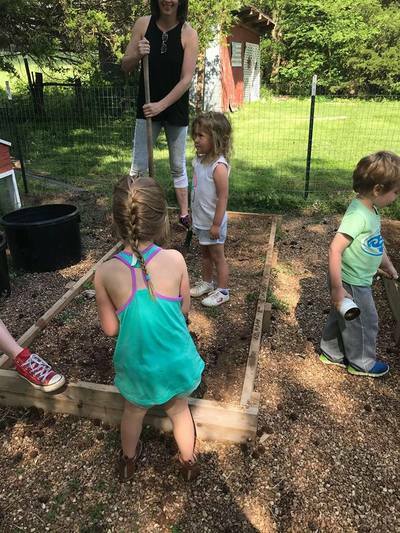 Those days are the most challenging in my role as Childcare Provider, parent advocate and friend, "day-mom," because you know what? I grow to love each and every child that crosses my path. I pray for them. I think about them. I research on their behalf. I study. I read. I try what the experts say, "This works everytime!" (and then it doesn'.t). I realize that it isn't providing lasting effects for a child. I stress, have headaches, and morn decisions that mean we will no longer be able to be part of that child's life on a daily basis. I dream about that child. I dream for that child. My heart aches when circumstances or challenges or job statuses mean that a child will be leaving us. Why? Because we are family and it's hard to say goodbye. So, I say, "See you soon." I say, "We love you." I say, "I wish you well." 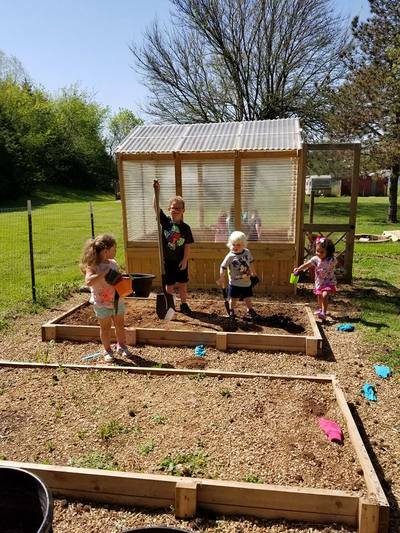 The hard truth is that not every teacher, classroom, environment, or school is going to be able to meet the needs of each child. Sometimes progress comes from change. 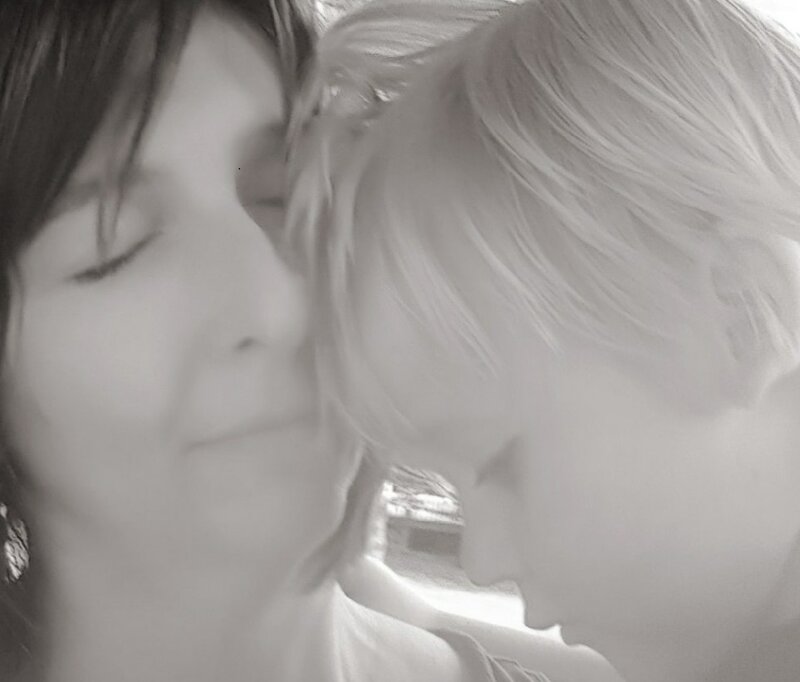 Sometimes it means hard conversations with tears, doctor after doctor visits for little ones looking for answers, and holding a mama's hand when she is at the end of her rope and saying, "I see you. You are amazing. You are strong." Isn't that what matters most, being there for each other in the changes, the challenges, the easy times and the crazy ones even when you don't have the answers, especially when you don't have the answers just so they aren't alone? I wish bubbles and suckers made everything o.k., don't you? When the trucks come rolling in! I am incredibly blessed by the families of the children in my care!!! They are the MOST supportive, wonderful people I have ever known. Each year when the "big kids" move to school and a fresh batch of beaming new faces begin, it's the same. Maybe it's the community, maybe I am simply lucky, maybe it's God's hand of blessing on my life. Whatever it is, I know it's amazing and I LOVE it!! This day was just another bit of proof of how incredible they are. 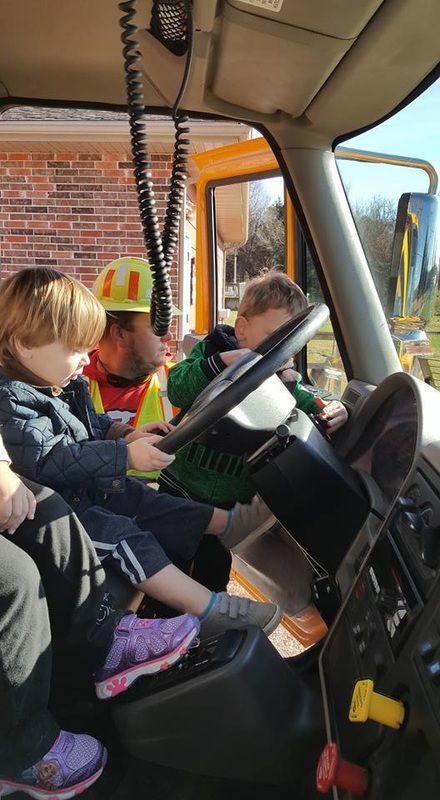 During our Community Helpers thematic unit from Mother Goose Time throughout the month of November, we were introduced to MANY Community Helpers. We discussed the Postman (lady), Nurses, Doctors, Sanitation Workers, Teachers, Construction Workers, Factory Workers, and on and on. For the entire month each day was fresh and new, yet all circled back around to those great folks we see in our community making a positive difference each day. Today was EXTRA special because one of our very own daddies drive this big rig!! 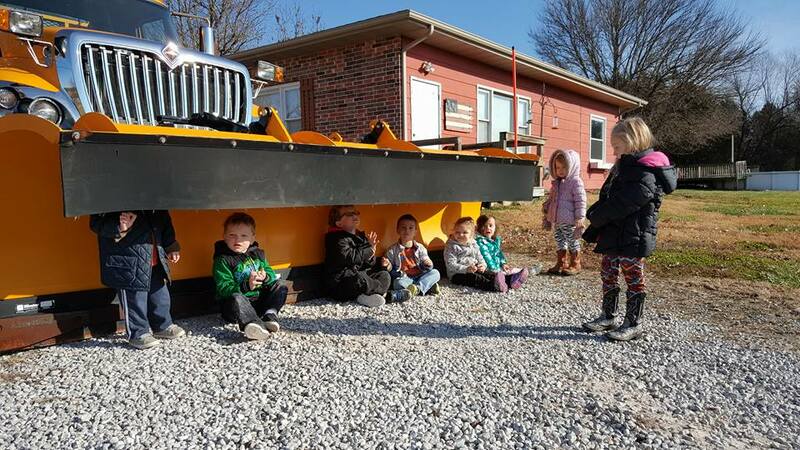 Mr. Scott Williams with MoDOT was given special permission to bring a great, big, shiny snowplow for us to climb on, get inside, and explore!!! ​We climbed under the plow! We noticed that we are small and it is VERY BIG! We then inspected the tires. We touched the black surface that was smooth and rough all at the same time. We noticed that it was warm, unlike the yellow metal and commented on the sunshine that was making it a different temperature. 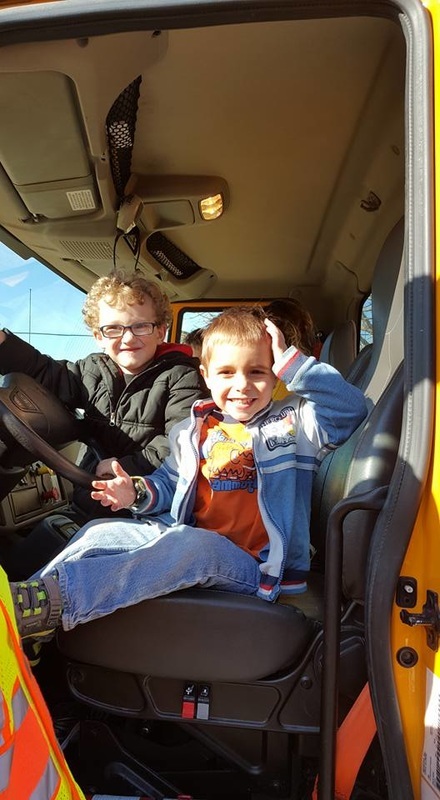 The most beloved feature of this big rig were all the buttons, horns, levers, and pulls. We were allowed to experience almost every square inch under the watchful eye of Mr. and Mrs. Williams. They helped us reach high and low as they left no button unpushed!!! When our visit was coming to a close and we had asked every question on a four year old's mind (believe me that's A LOT!!) we received the coolest pencils EVER!!! We wasted no time finding things to "fix" and "hammer" with these beauties!! 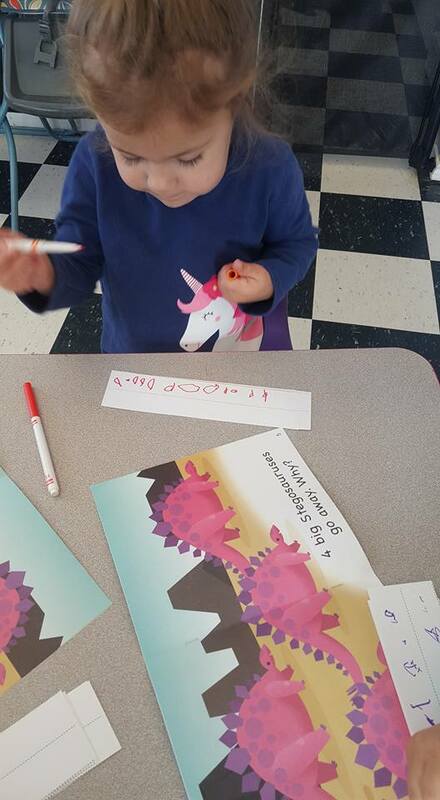 Each child took one home along with a "Traveling Safely with Mo" coloring and early reader workbook. We waived and hugged goodbye to the big yellow snowplow as we watched it drive up the lane to a great big, "HOOOOOOooooooooNNNNNNkkkkkk!!!" 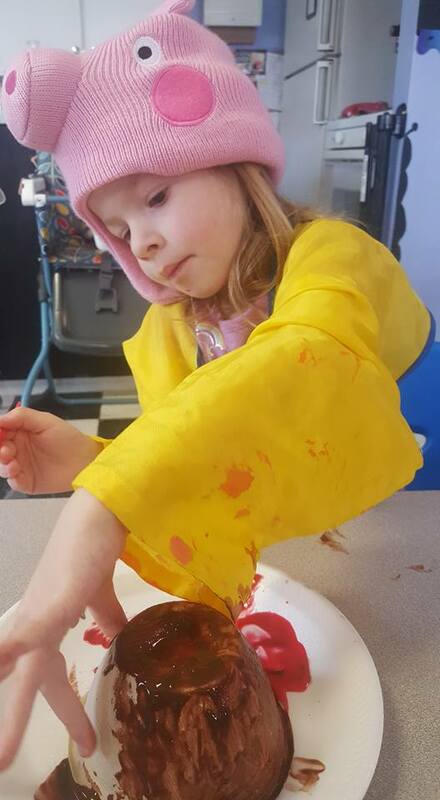 What a special treat, incredible learning experience and all around great day of learning and play at Woolsey Academy for Young Learners!! A special, "THANK YOU!!" to the Missouri Department of Transportation, Mr. and Mrs. Scott Williams, and all the amazing men and women that work to keep us traveling safely on the roads in Missouri! !